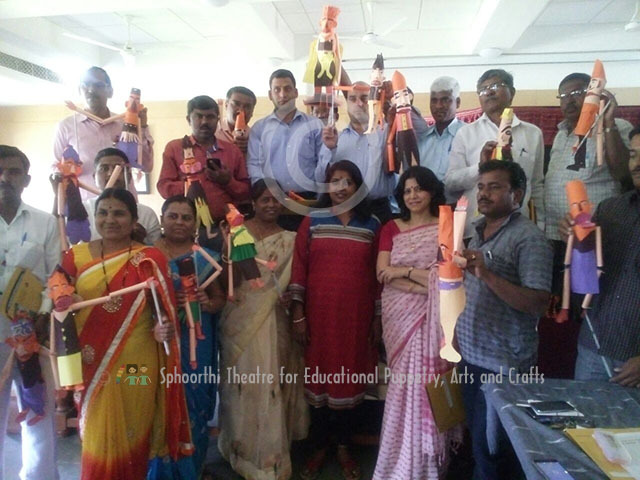 Coverage by SAKSHI the Telugu daily on Puppet Making workshop and Dappu Nagara performance and Workshop held at Chitramayee Telangana State Gallery of Arts, Kavuri Hills, Madhapur, Hyderabad on Dec 11, 2017 for Telangana State Social Welfare Board Schools from Hyderabad Districts. 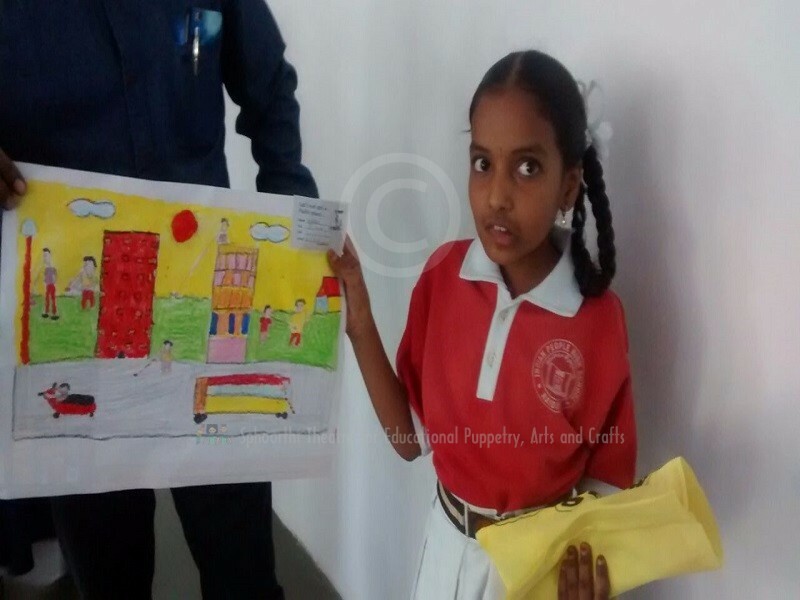 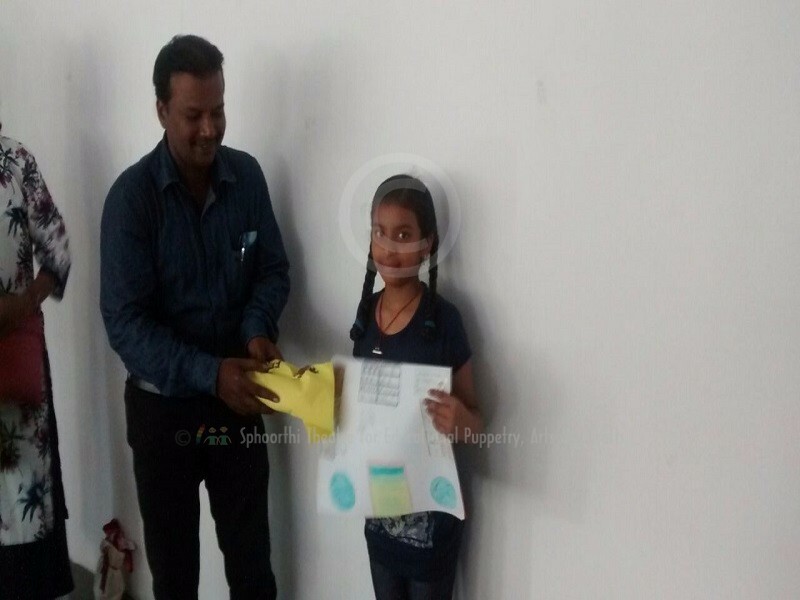 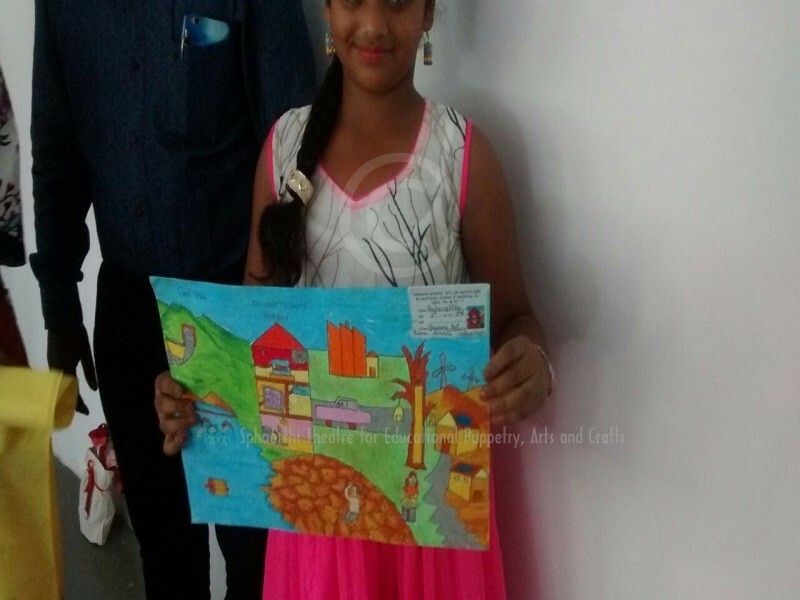 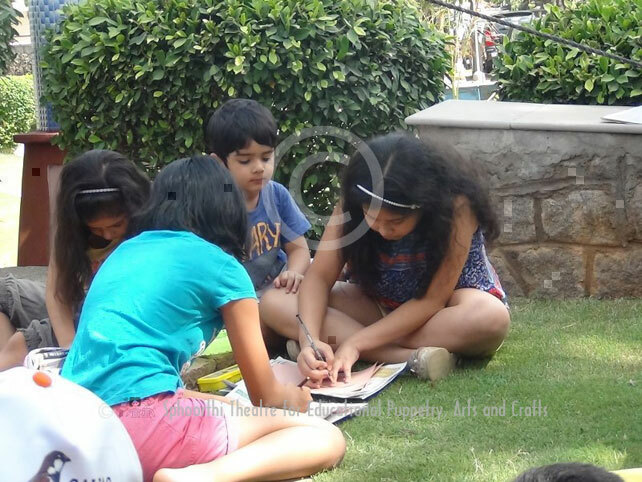 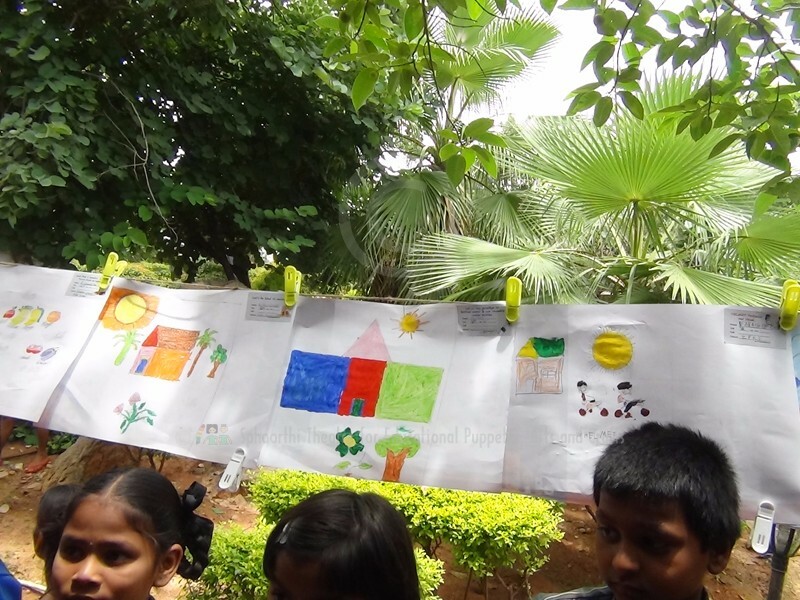 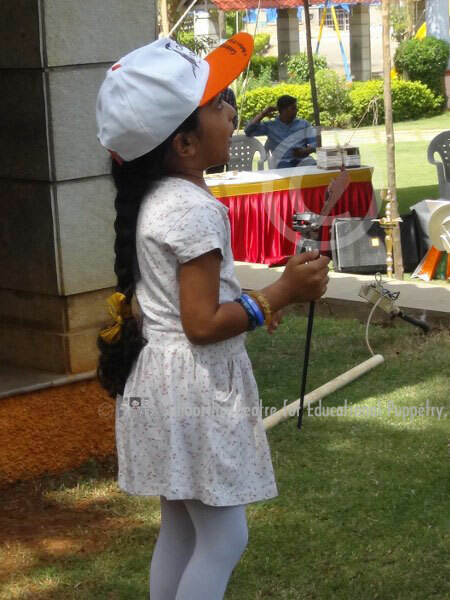 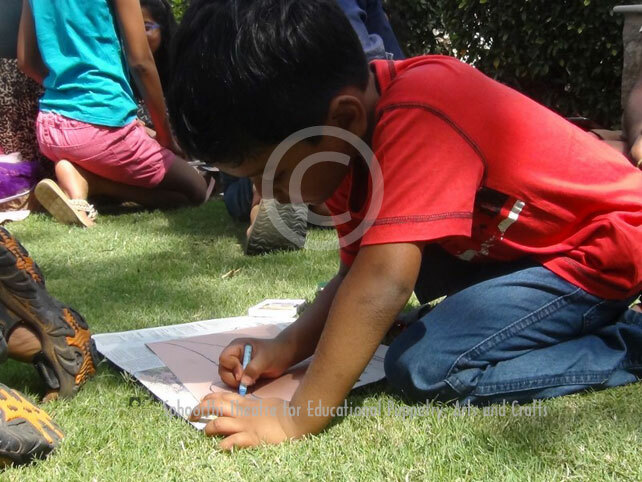 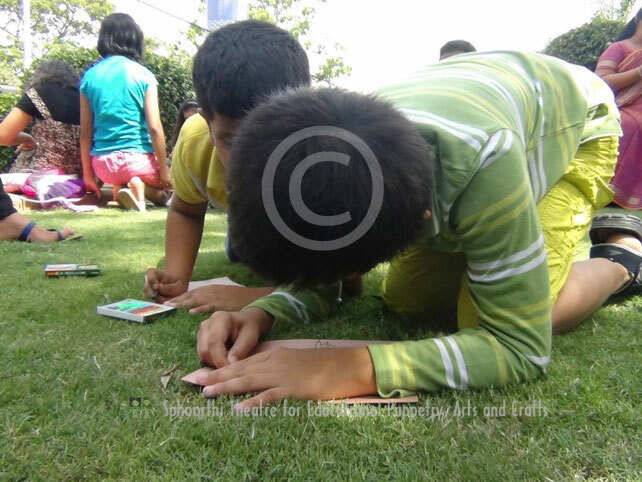 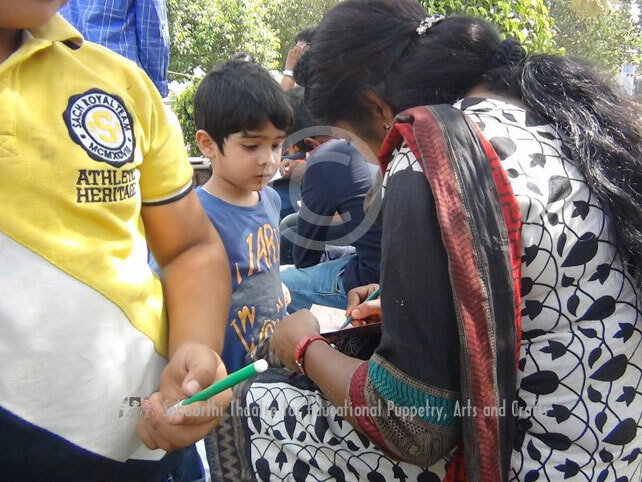 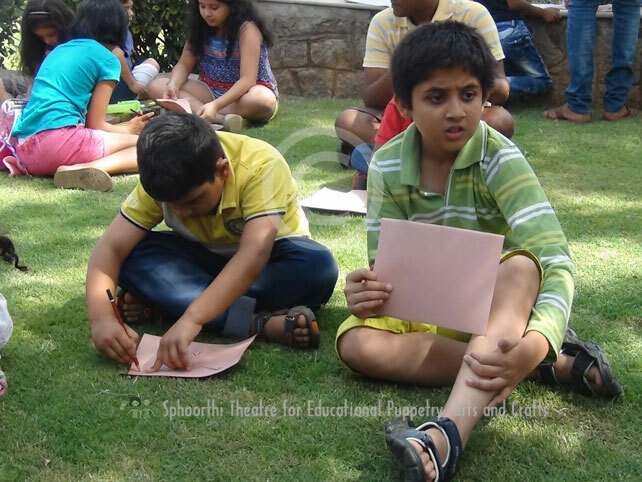 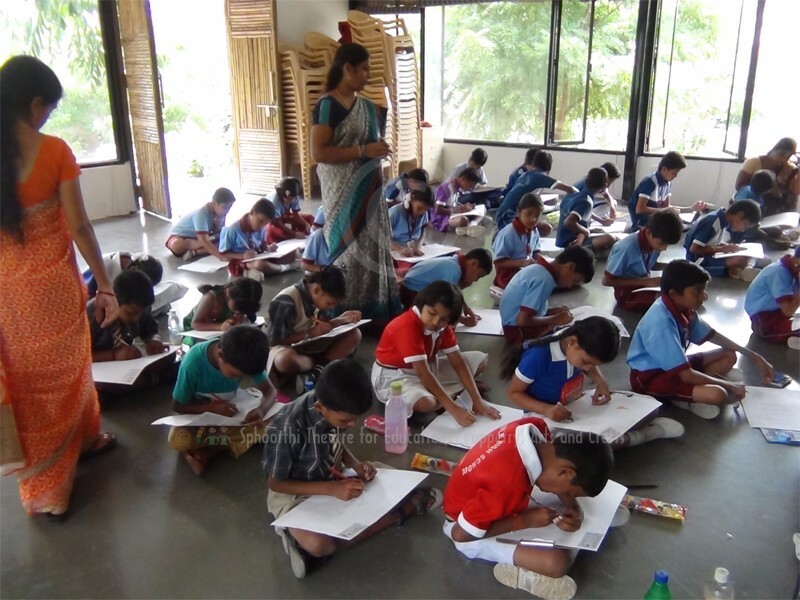 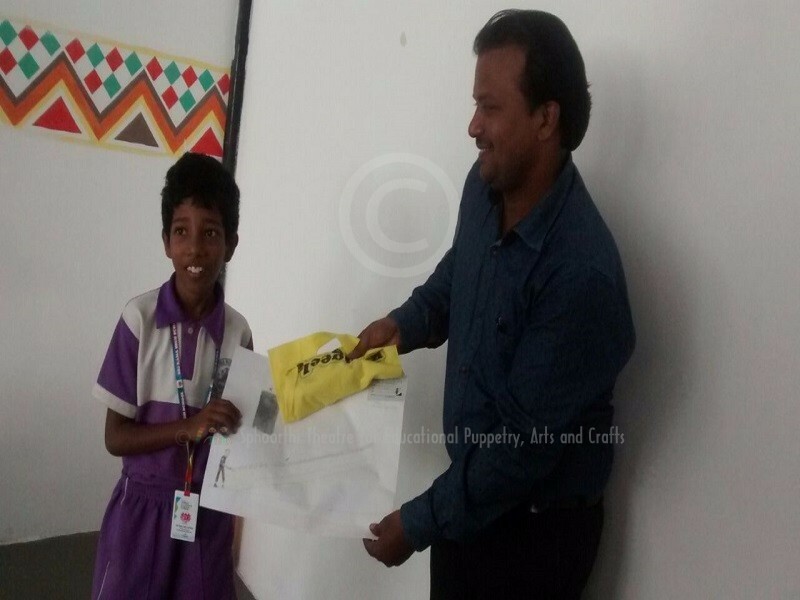 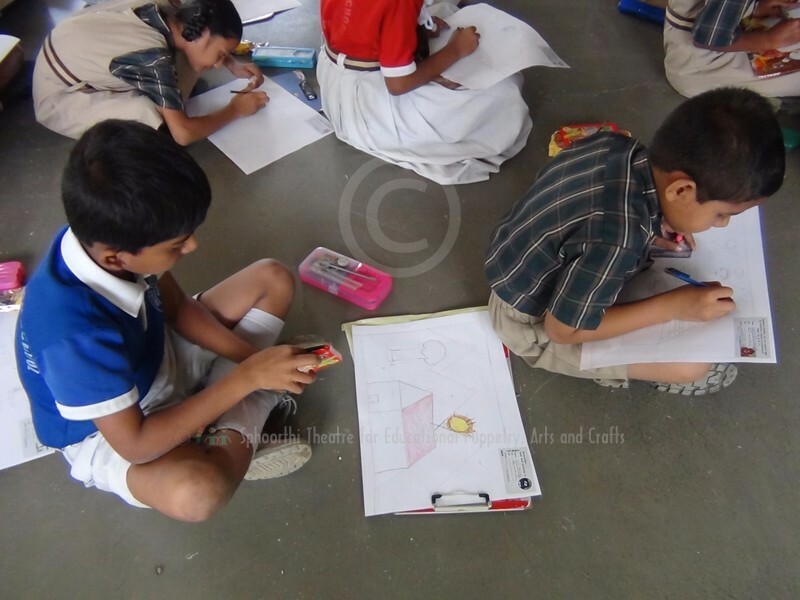 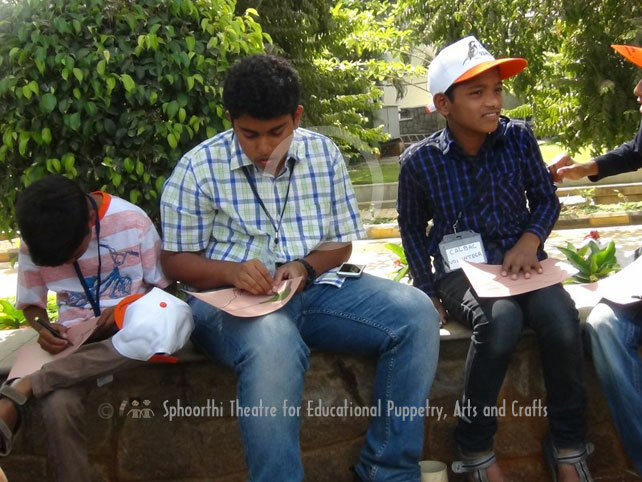 In association with Adhya Foundation, Pidilite Industries Ltd, Conducted "On the Spot Drawing Competition" on August 12, 2017 at Pheonix Areana-a cultural space,TSIIC Park, HITECH City Hyderabad. 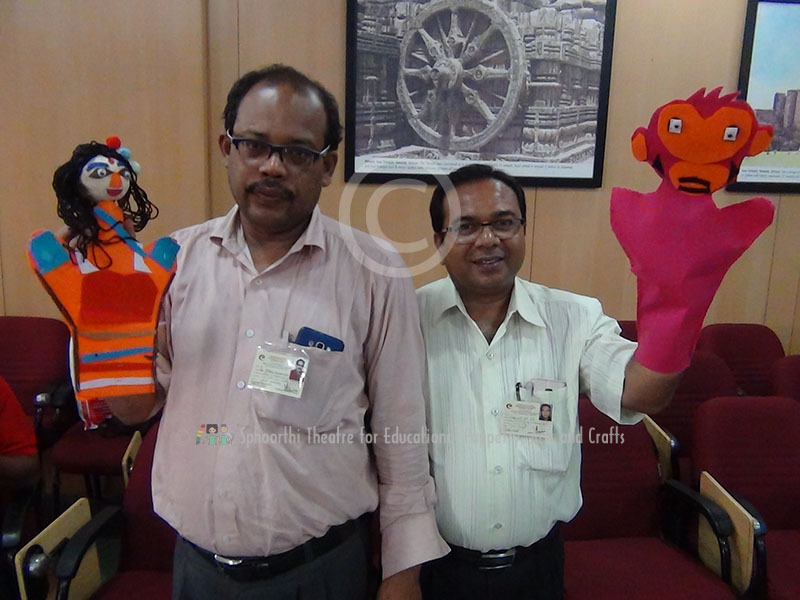 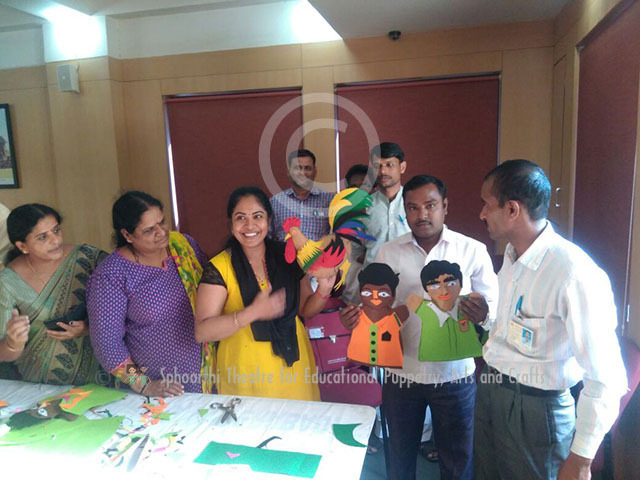 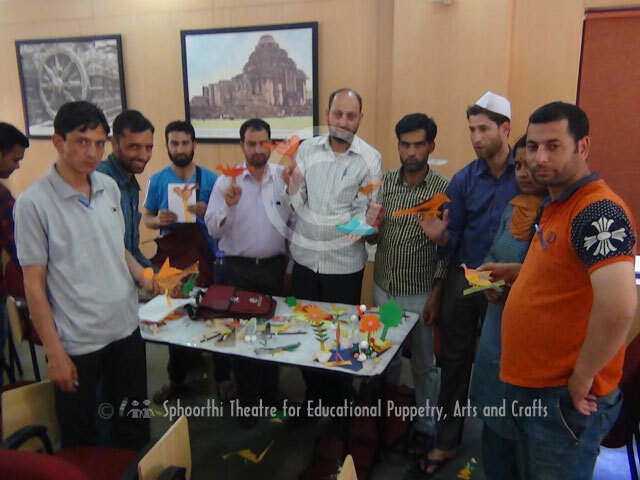 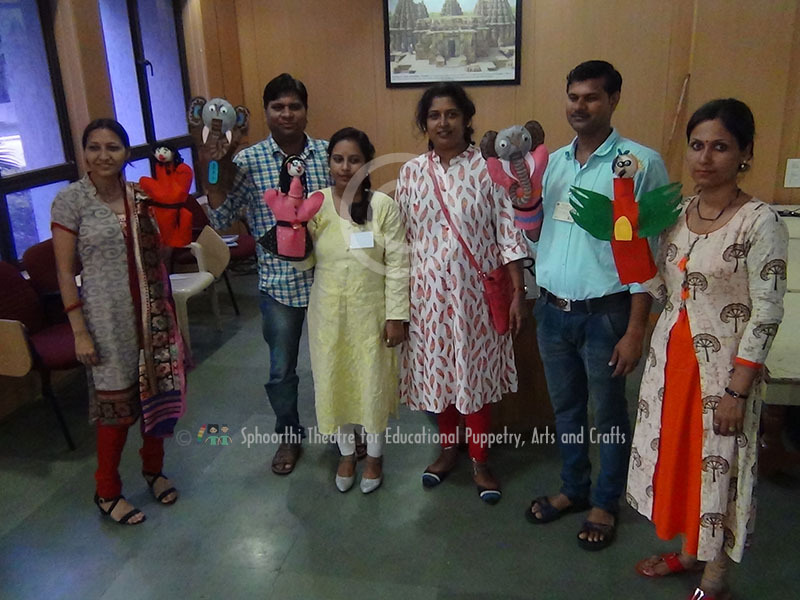 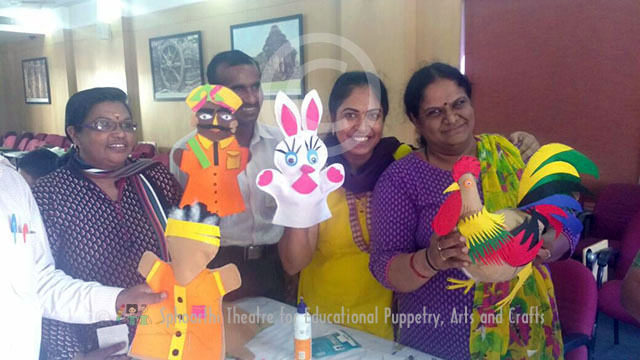 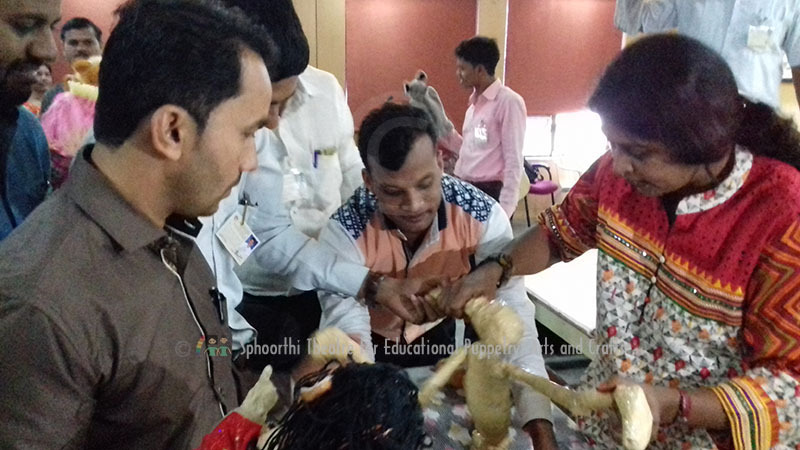 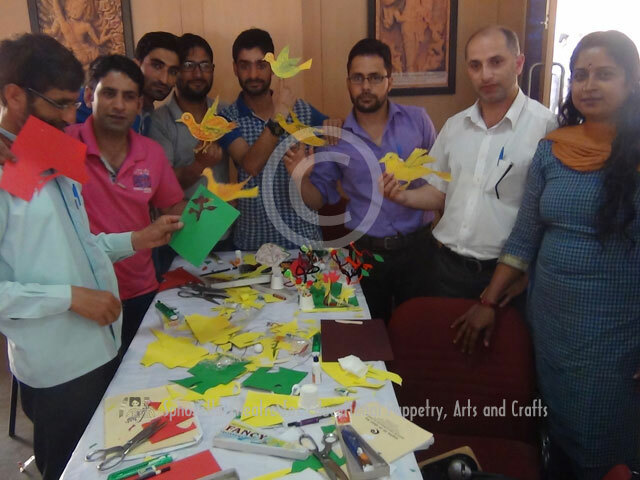 July 18-19, 2017, Glove Puppet making workshop on "Role of Puppetry in Education" for Govt. 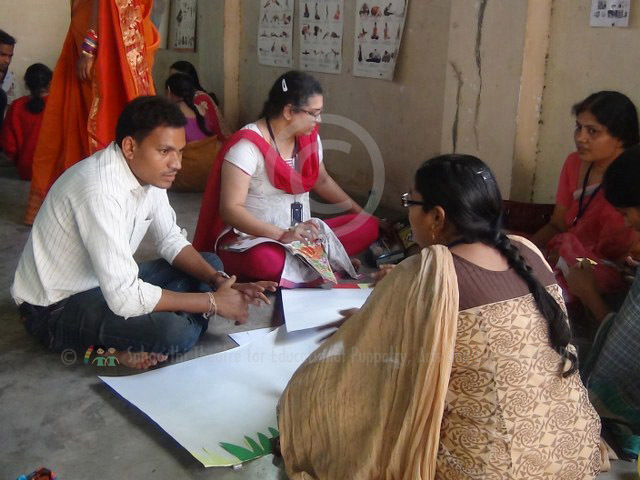 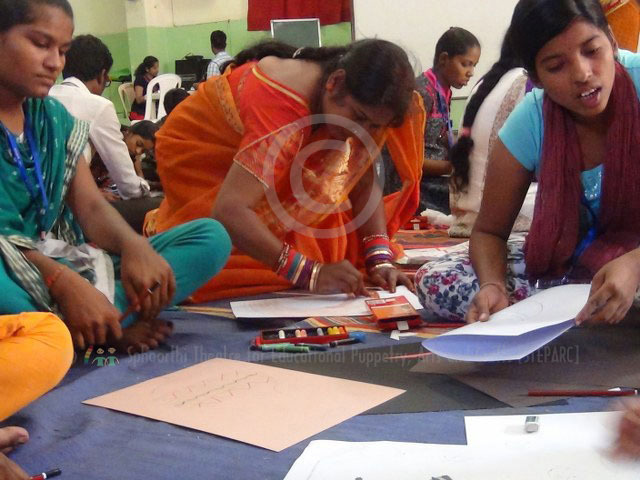 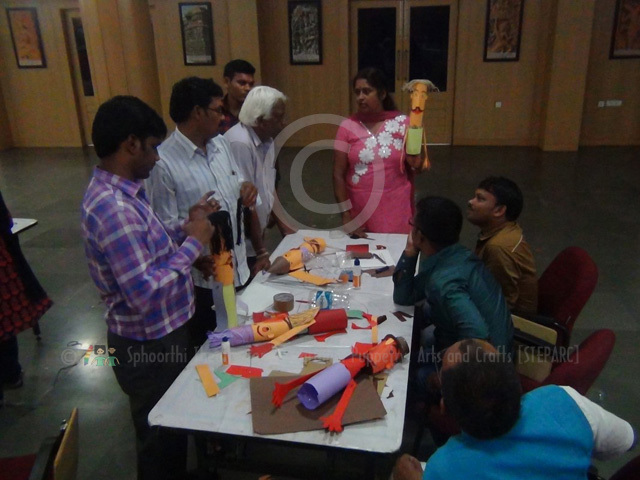 School Teachers across India at Centre Cultural Resources and Training- CCRT, Hyderabad. 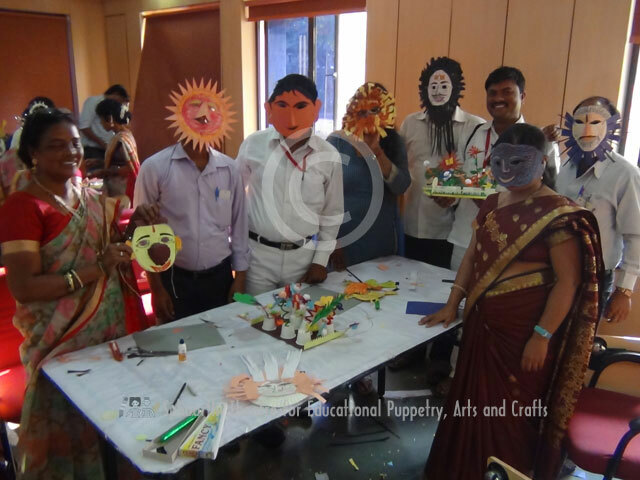 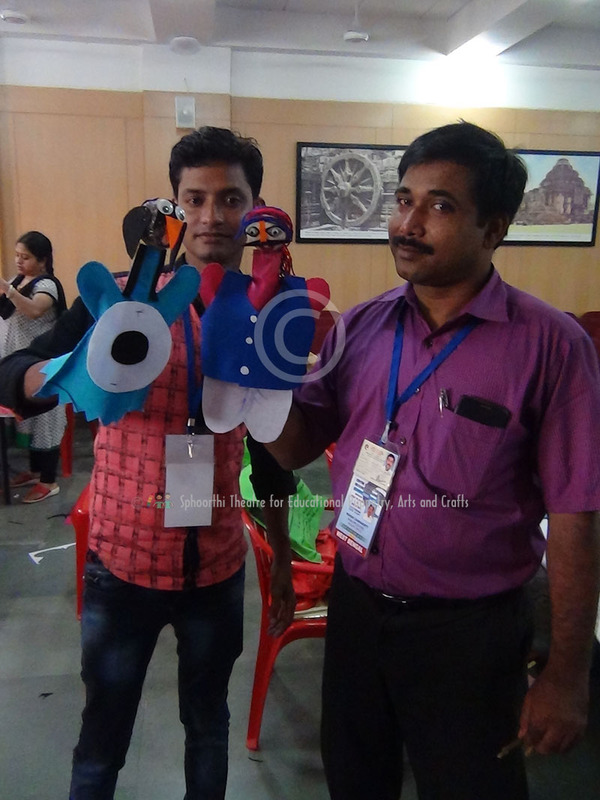 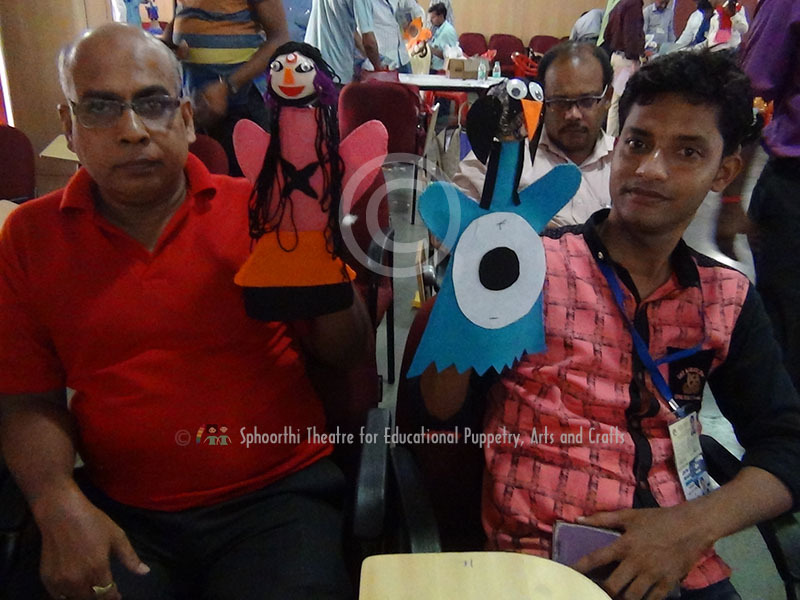 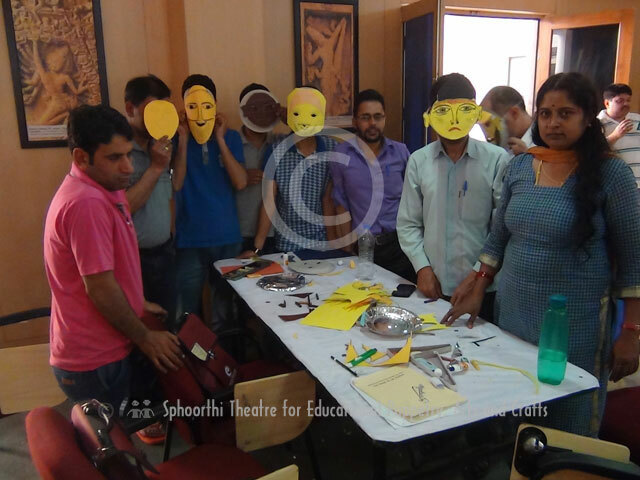 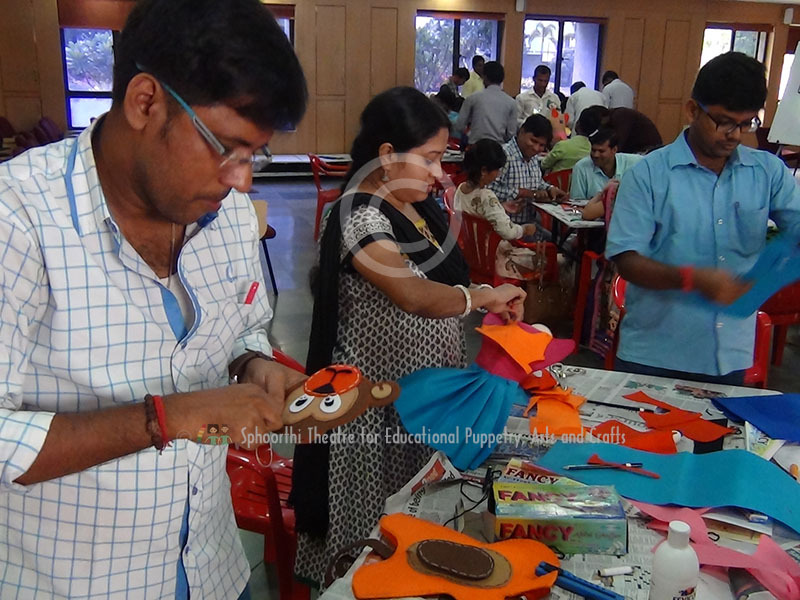 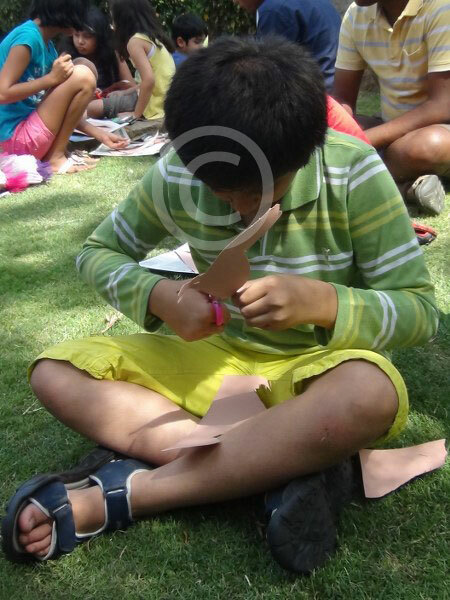 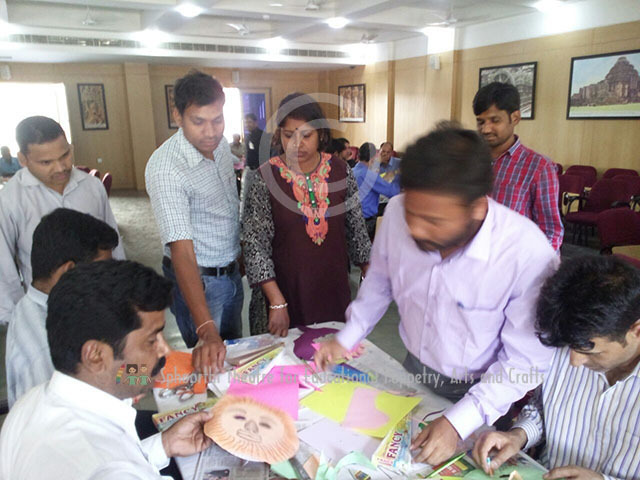 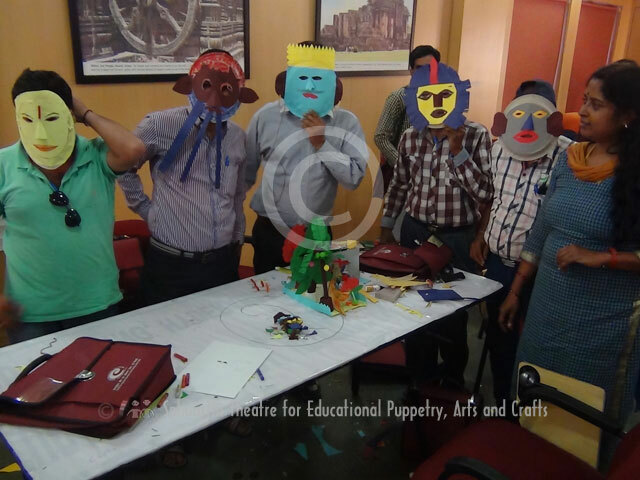 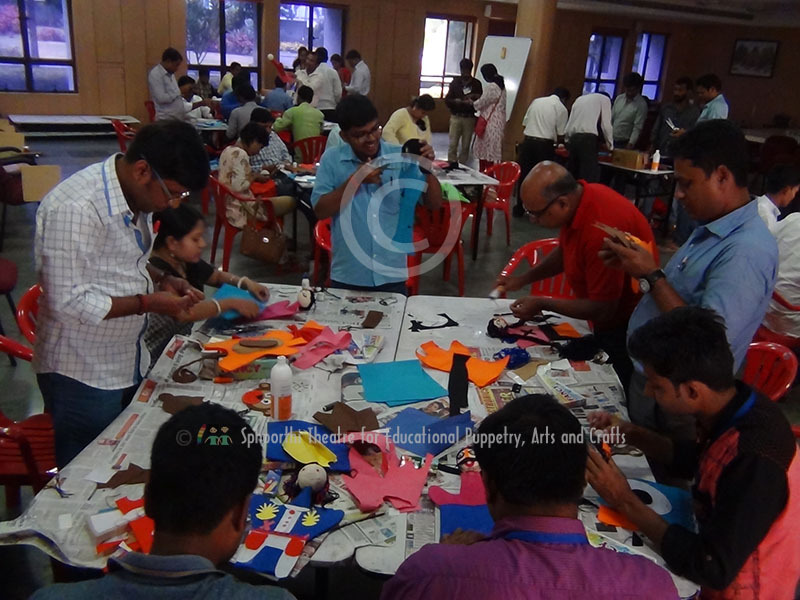 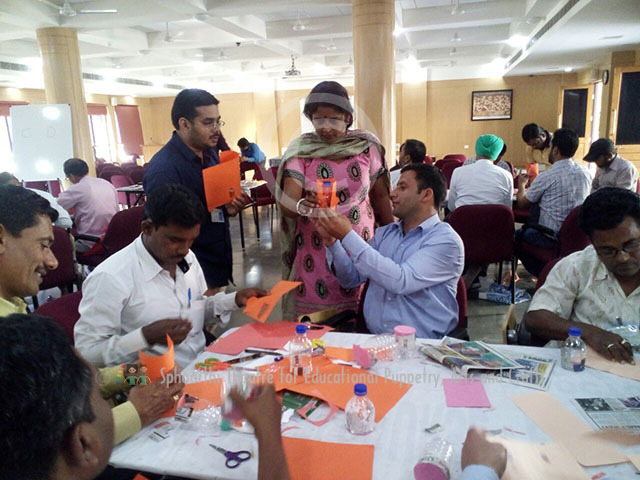 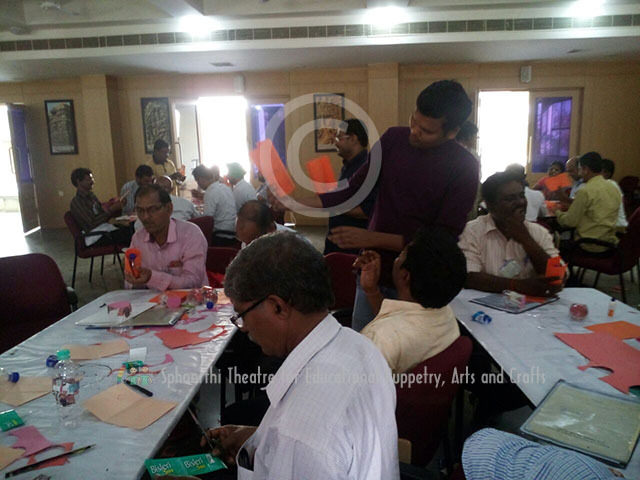 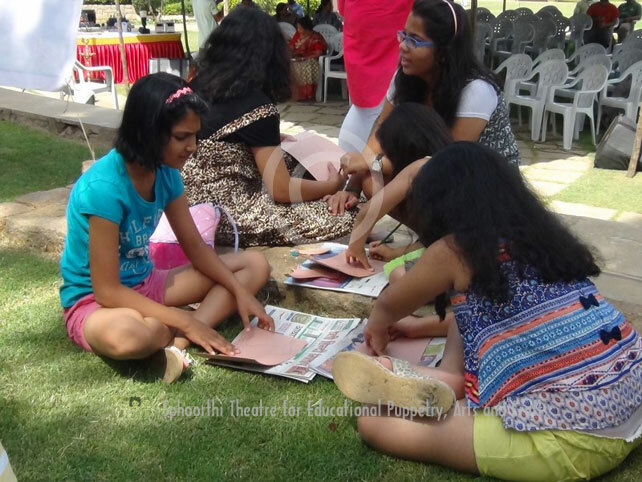 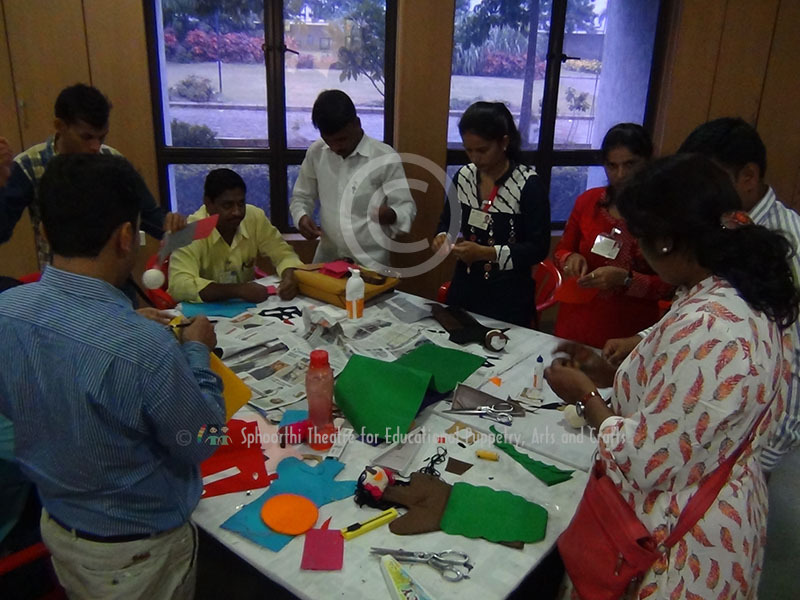 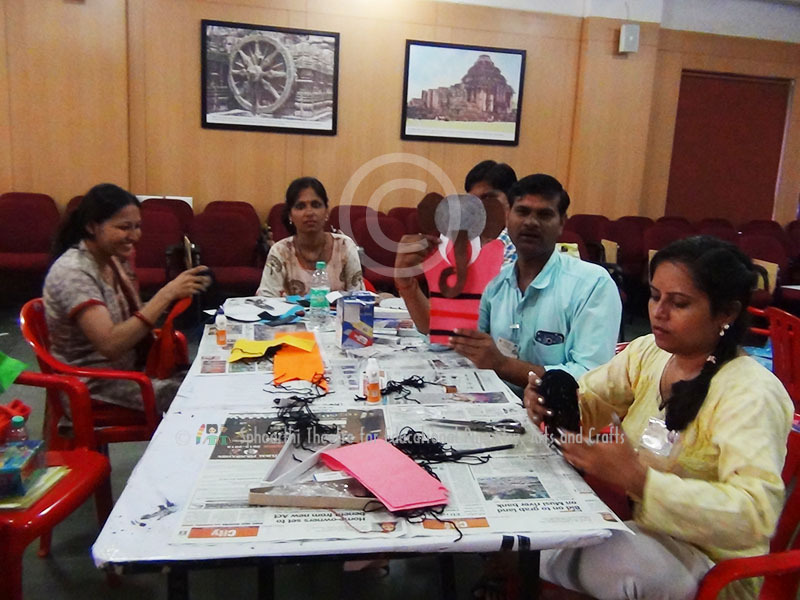 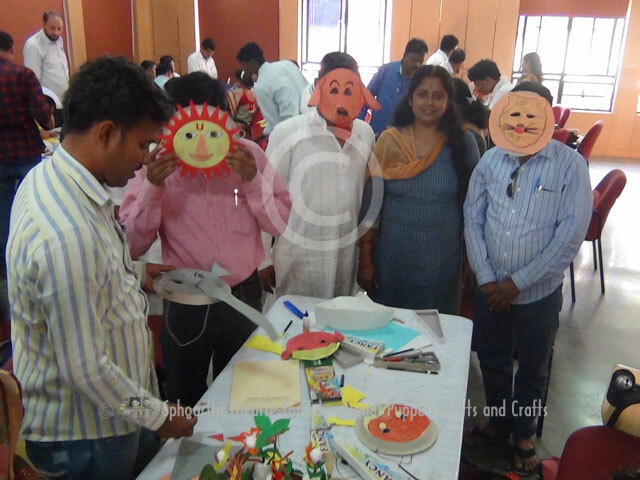 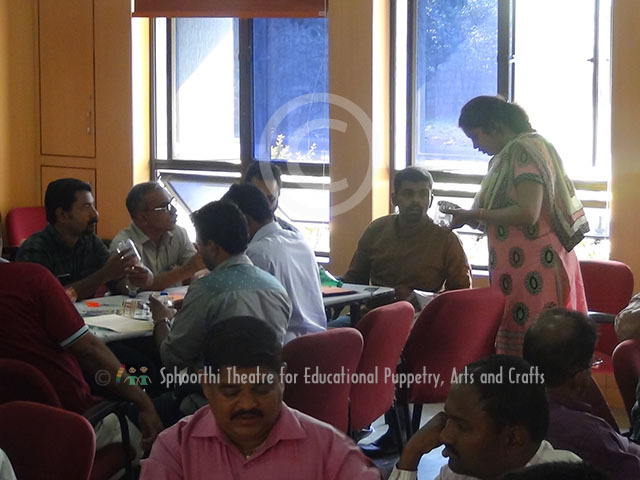 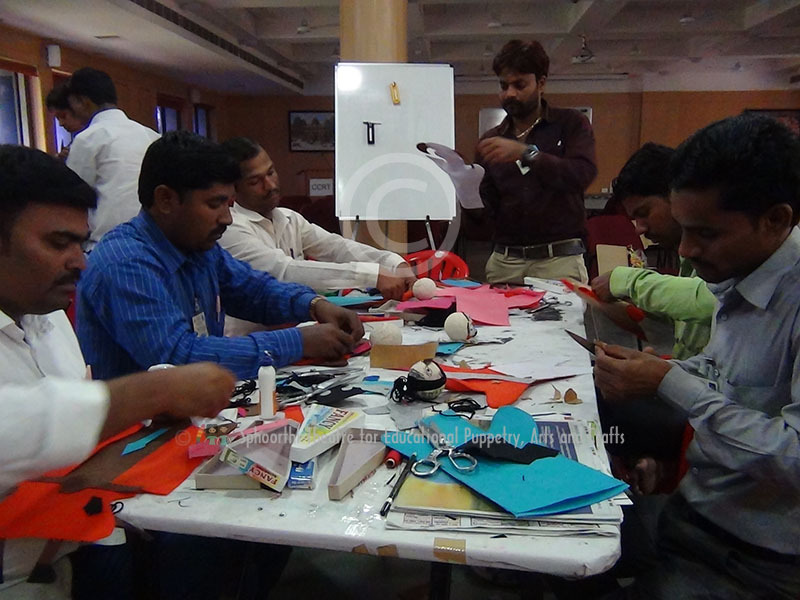 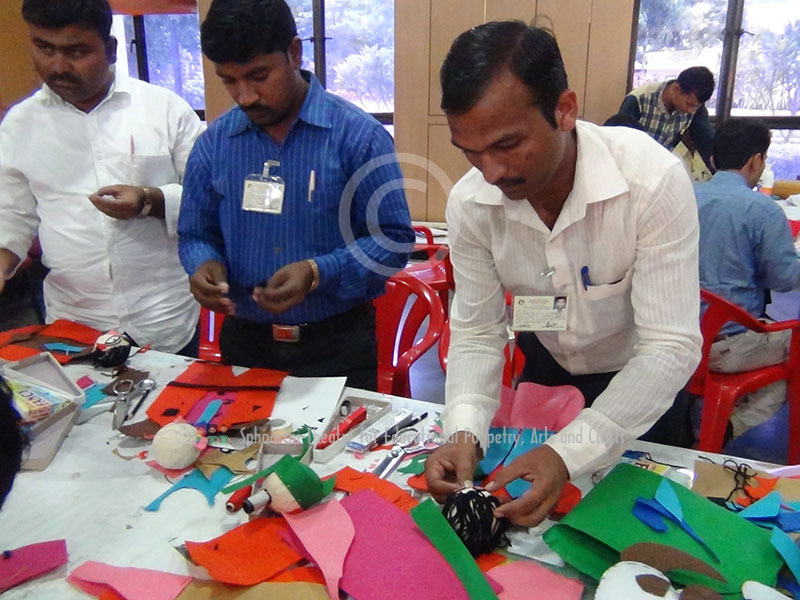 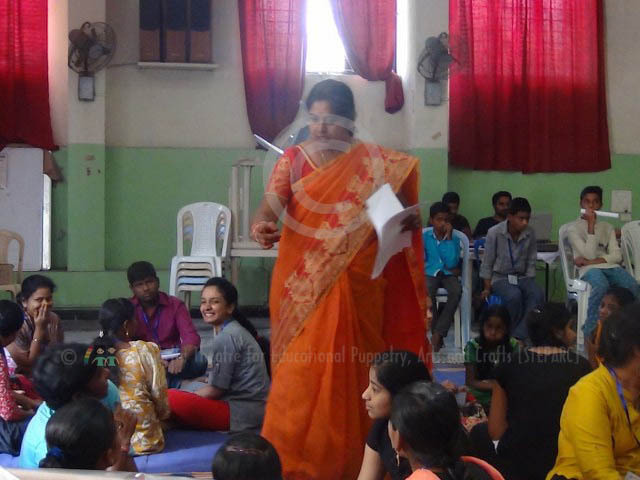 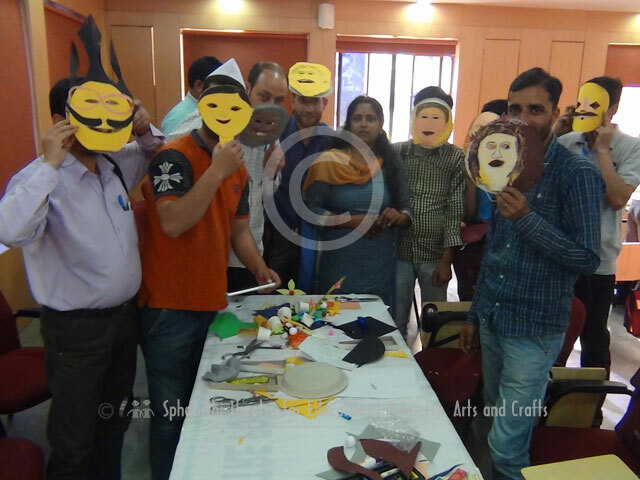 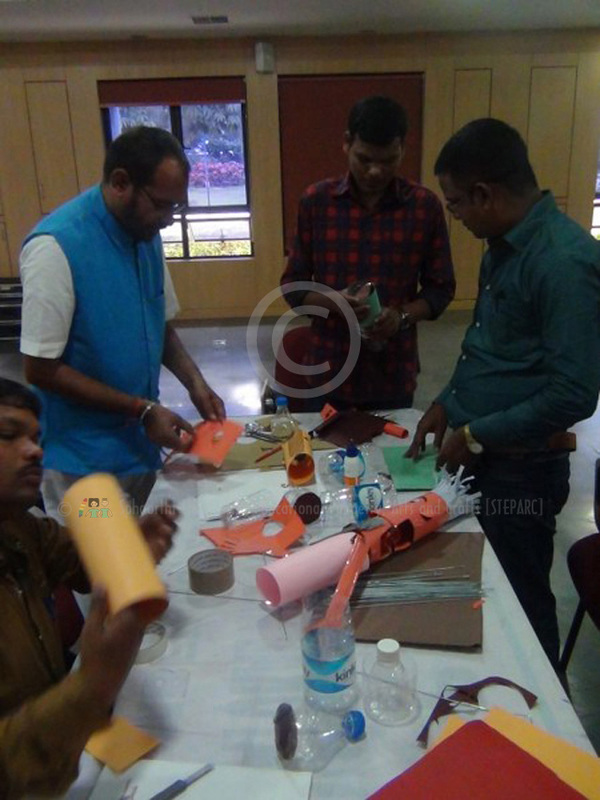 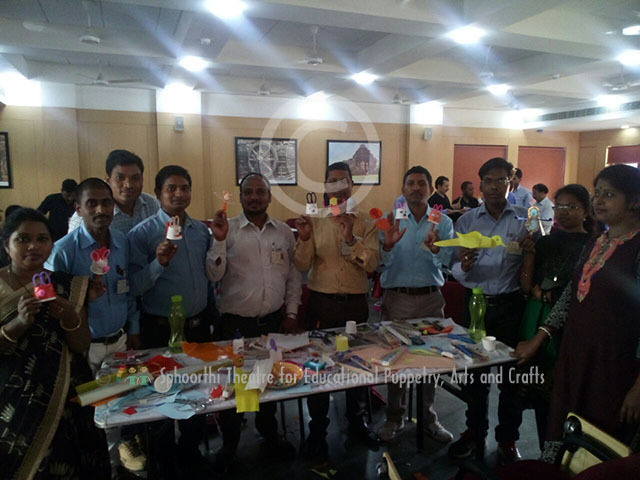 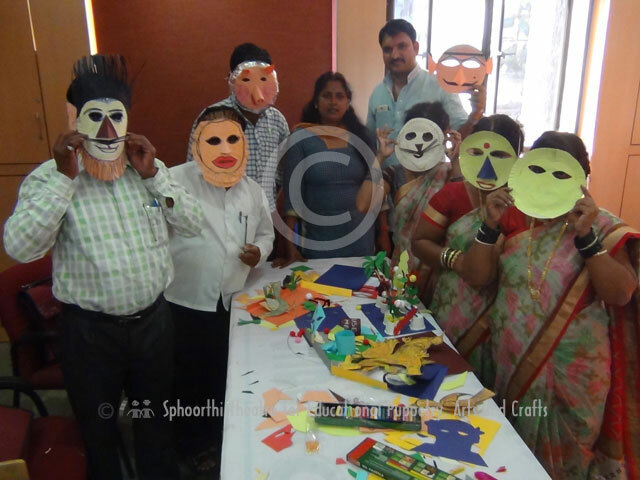 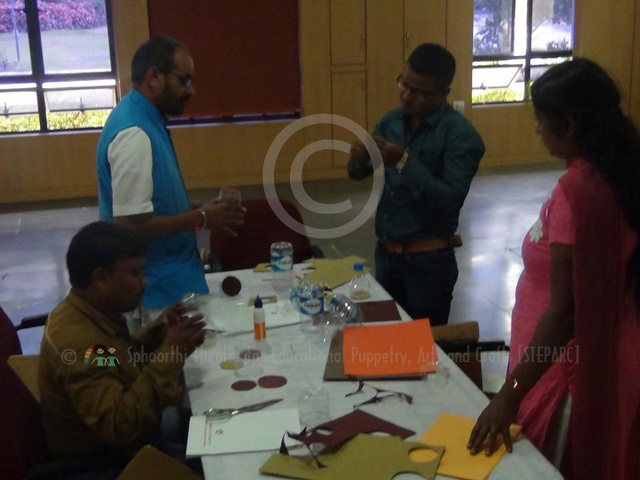 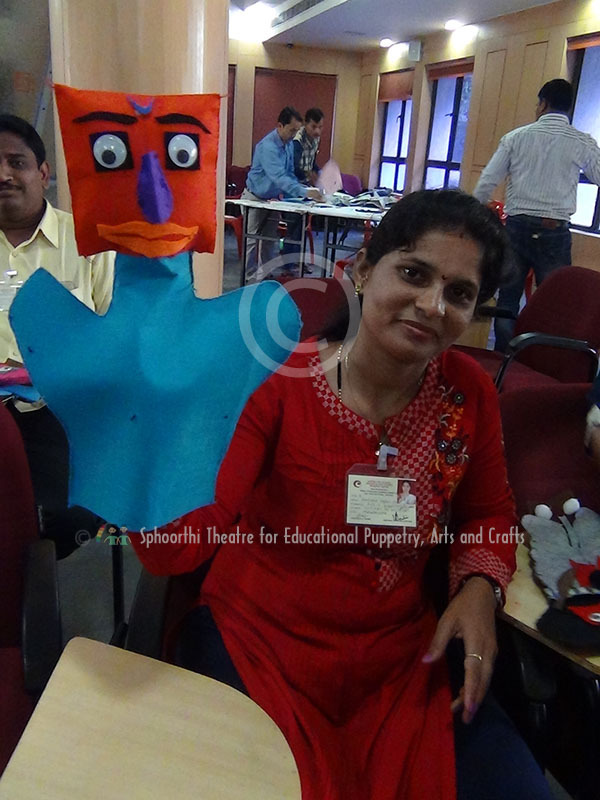 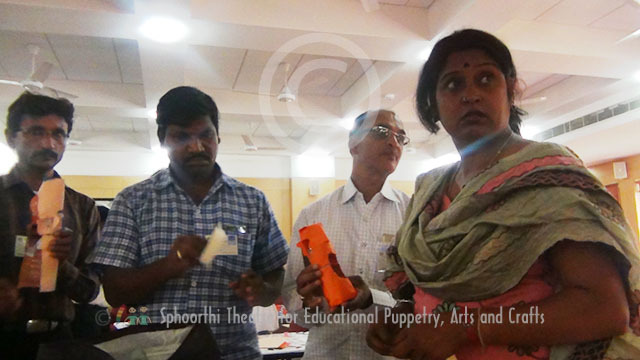 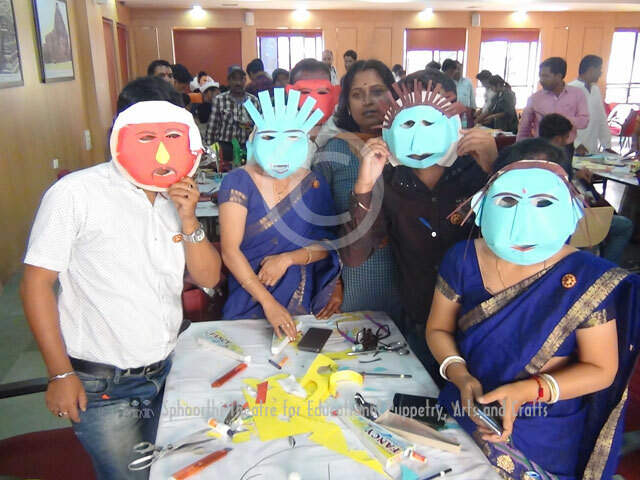 "Masks Making" at 250th workshop on "Role of Puppetry in Education" for Govt. 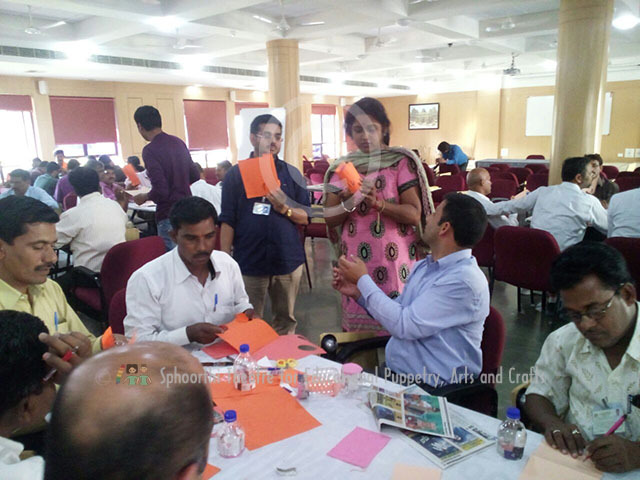 School Teachers across India at Centre Cultural Resources and Training-CCRT, Hyderabad July 17th 2017. 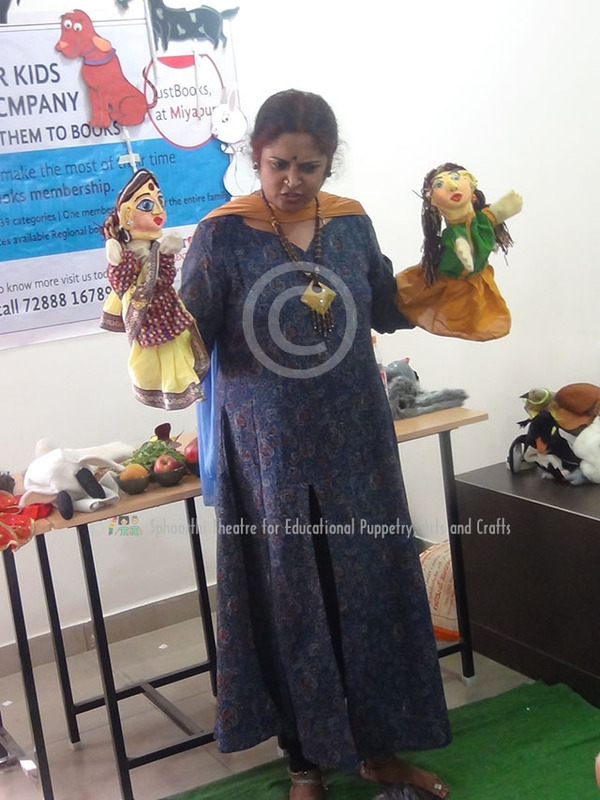 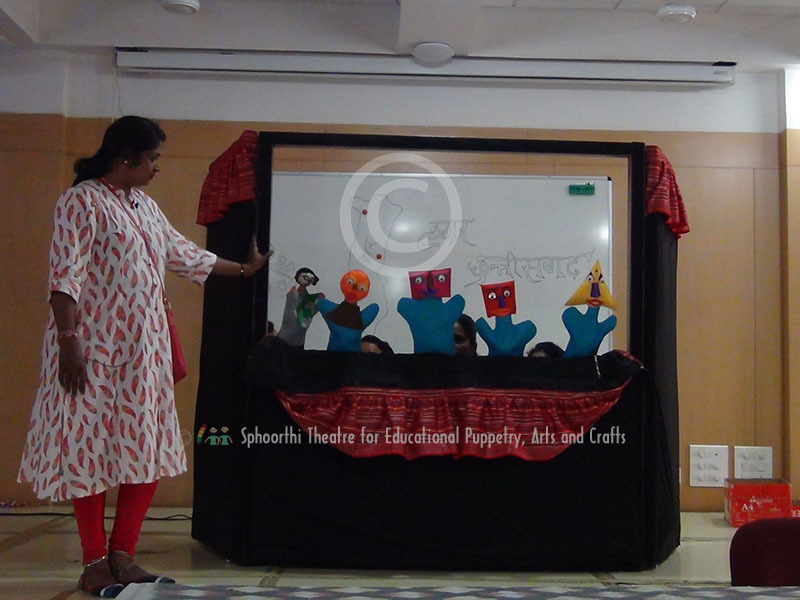 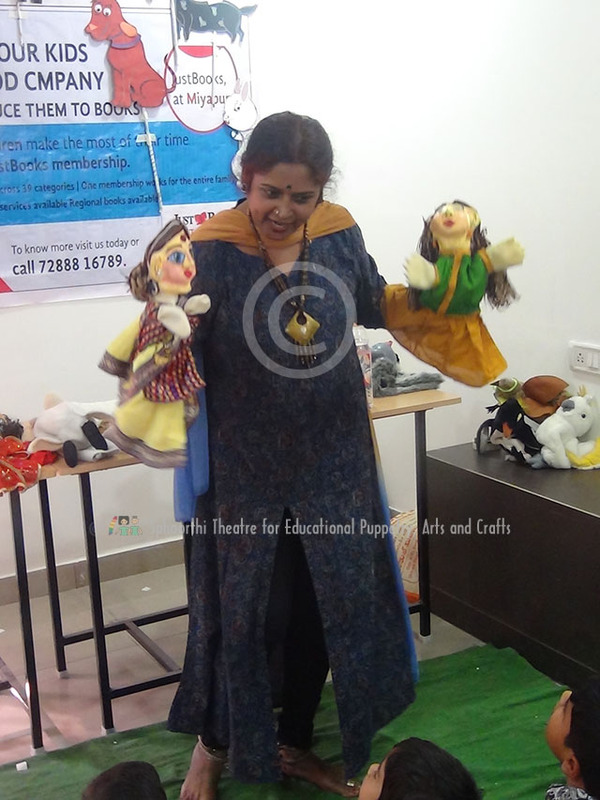 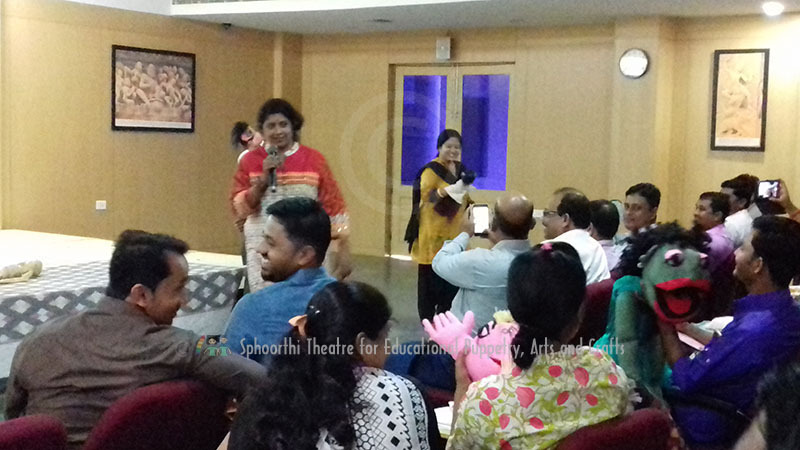 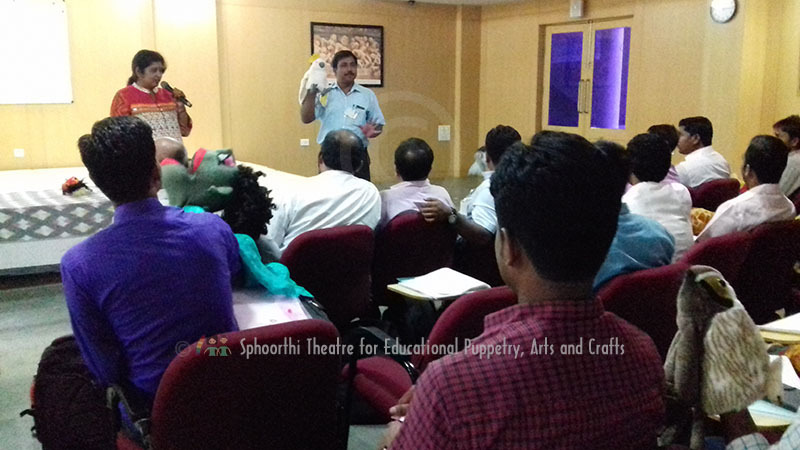 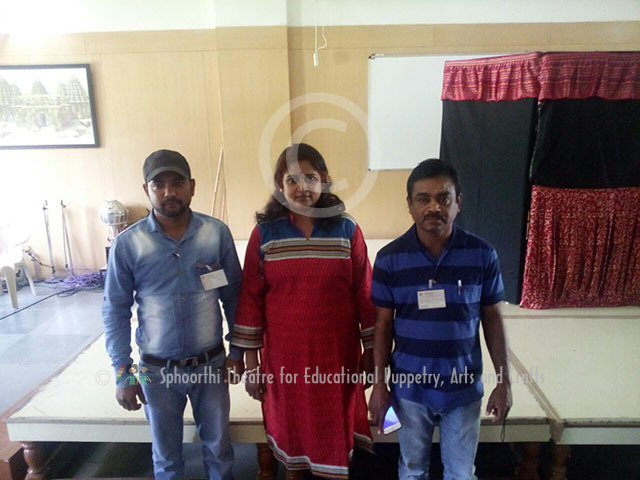 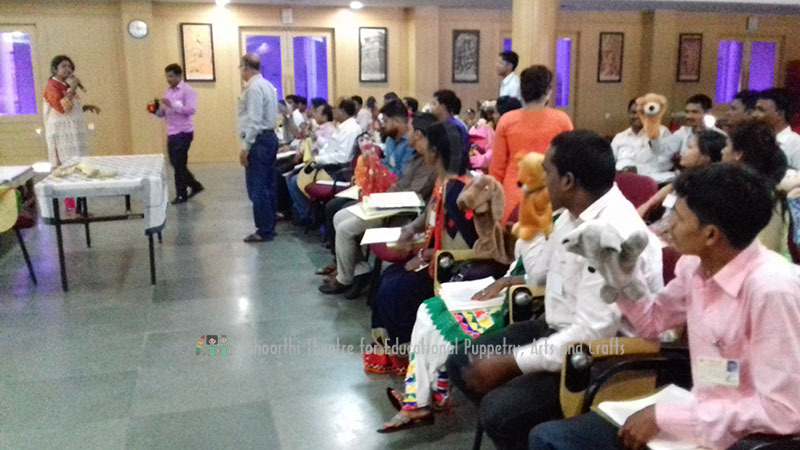 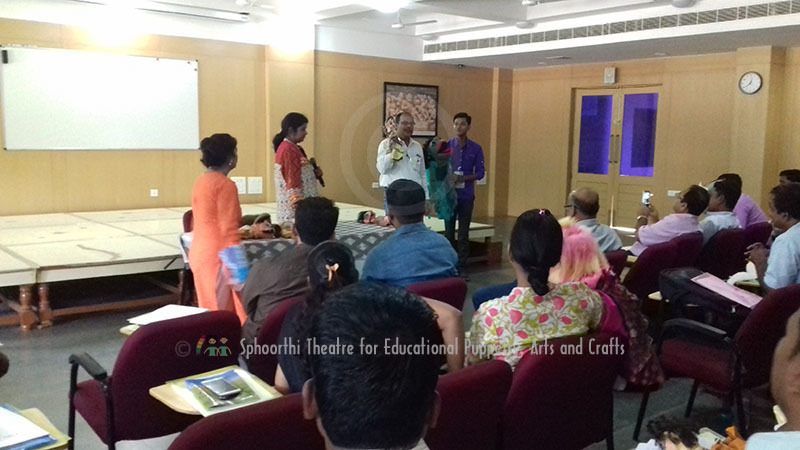 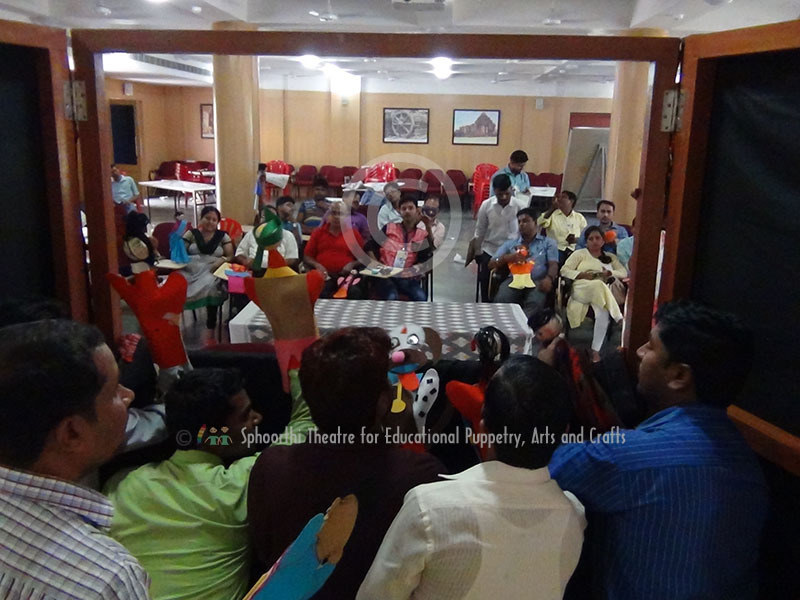 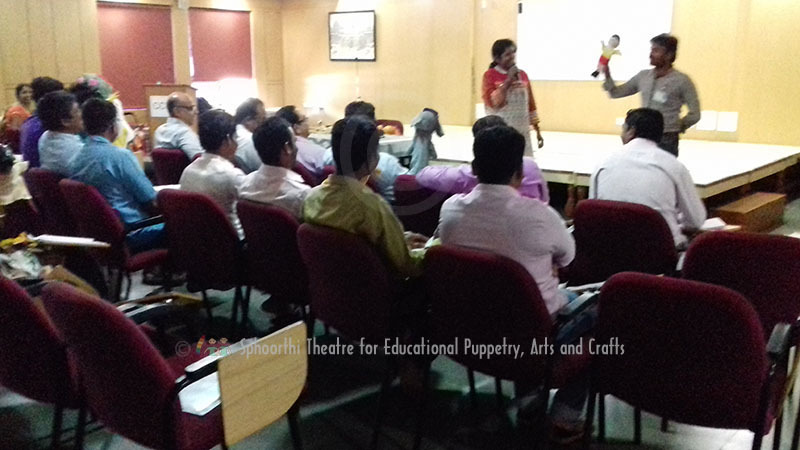 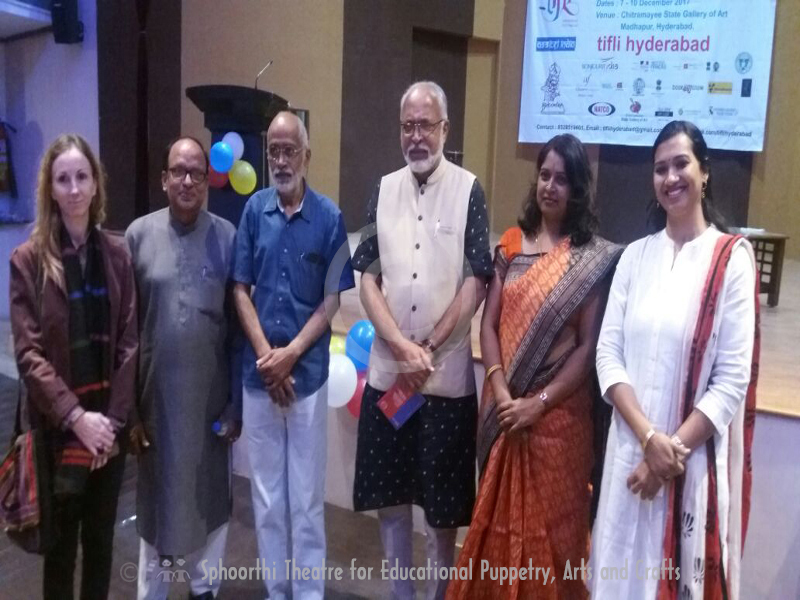 Introduction Session on 'History of Traditional Puppet Theatre in India and Introduction to Puppetry as a Medium of Education' on July 14, 2017 at 247th workshop on "Role of Puppetry in Education" for Govt. 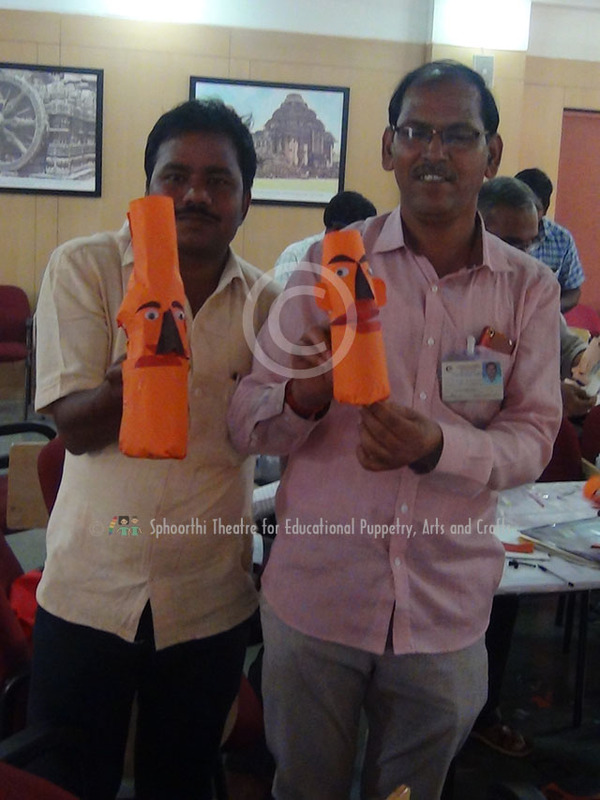 School Teachers across India at Centre Cultural Resources and Training-CCRT, Hyderabad. 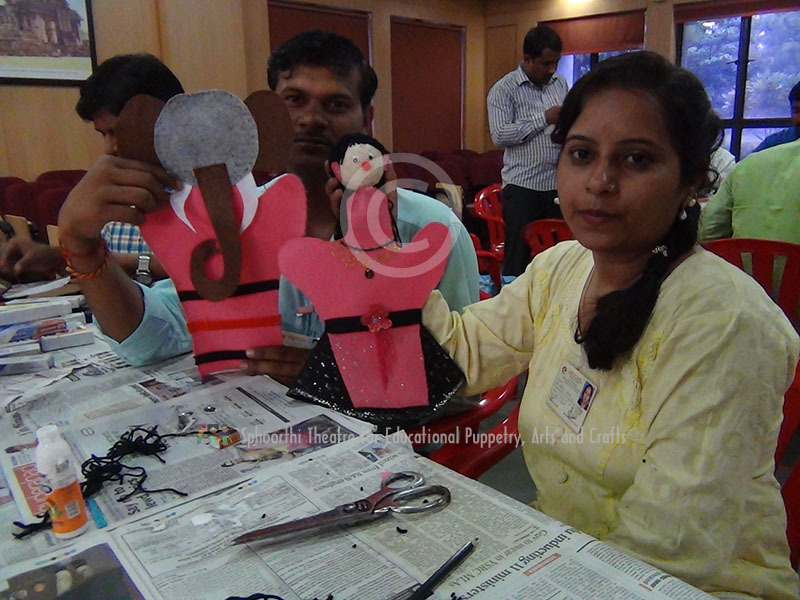 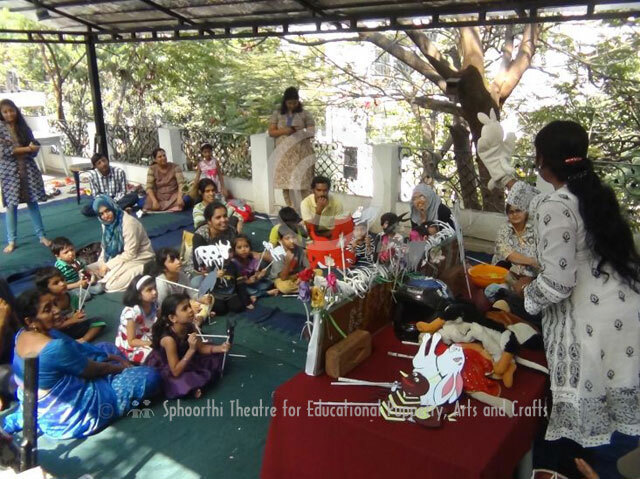 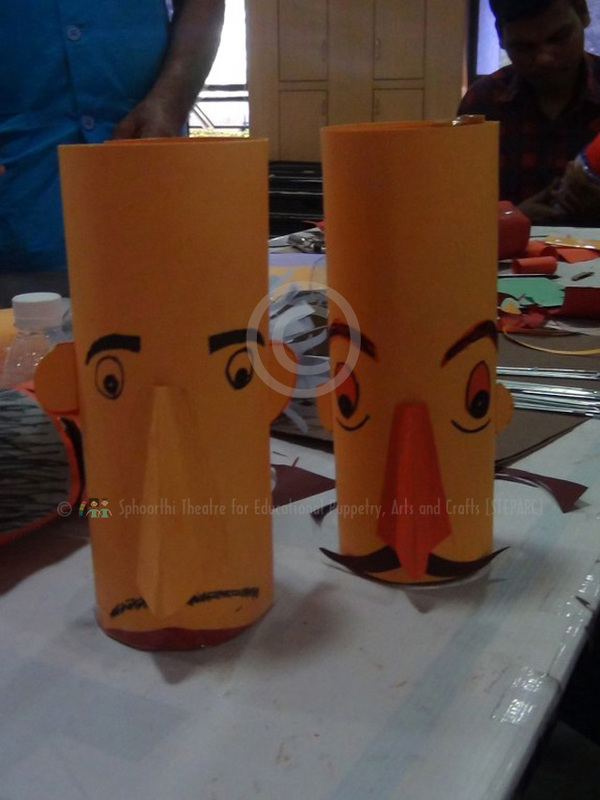 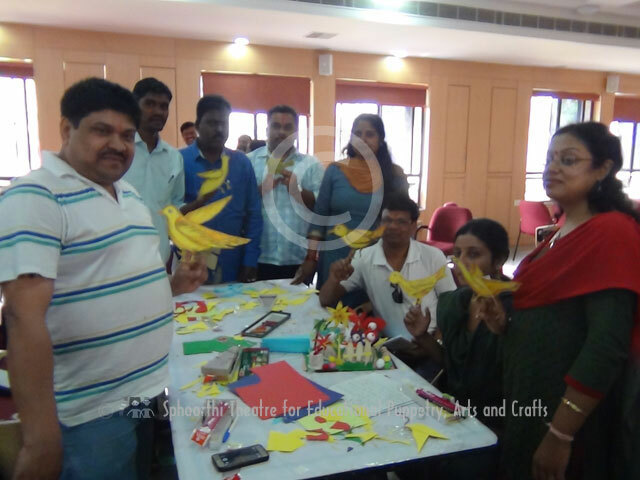 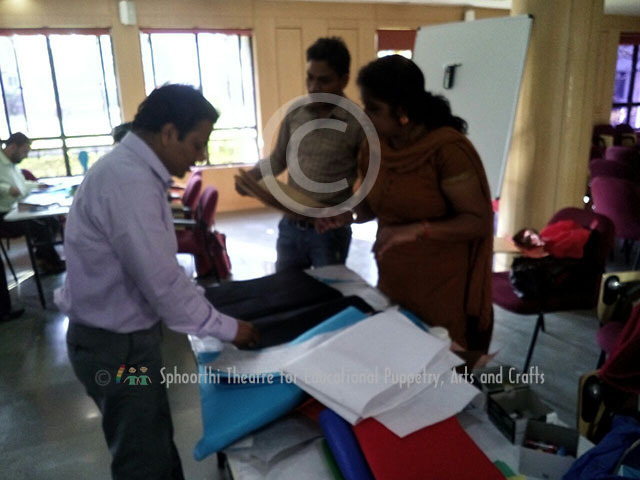 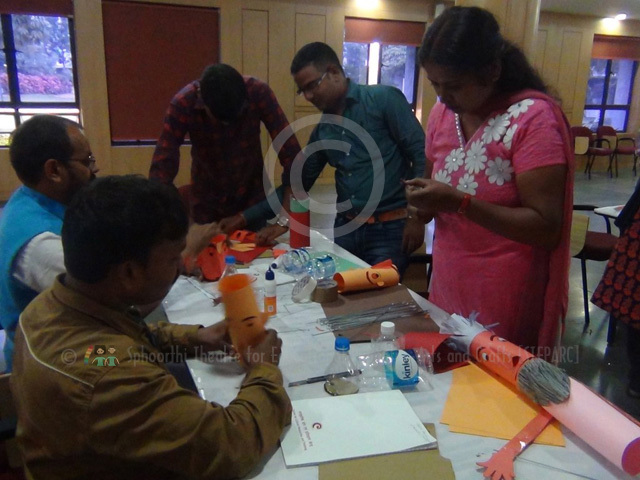 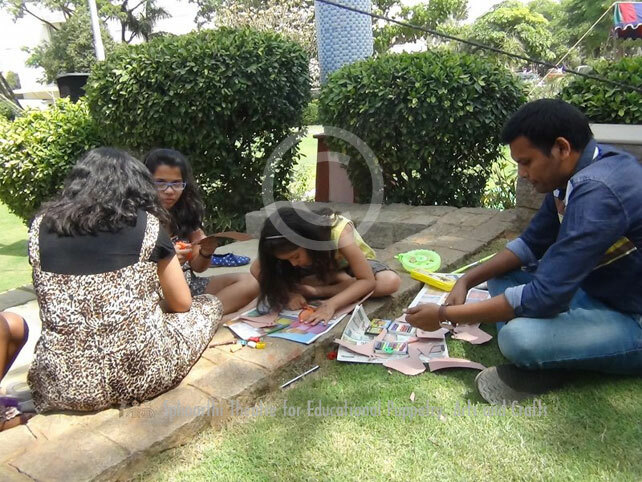 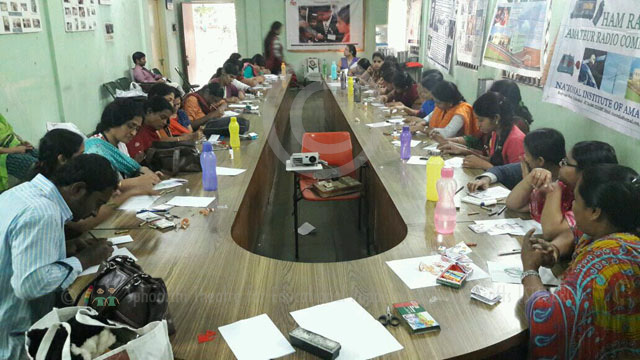 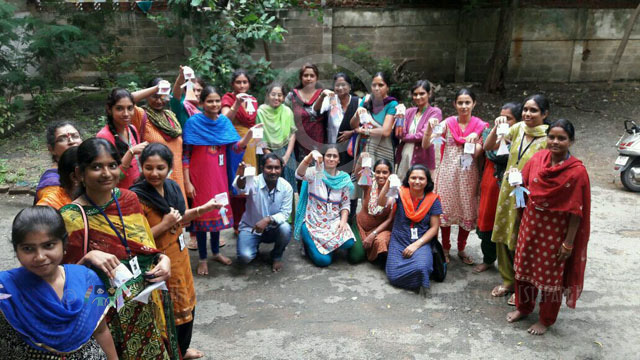 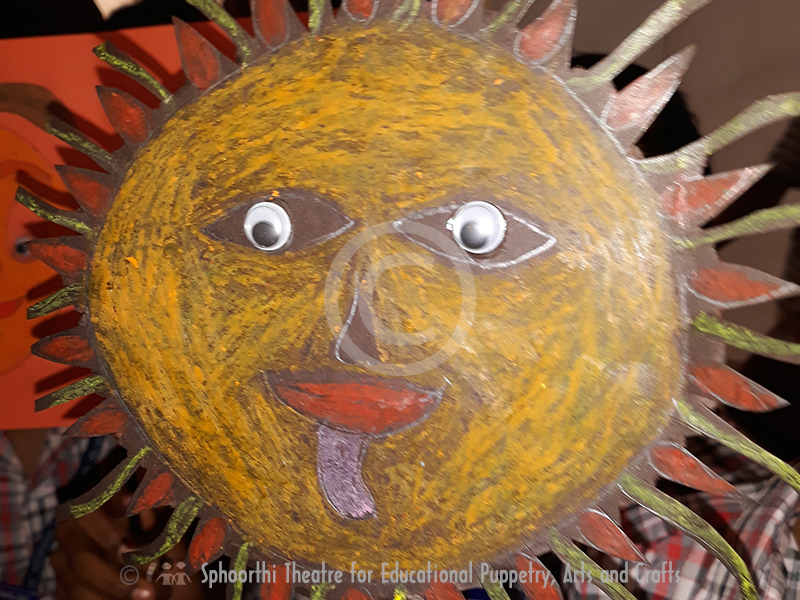 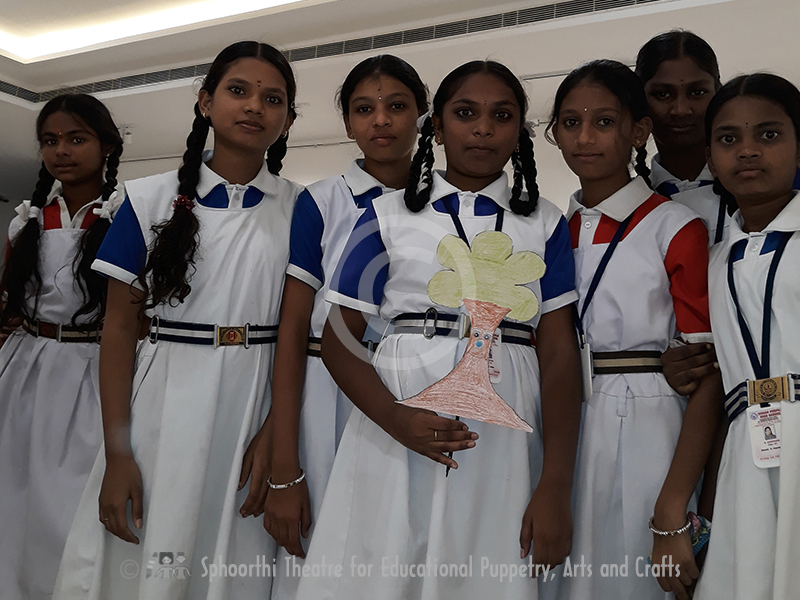 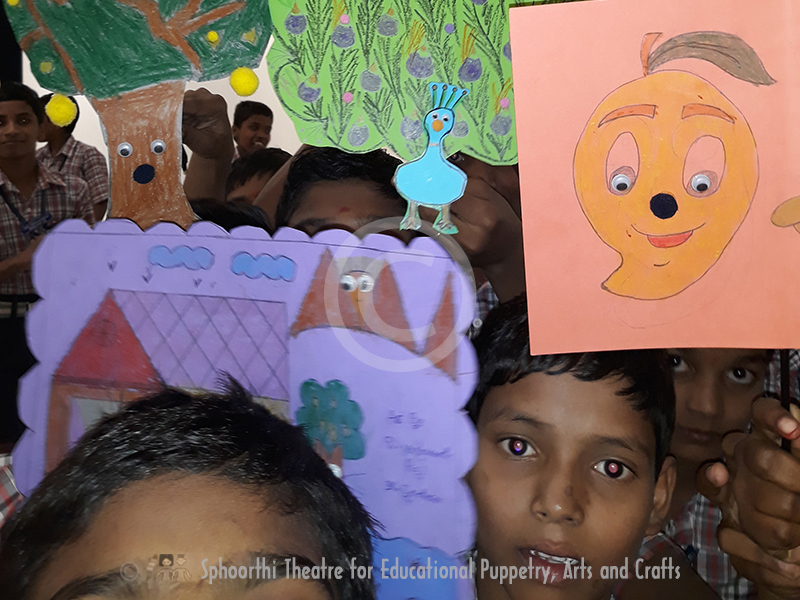 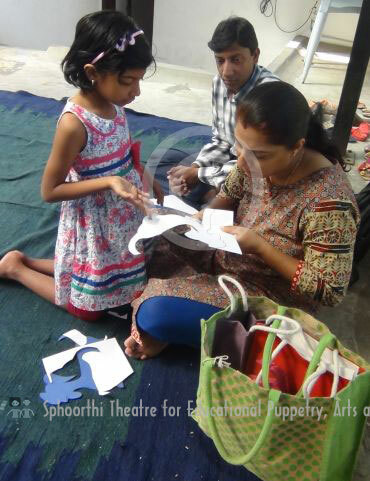 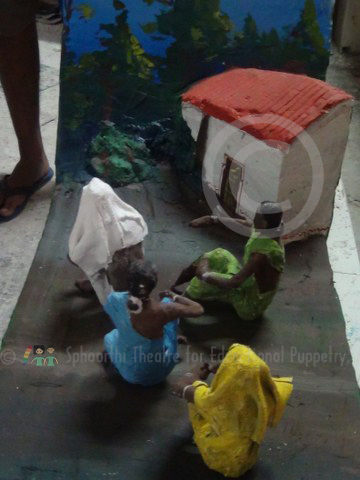 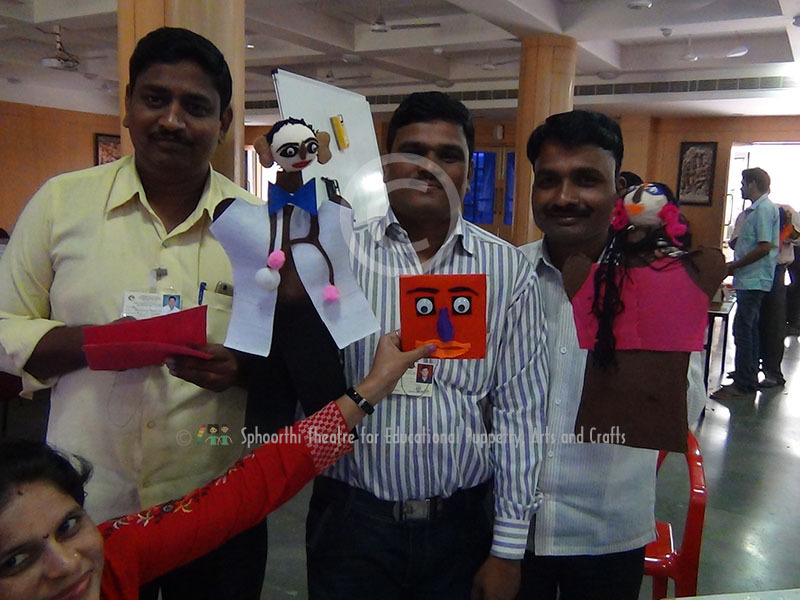 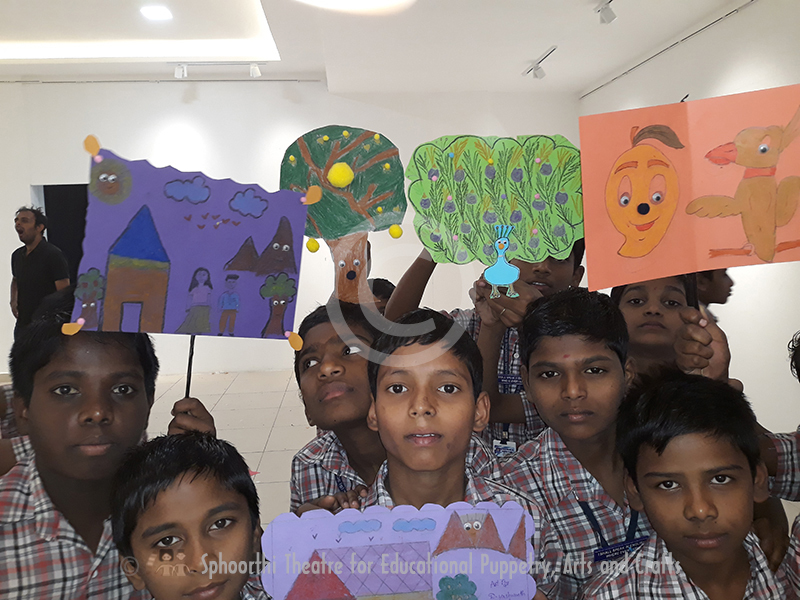 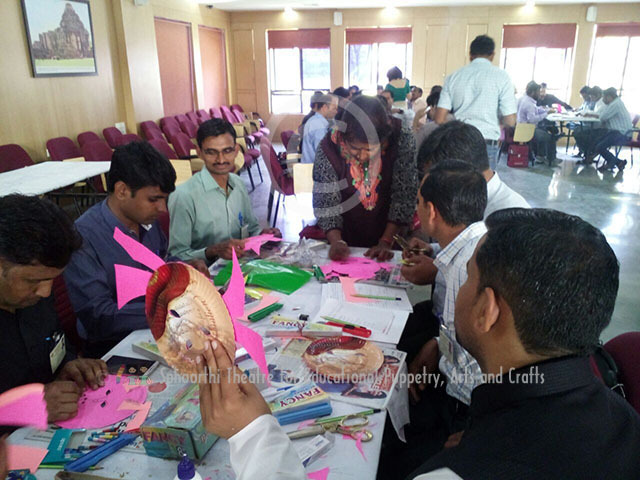 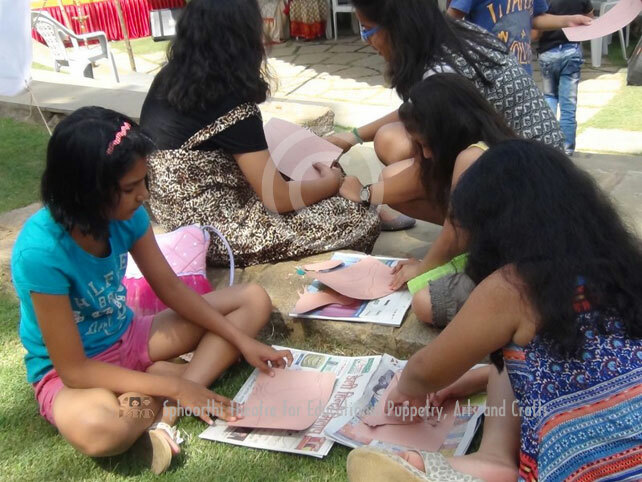 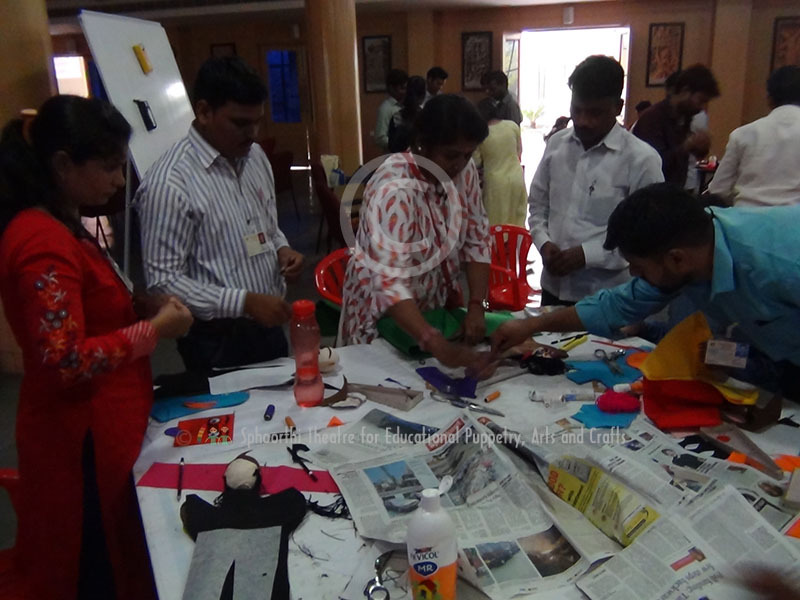 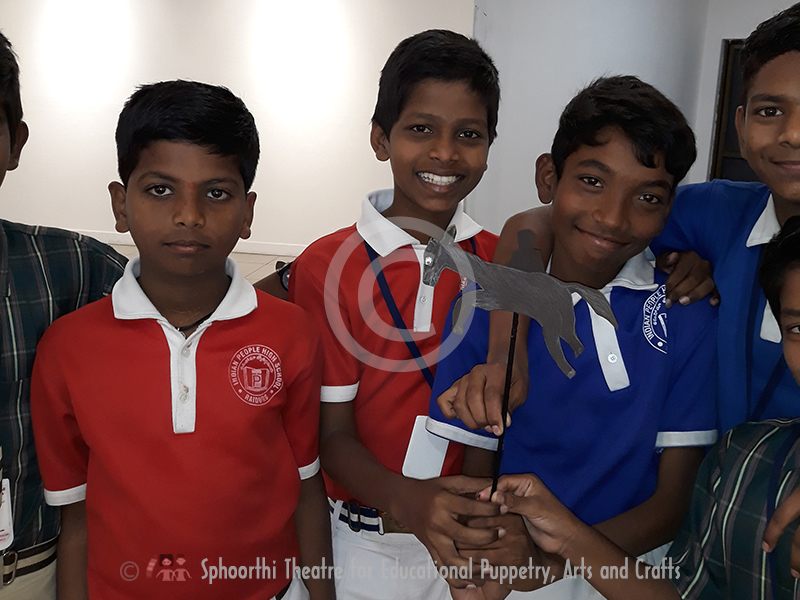 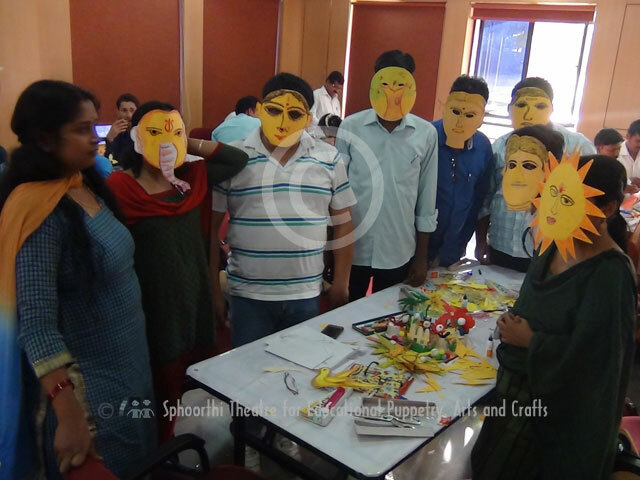 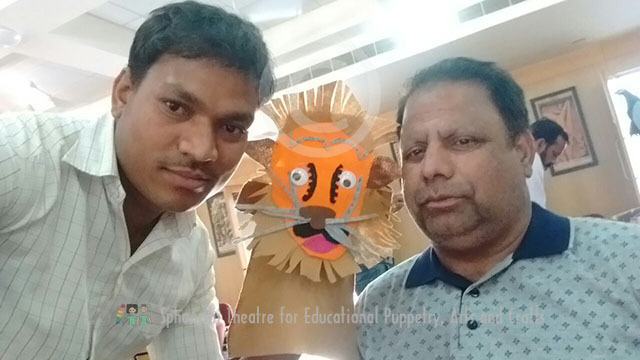 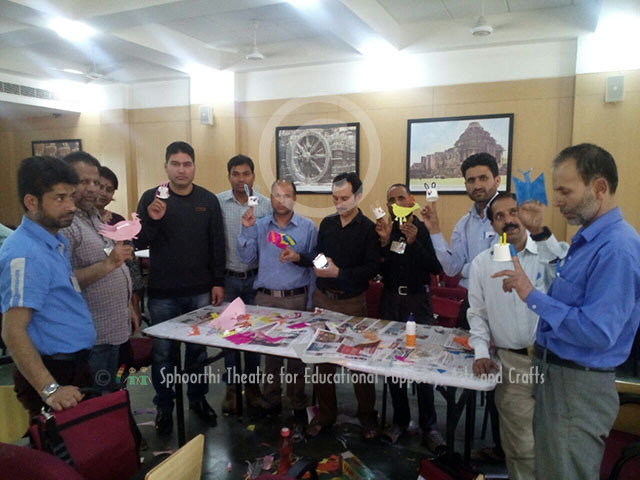 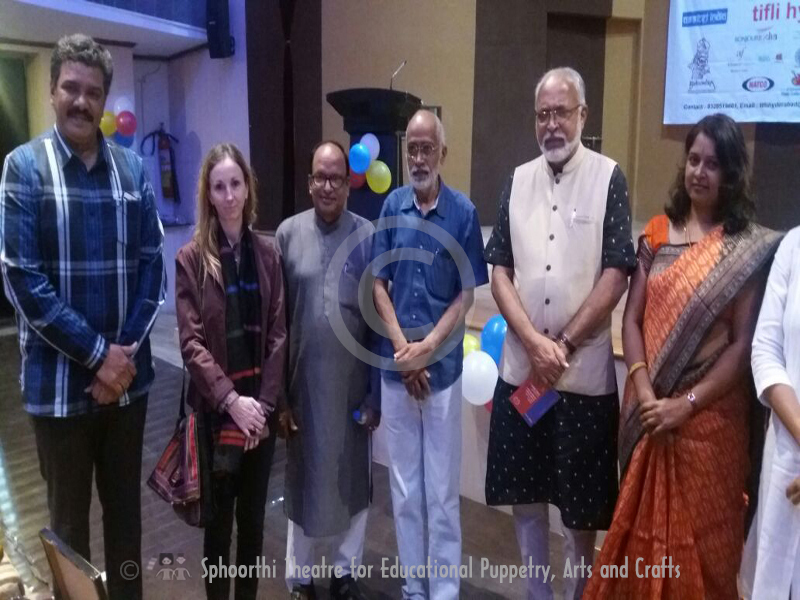 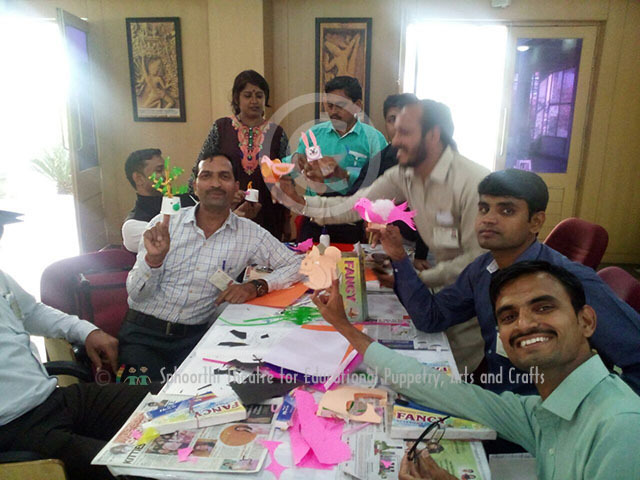 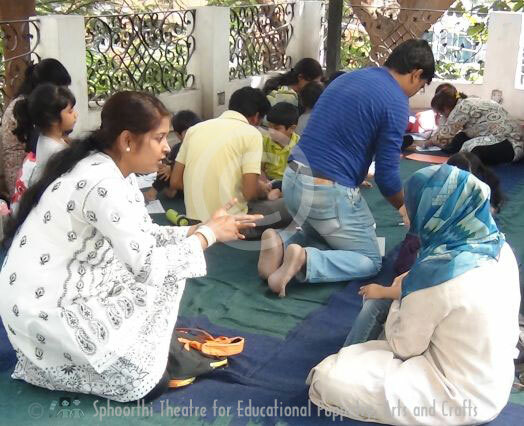 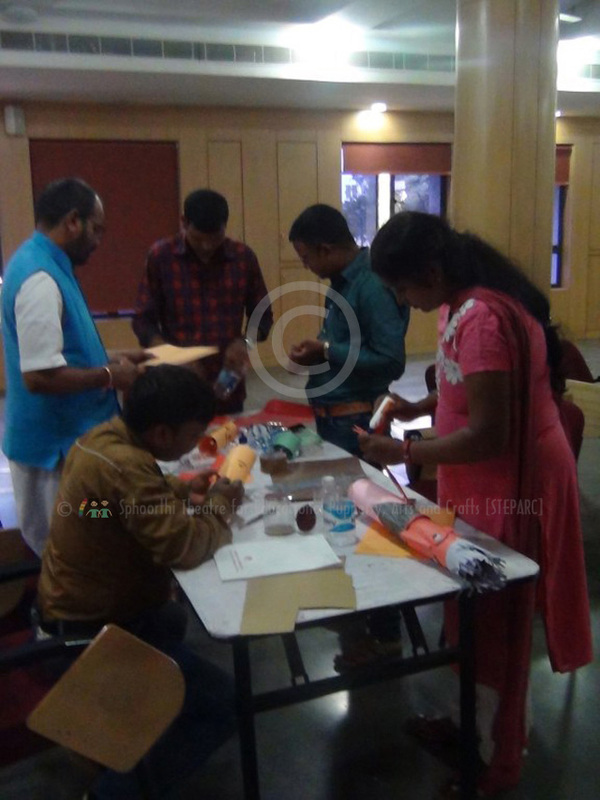 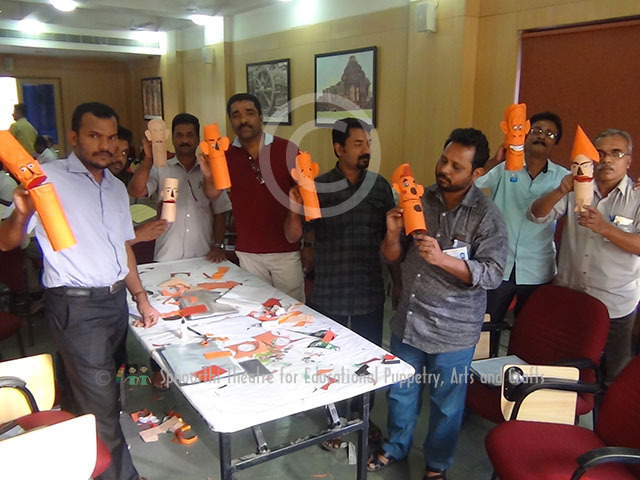 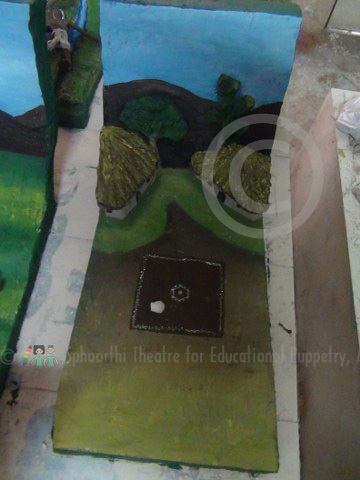 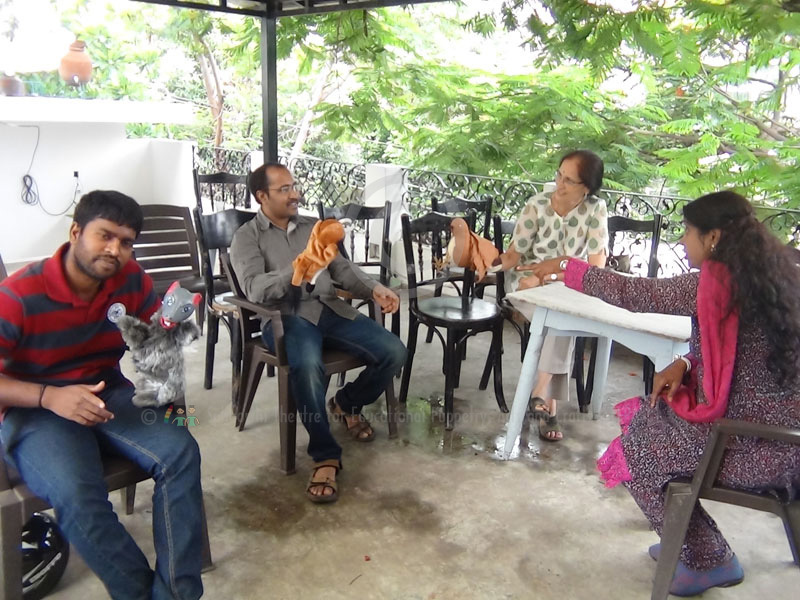 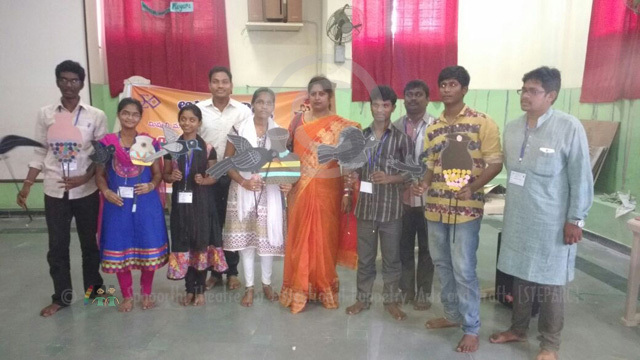 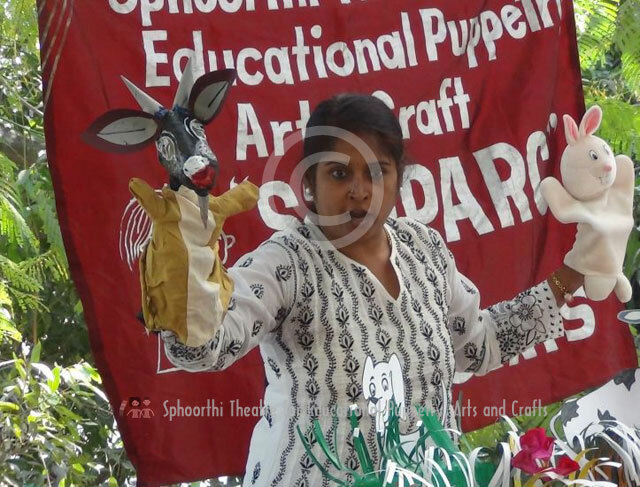 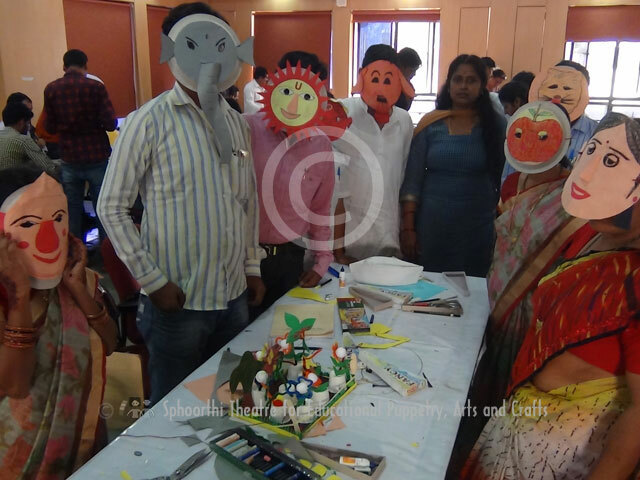 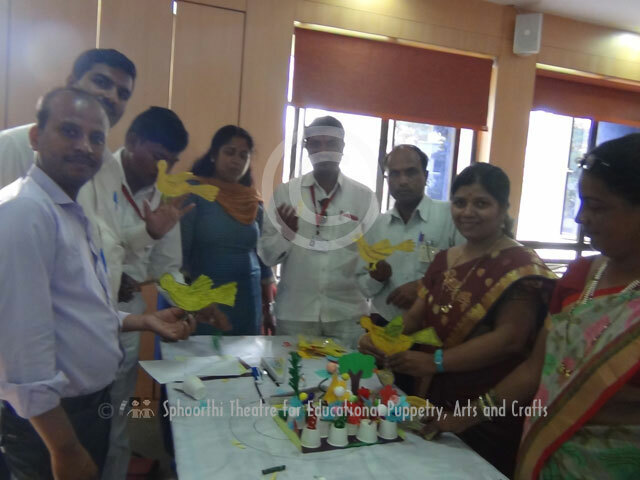 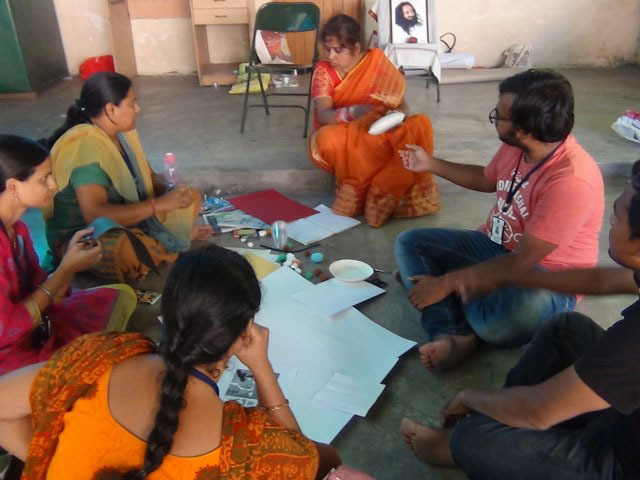 Sphoorthi Theatre conducted 3-Day 'Socks and Newspaper puppet making workshop for Parkinson disease Patients in association with Parkinson Society of Hyderabad and Dept of Neurology, Nizam Institute of Medical Sciences-, Hyderabad at , Hyderabad. 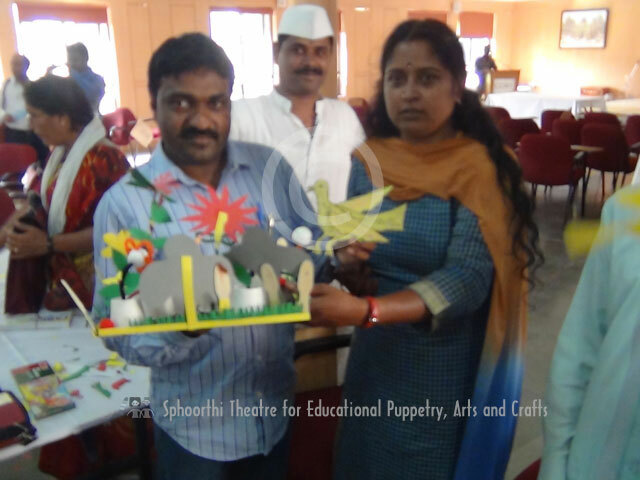 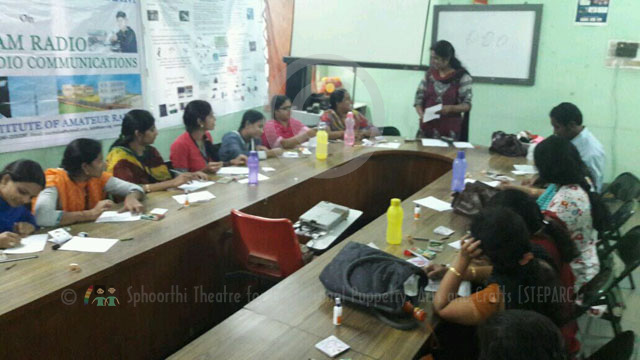 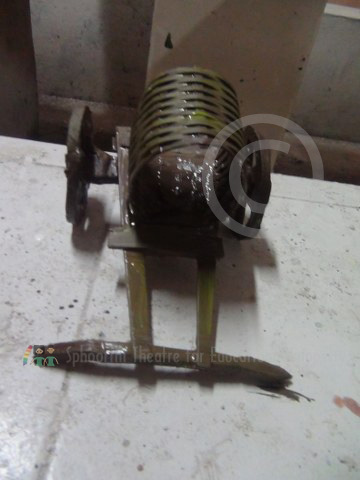 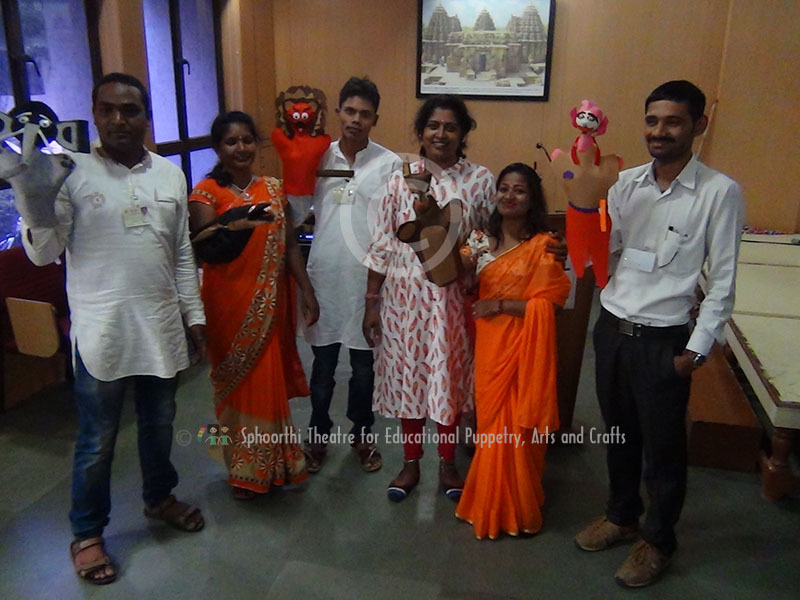 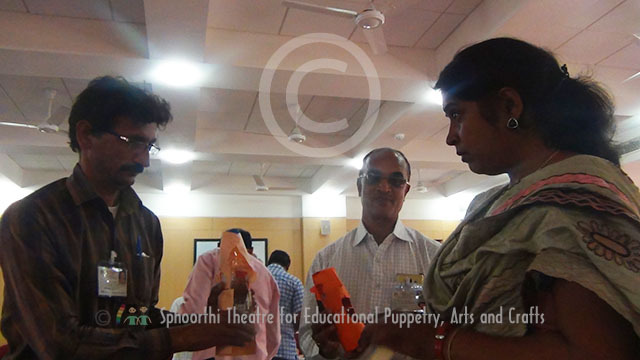 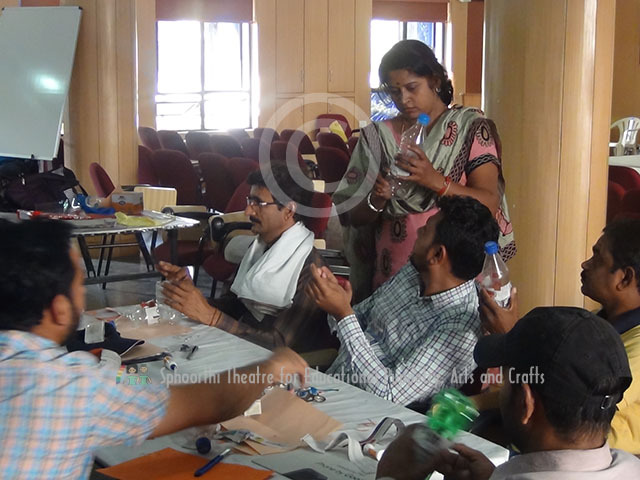 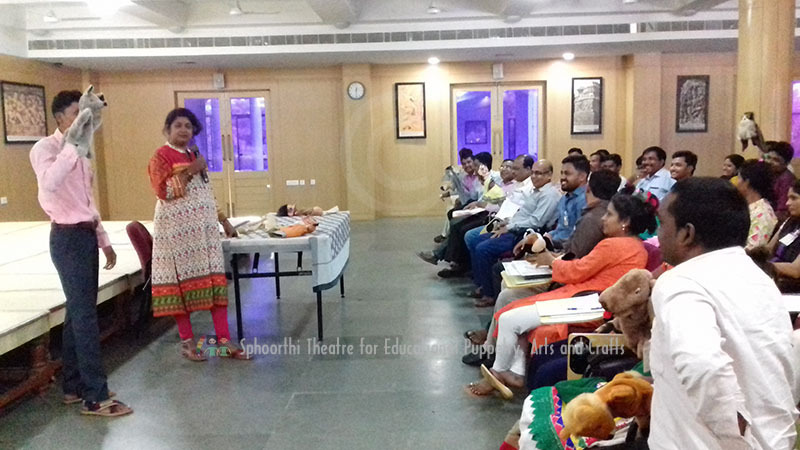 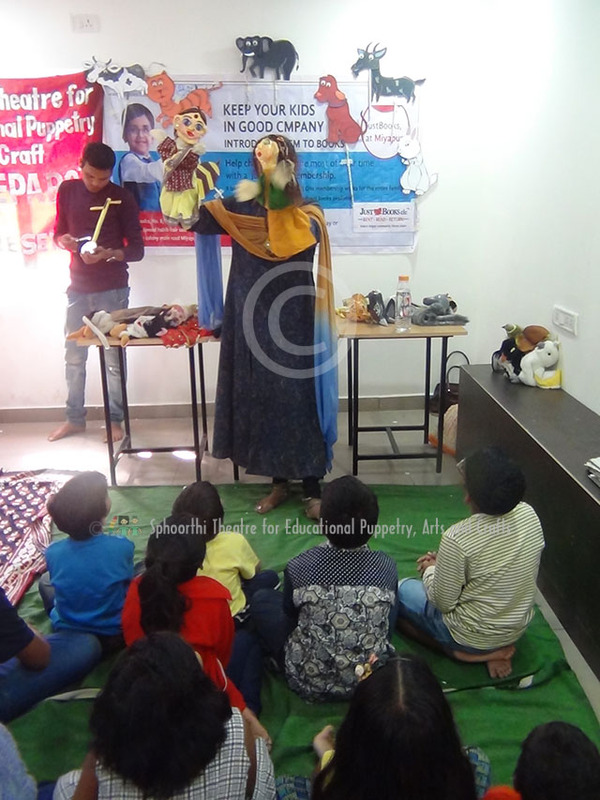 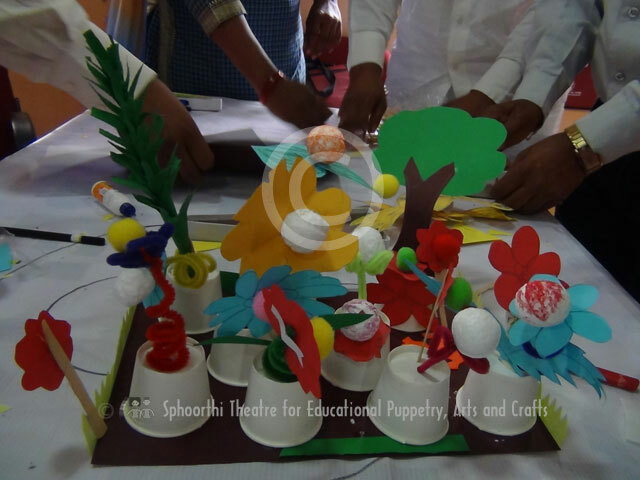 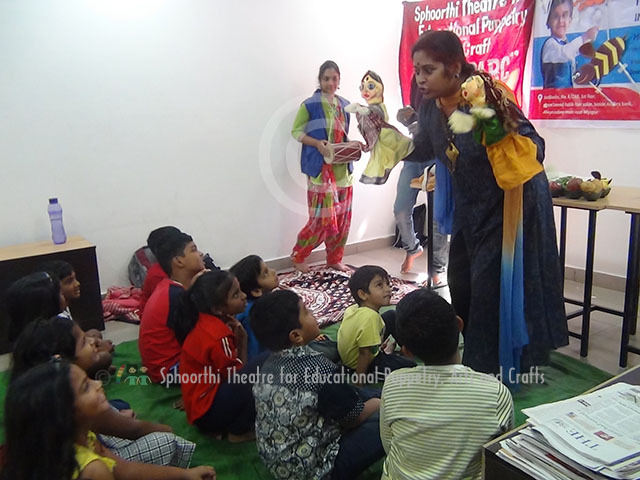 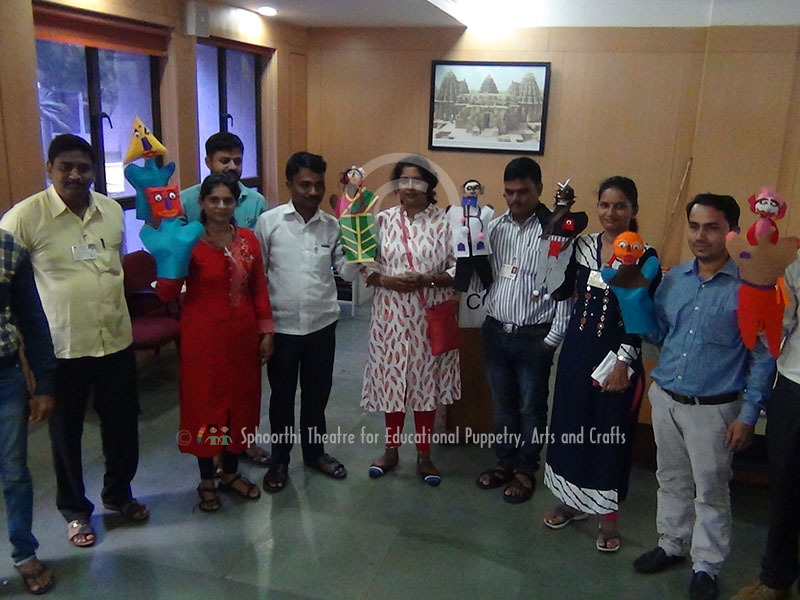 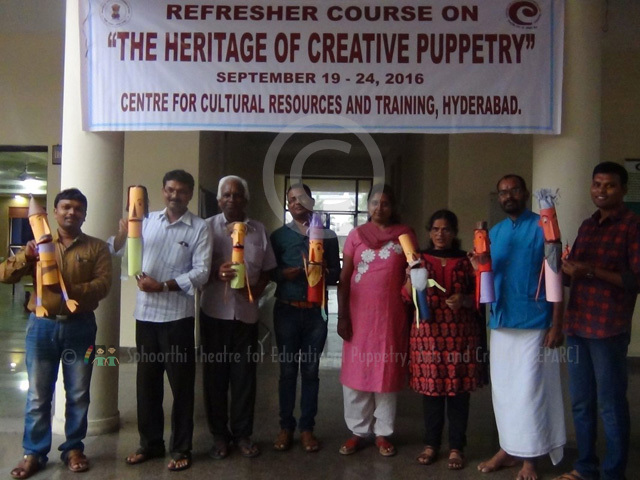 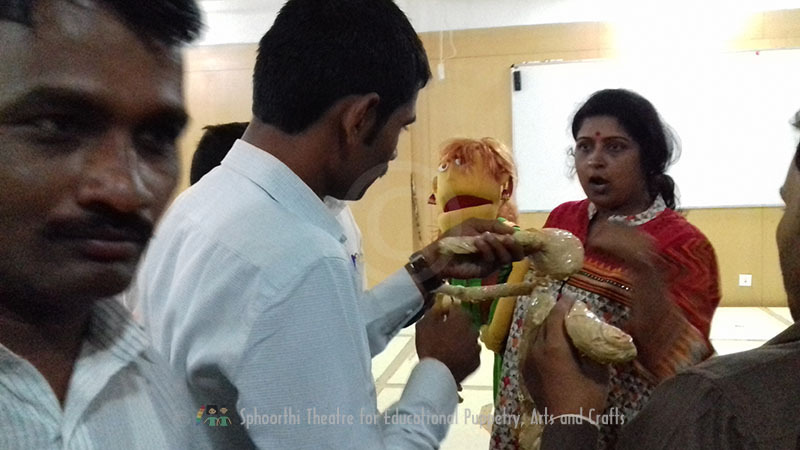 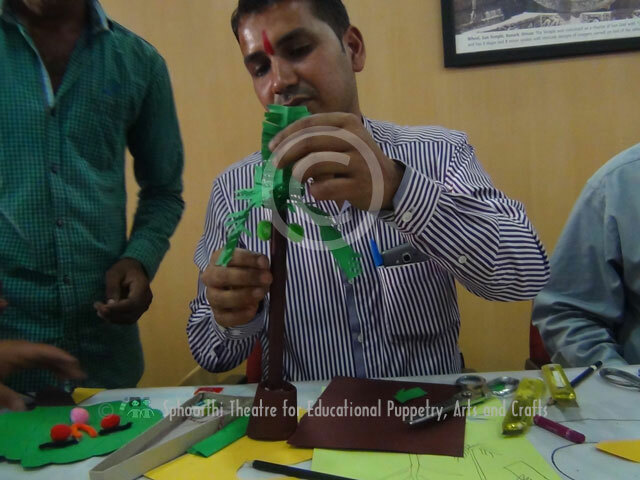 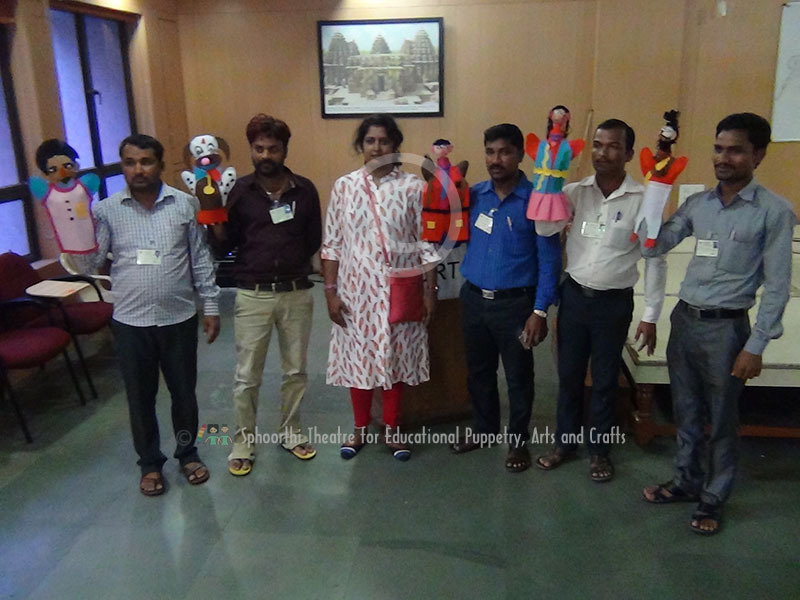 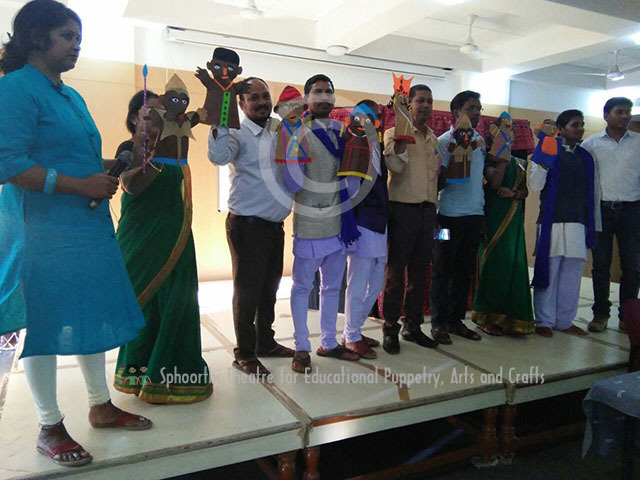 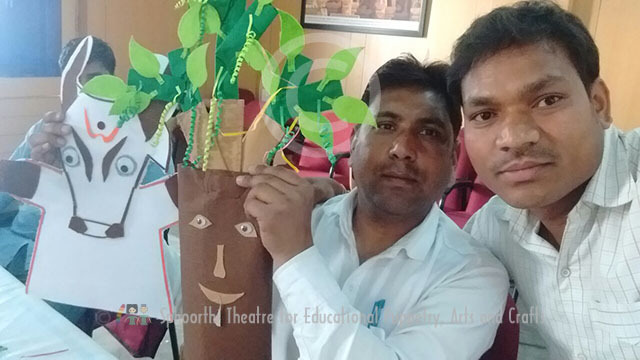 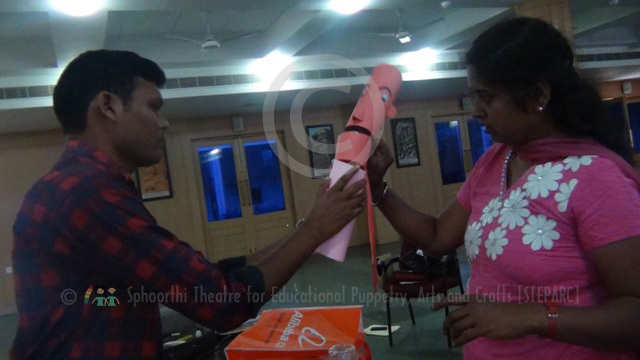 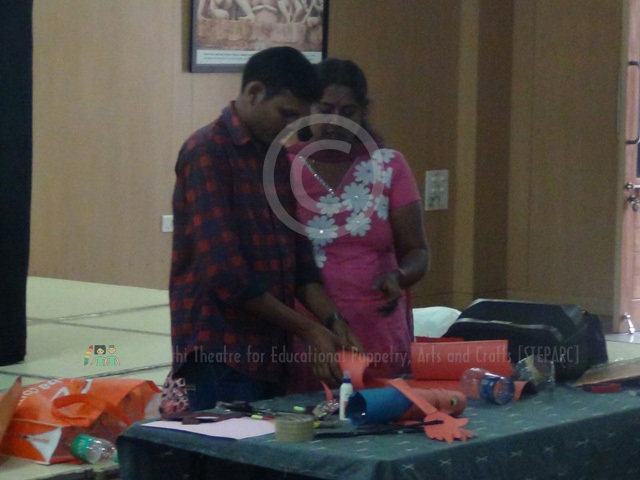 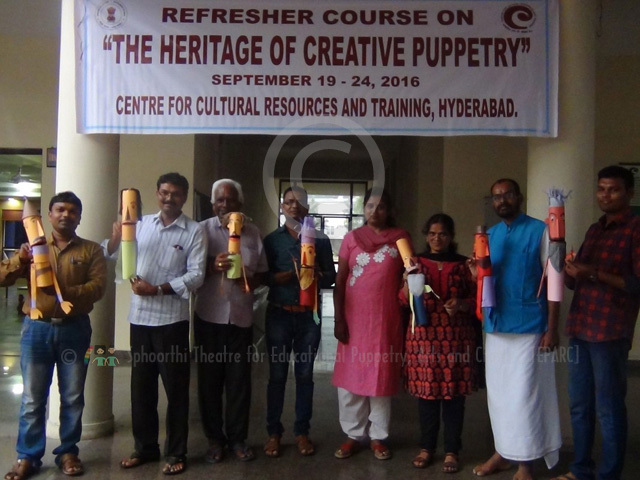 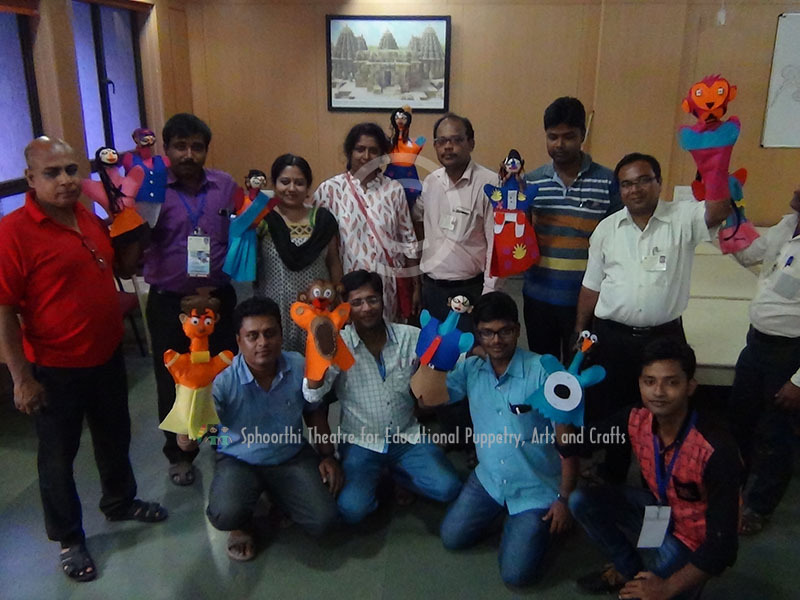 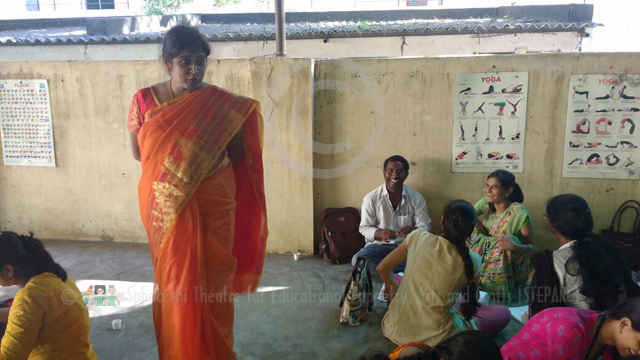 Sphoorthi Theatre conducted "Talking Rod Puppet making out of waste" for Government School Teachers under Refresher course on "The Heritage of Creative Puppetry" at Centre for Cultural and Resources and Training- CCRT, Hyderabad on July 6-7, 2017. 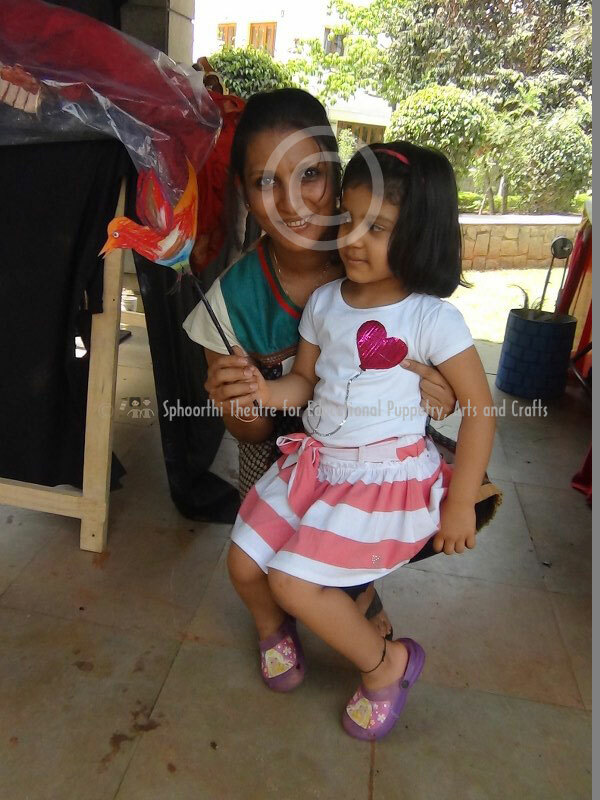 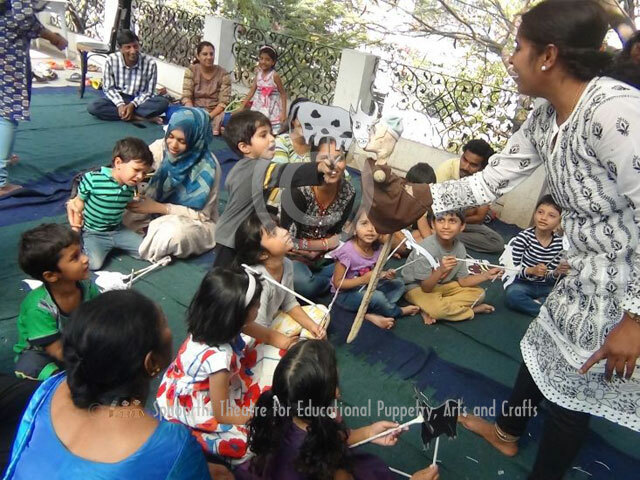 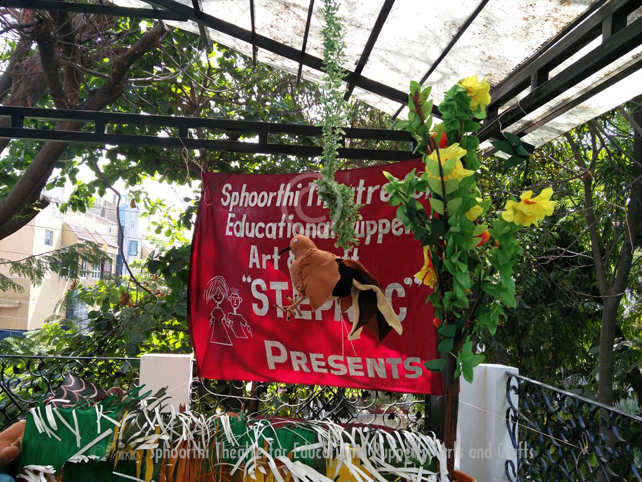 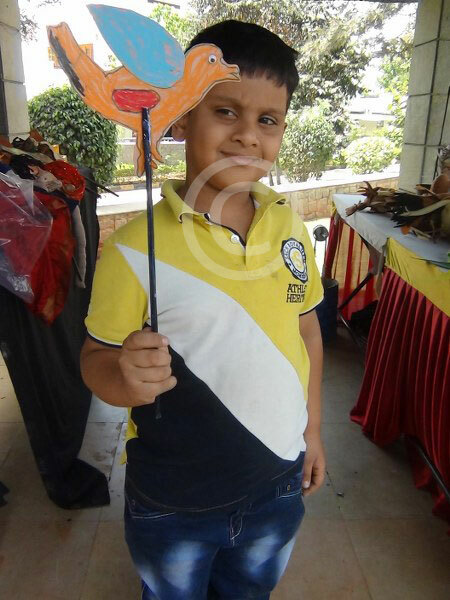 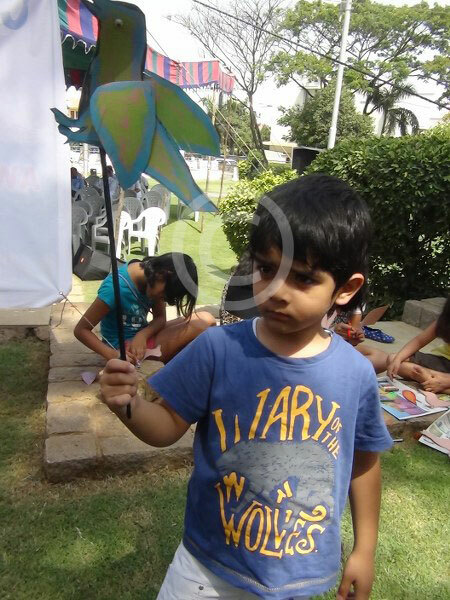 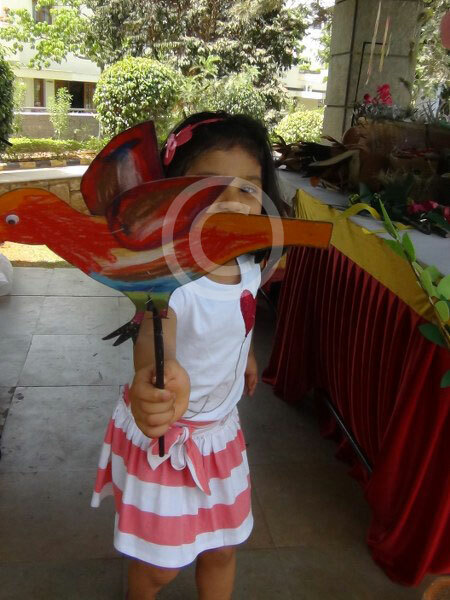 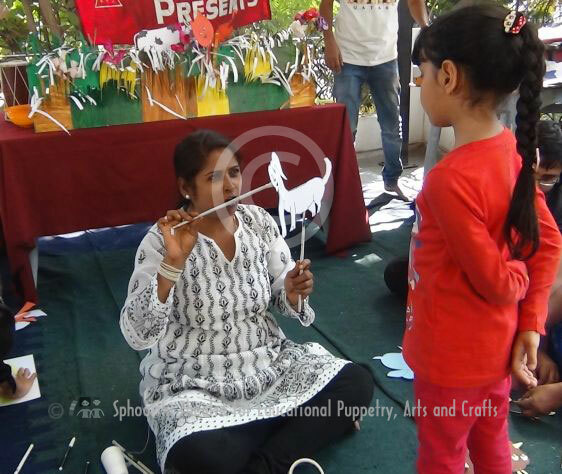 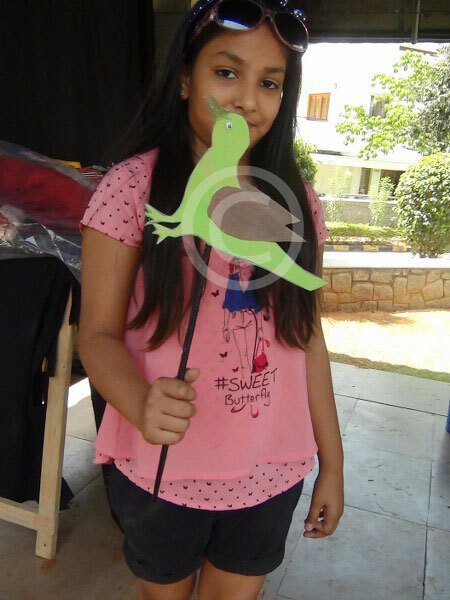 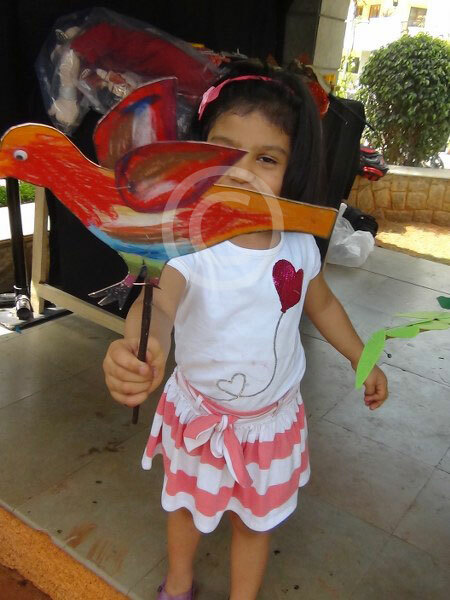 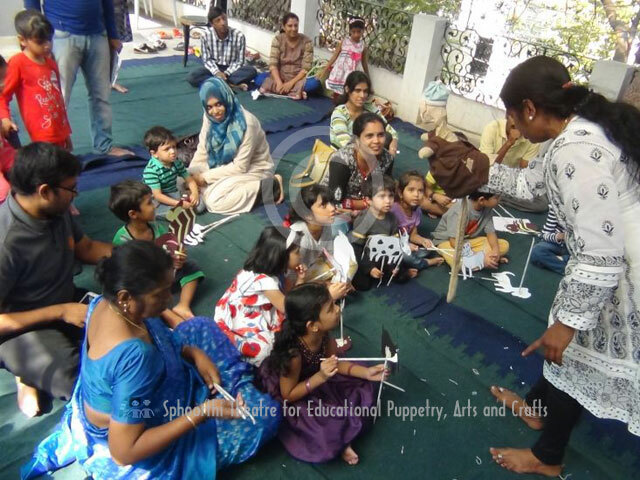 Bird Stick Puppet making with moving wings at Lamakaan-an Open Cultural Space, Road no1, Banjara Hills, Hyderabad on March 19, 2017. 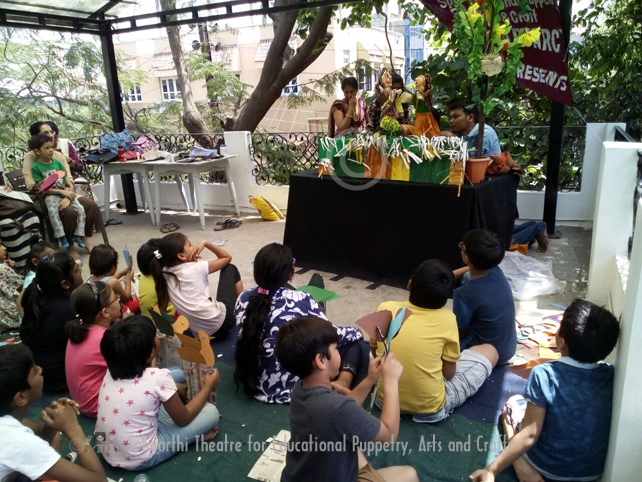 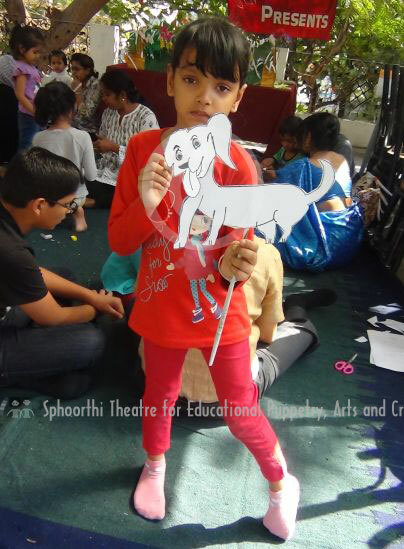 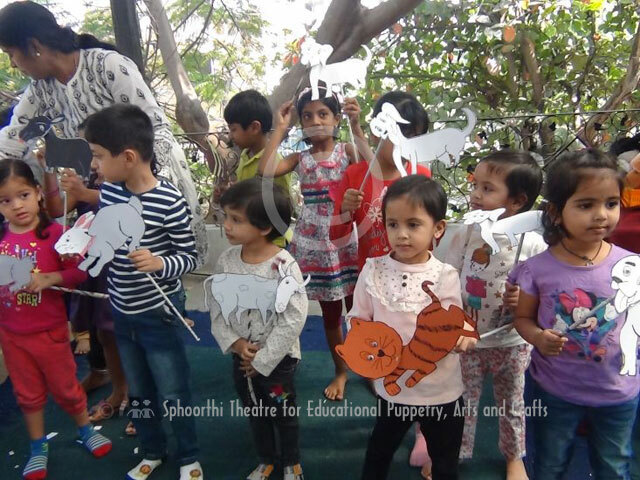 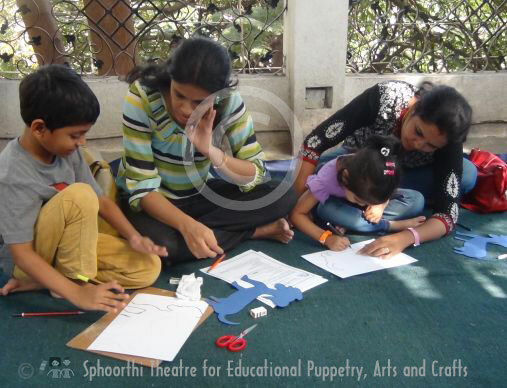 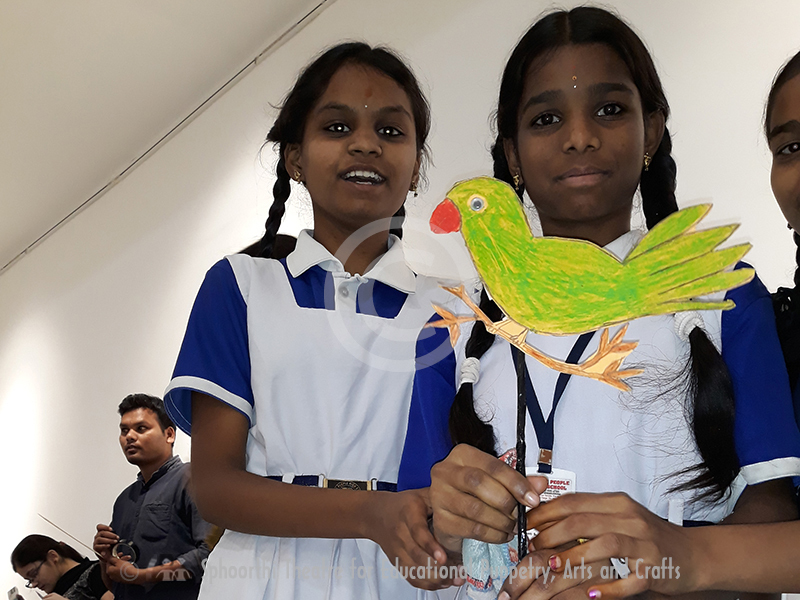 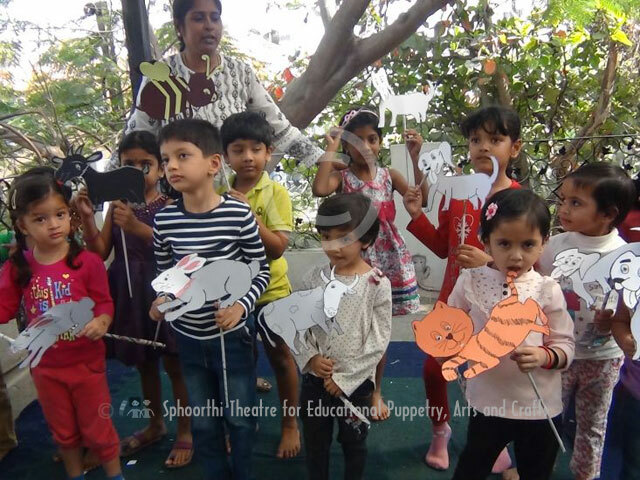 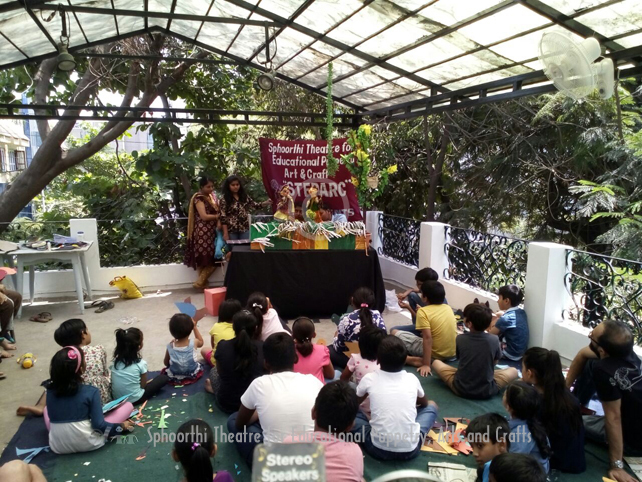 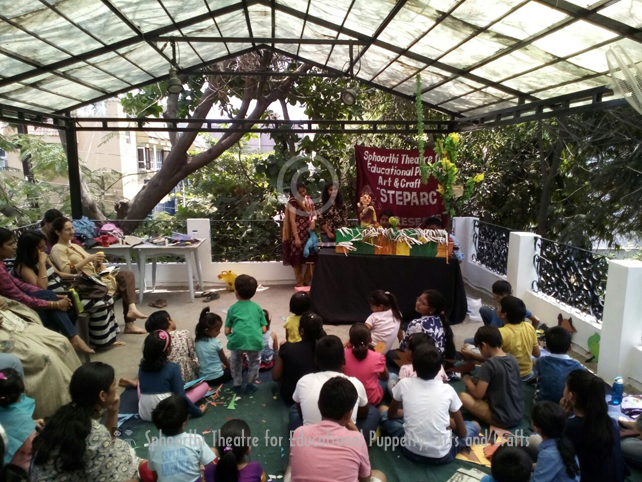 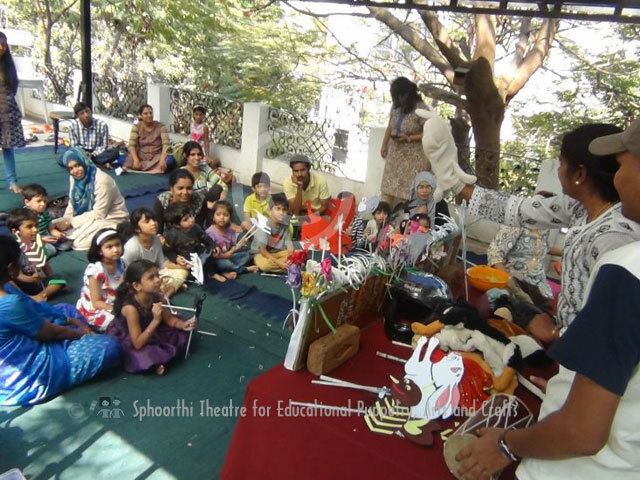 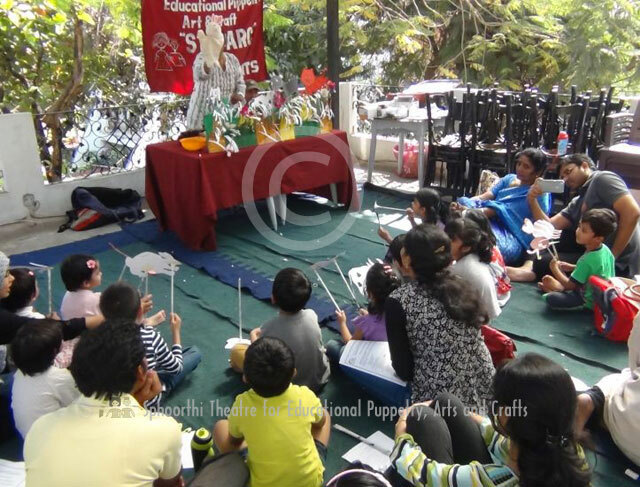 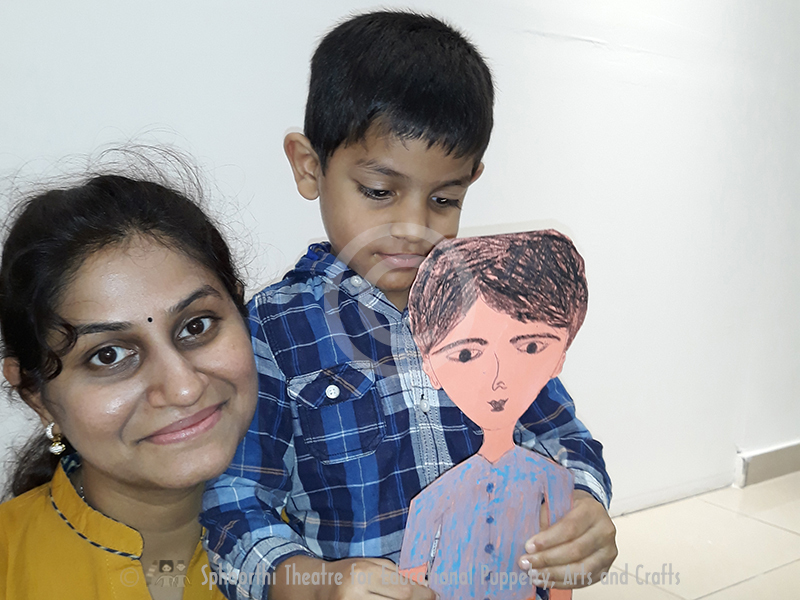 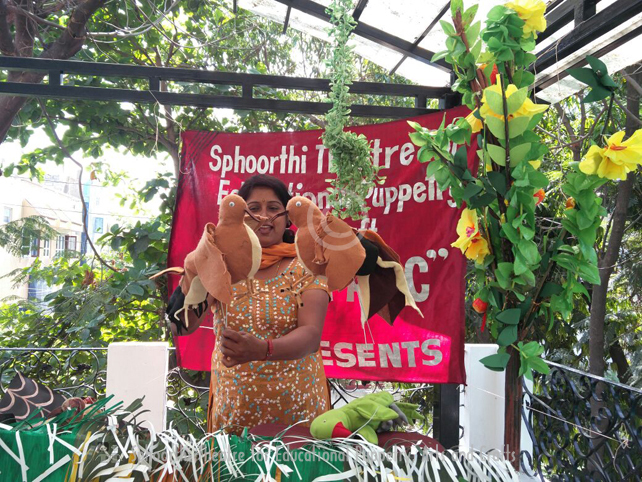 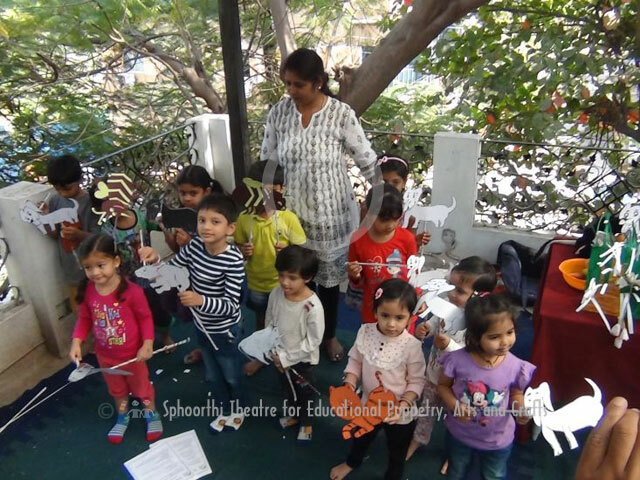 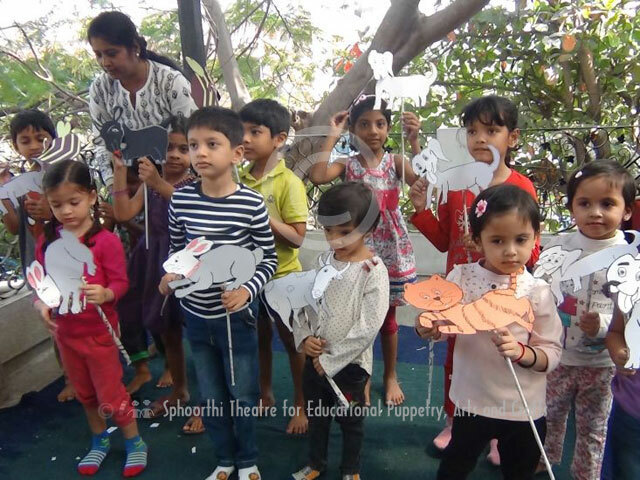 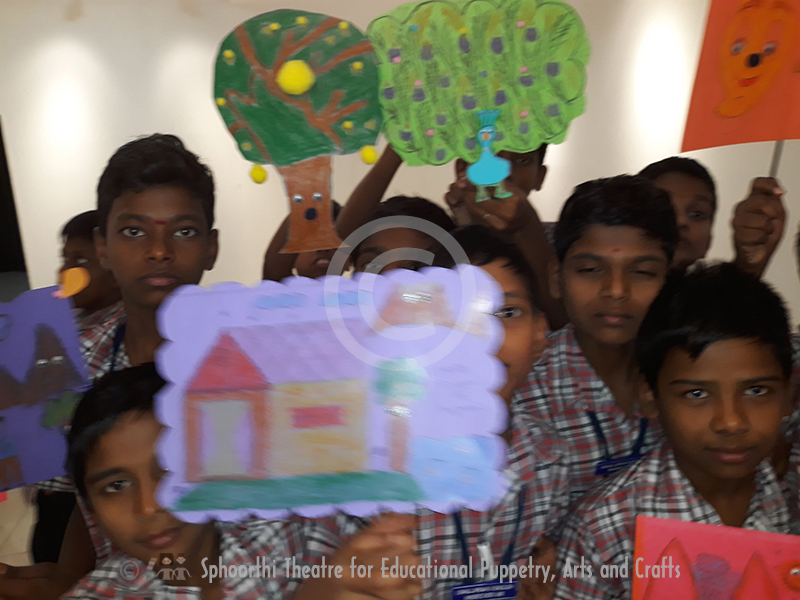 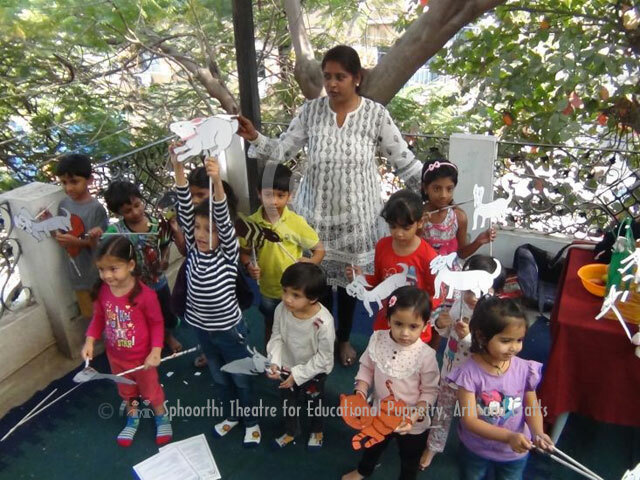 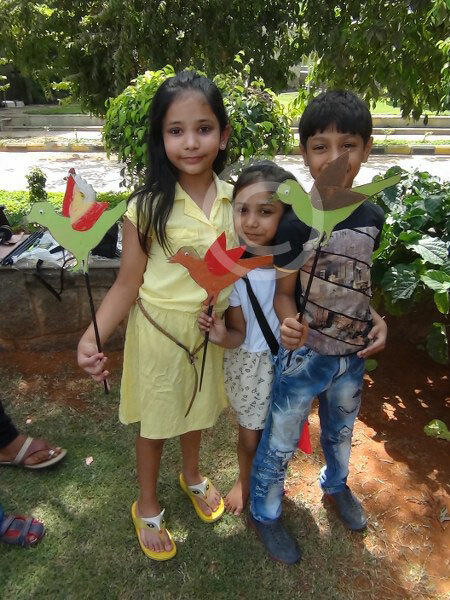 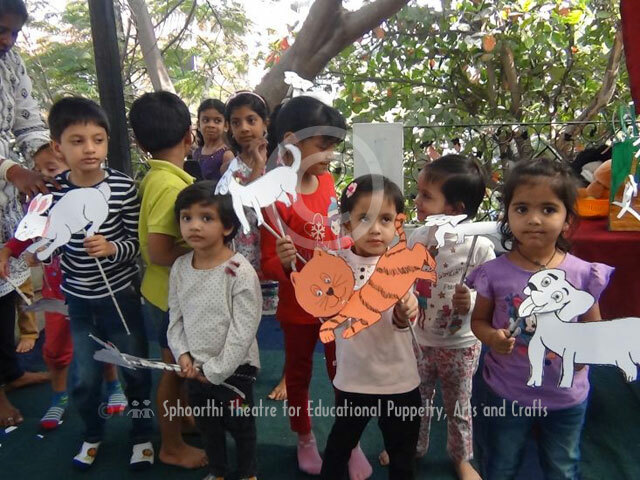 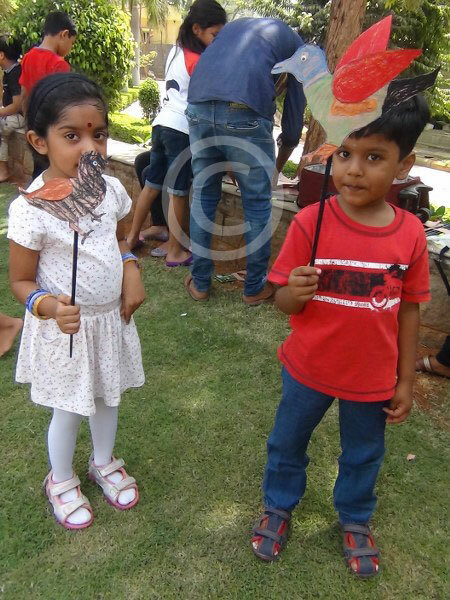 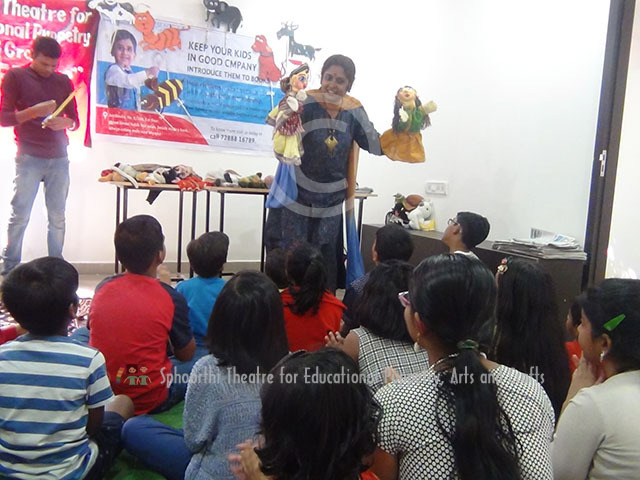 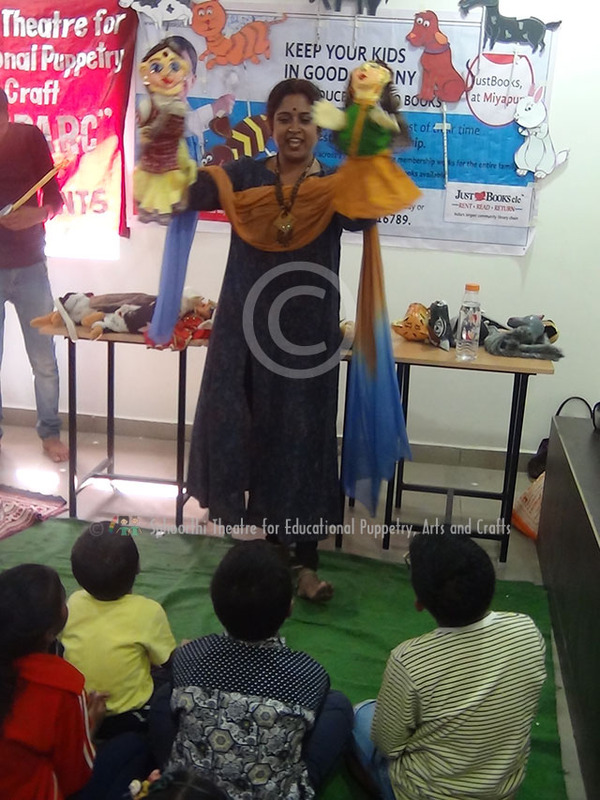 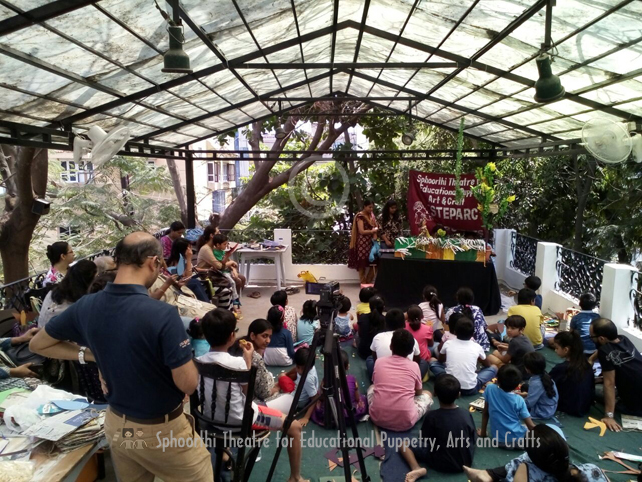 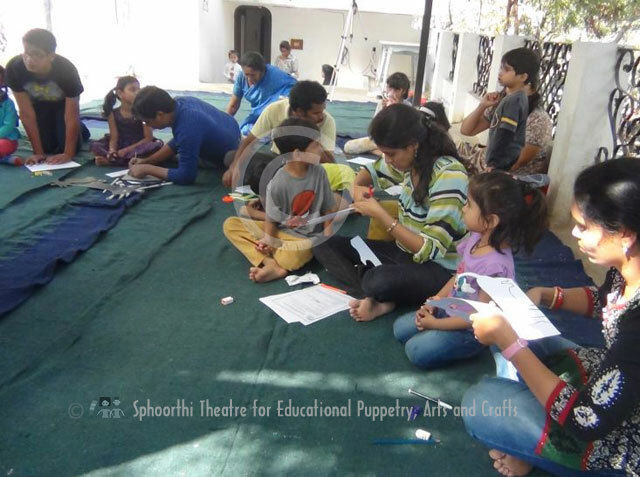 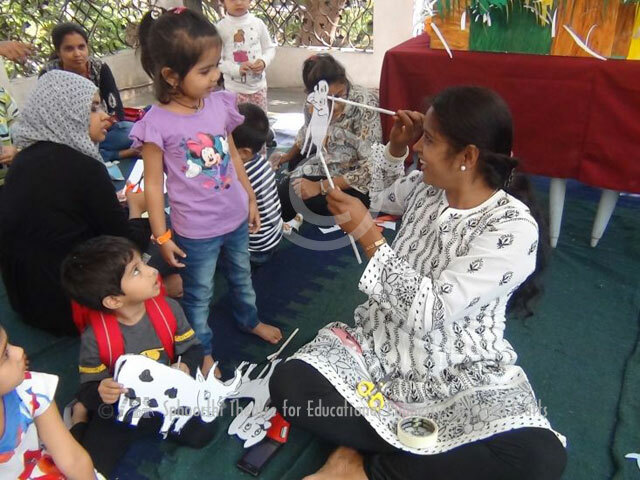 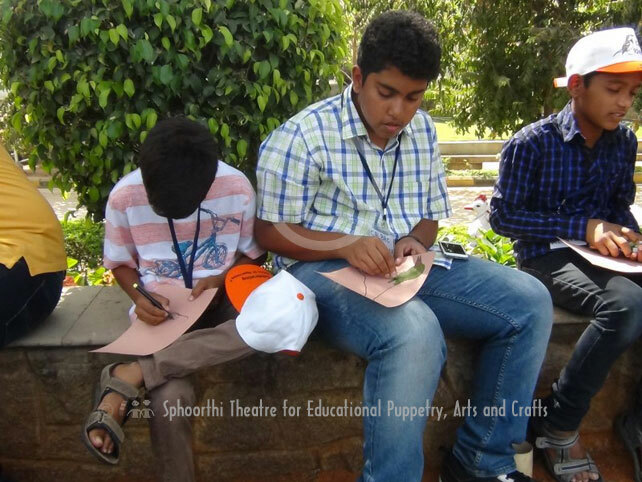 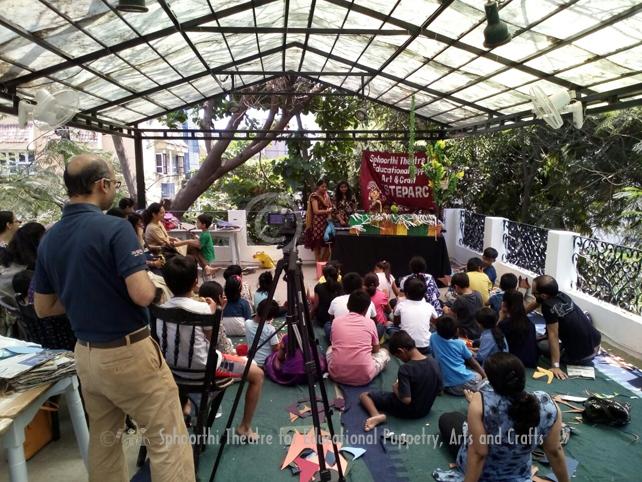 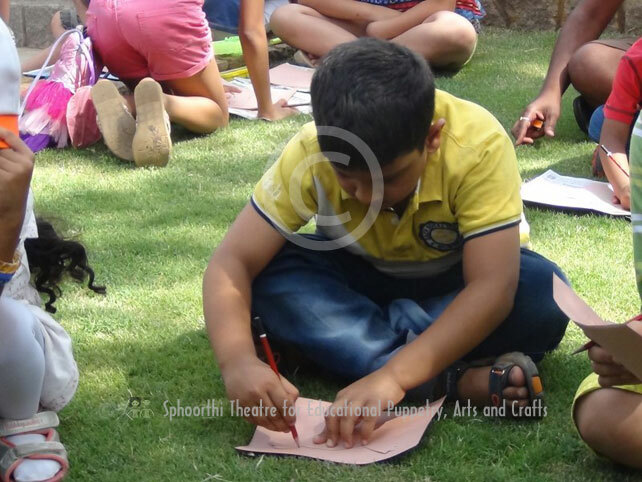 Bird Stick puppet making followed by puppet play on "Story of Balamani and Yadagiri-the sparrow couple" on March 19, 2017 at Lamakaan. 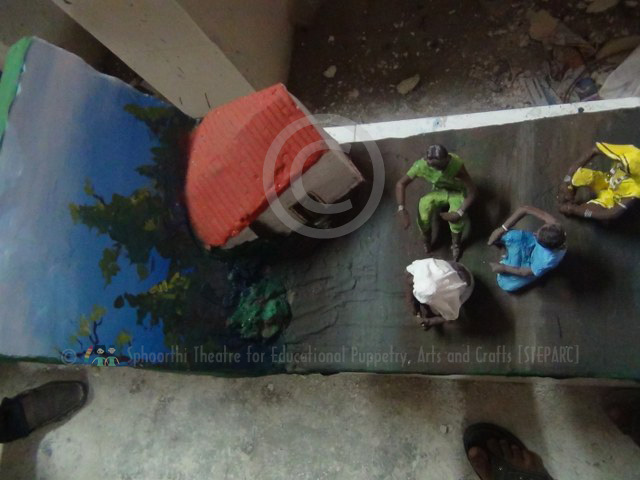 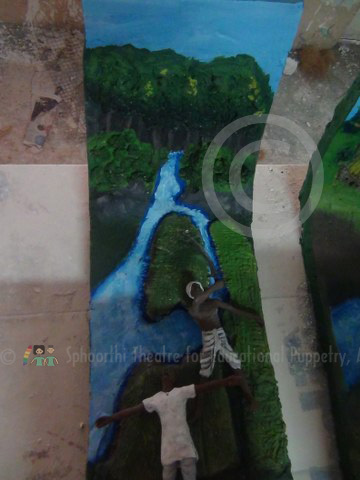 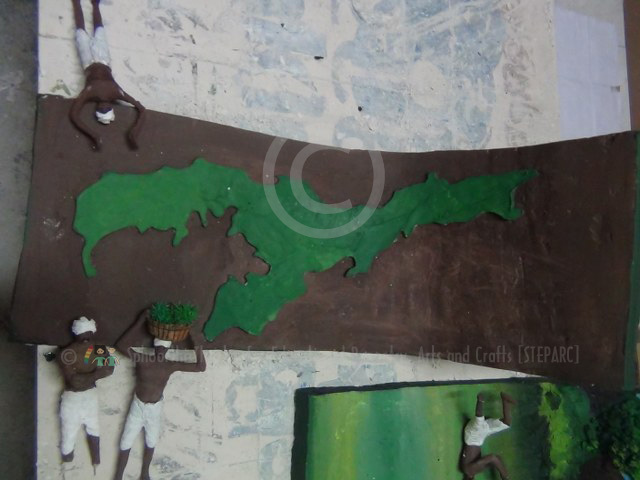 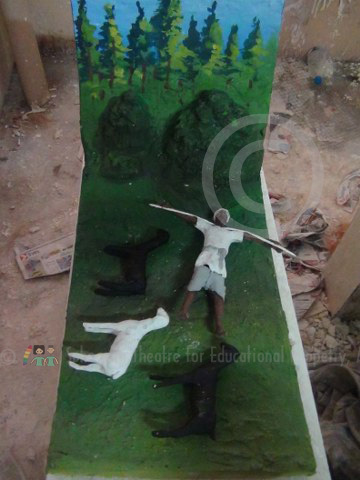 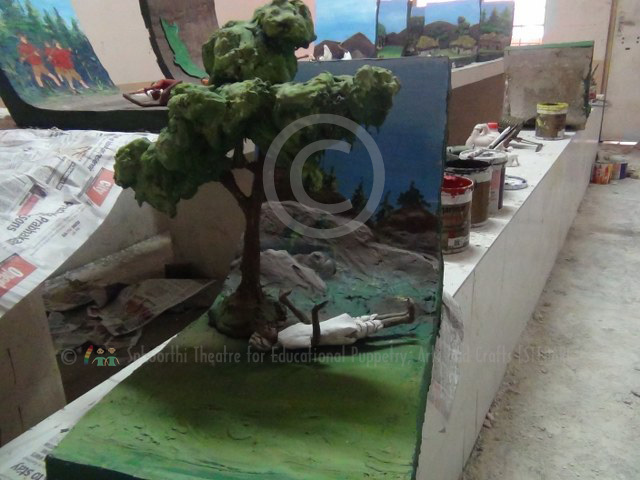 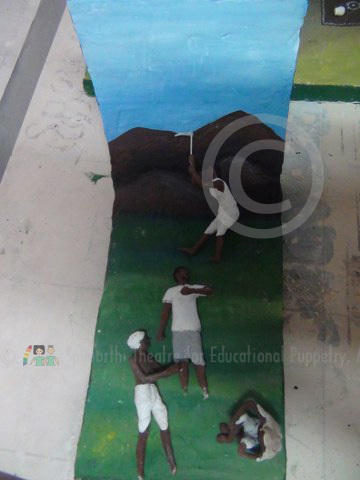 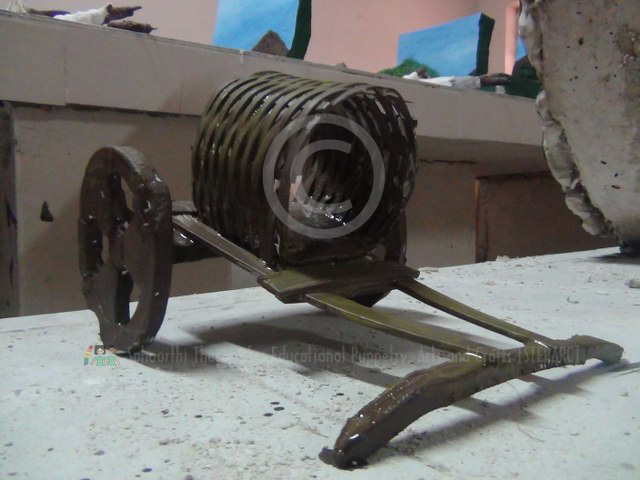 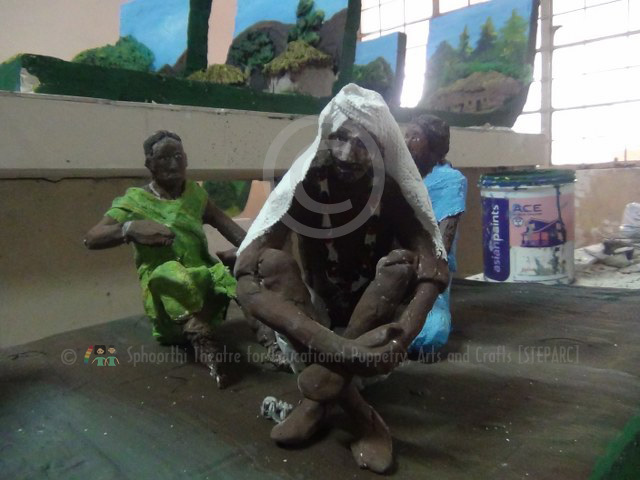 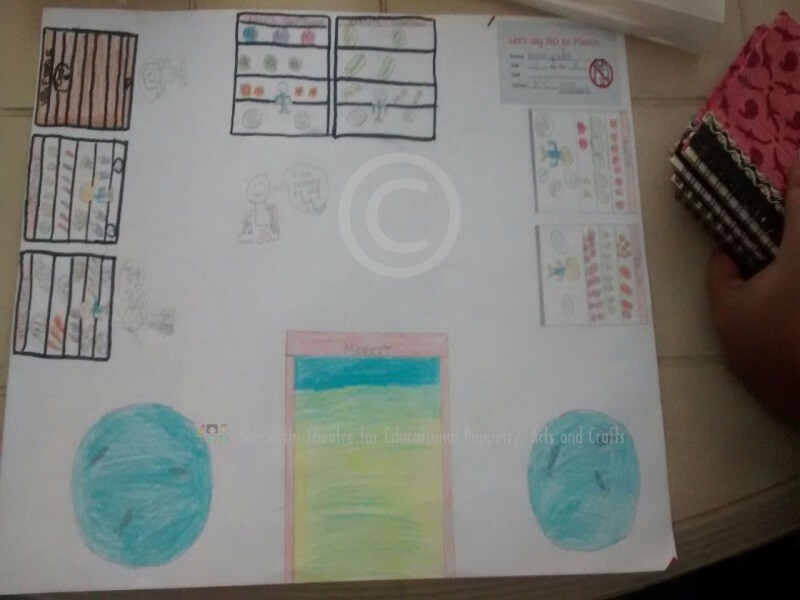 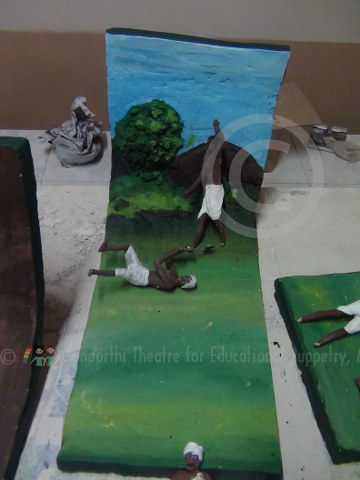 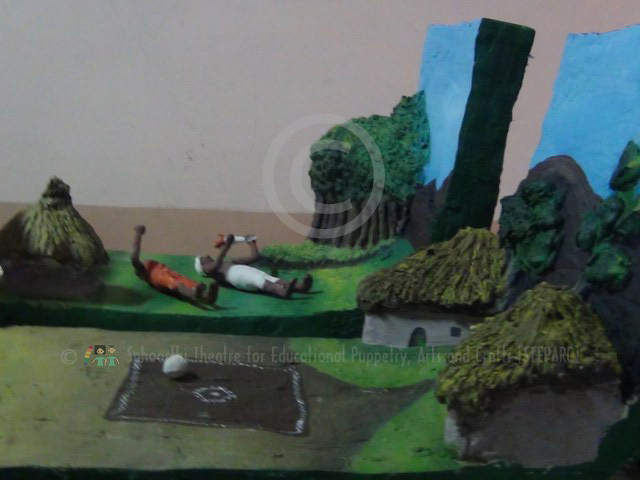 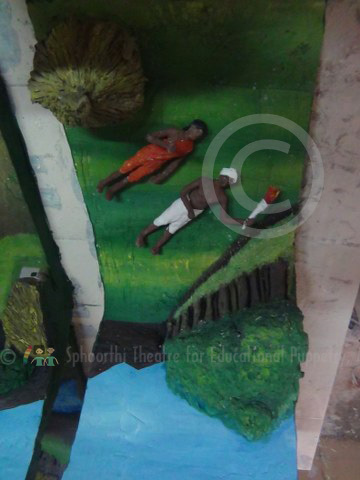 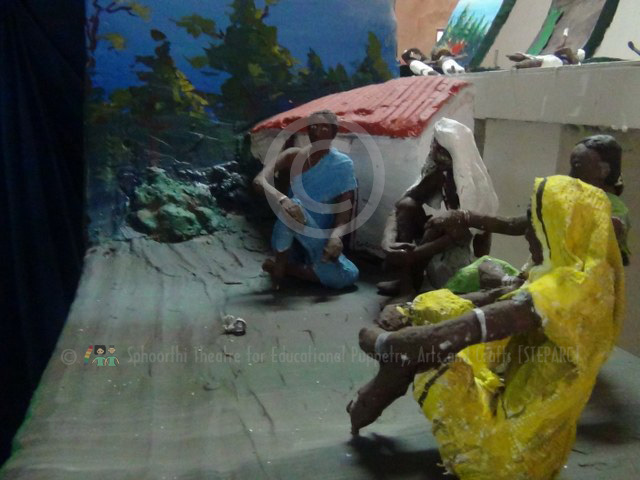 "Martyr Kumram Bheem Life Story Extending Relief Mural with Miniature Sculpture Project" for Museum Set up at Martyr Kumram Bheem museum, Jodenghat, Kerimeri mandal Adilabad, Telangana State. 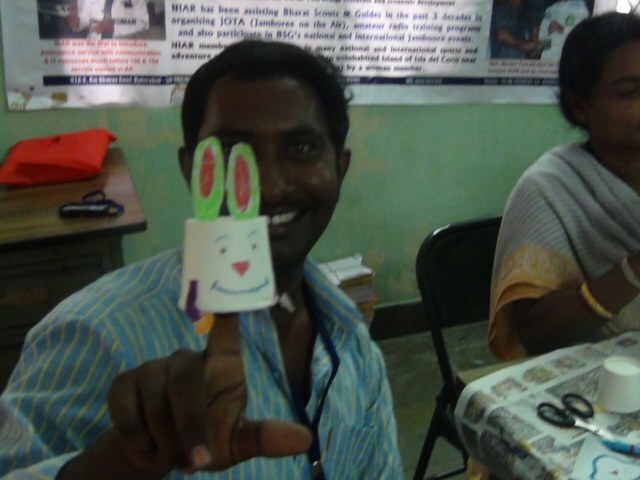 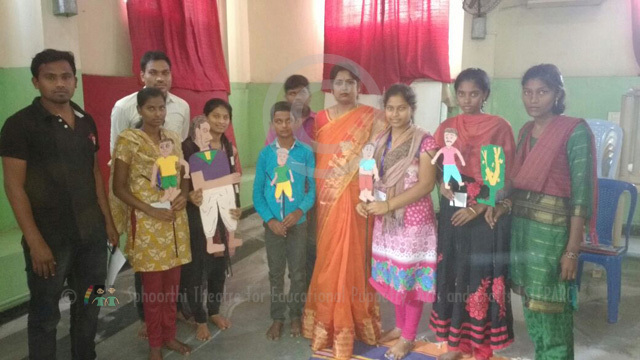 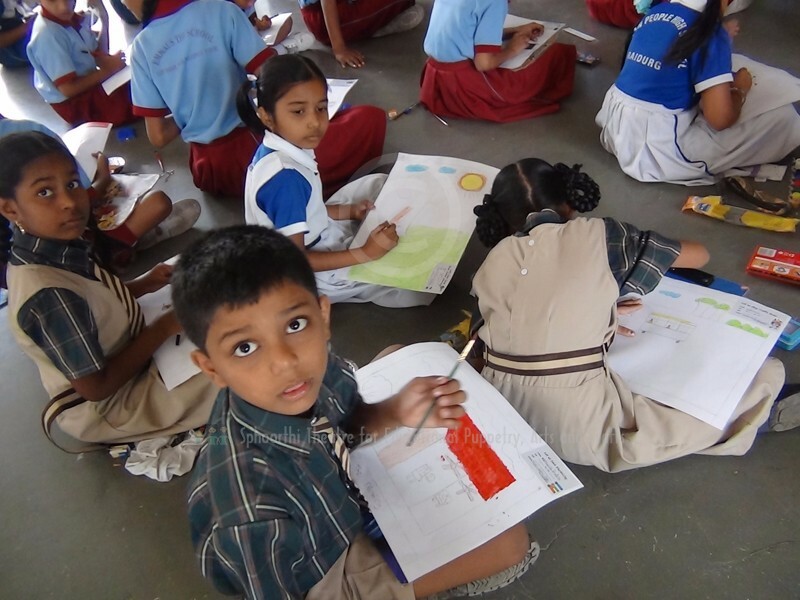 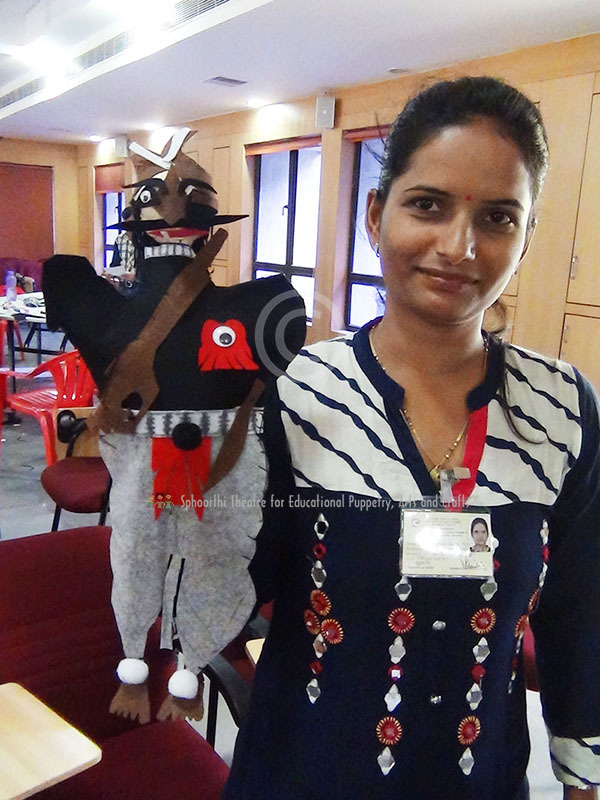 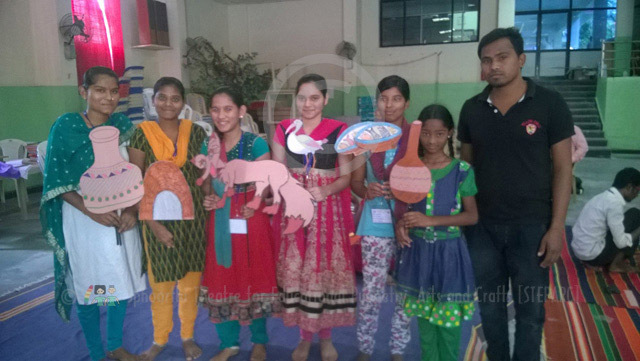 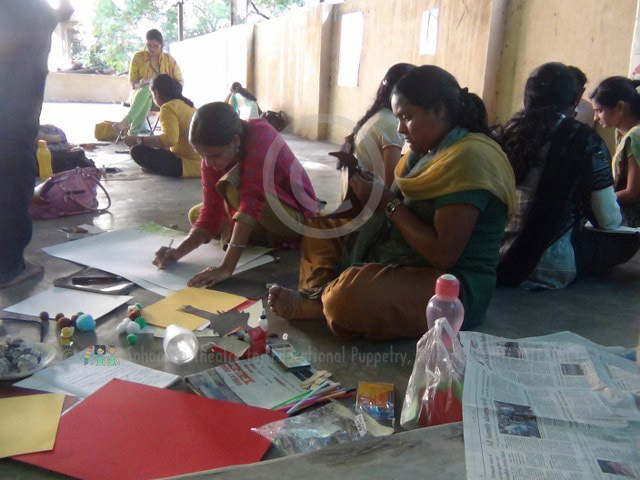 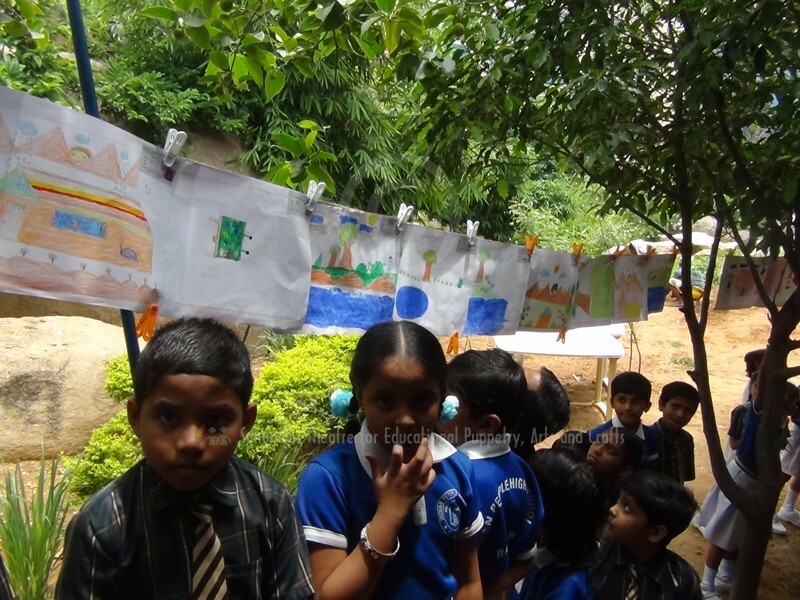 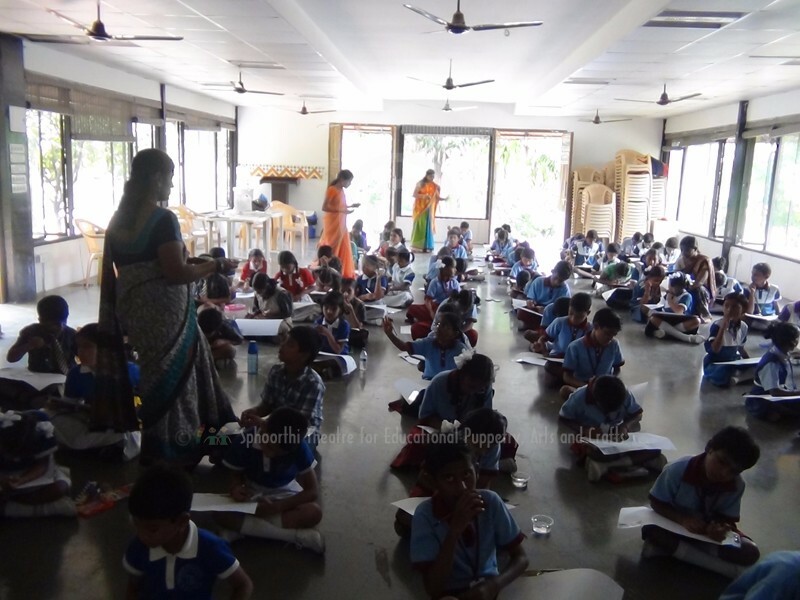 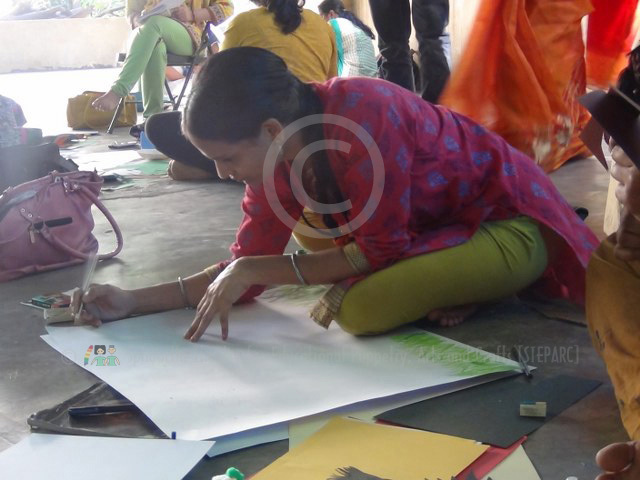 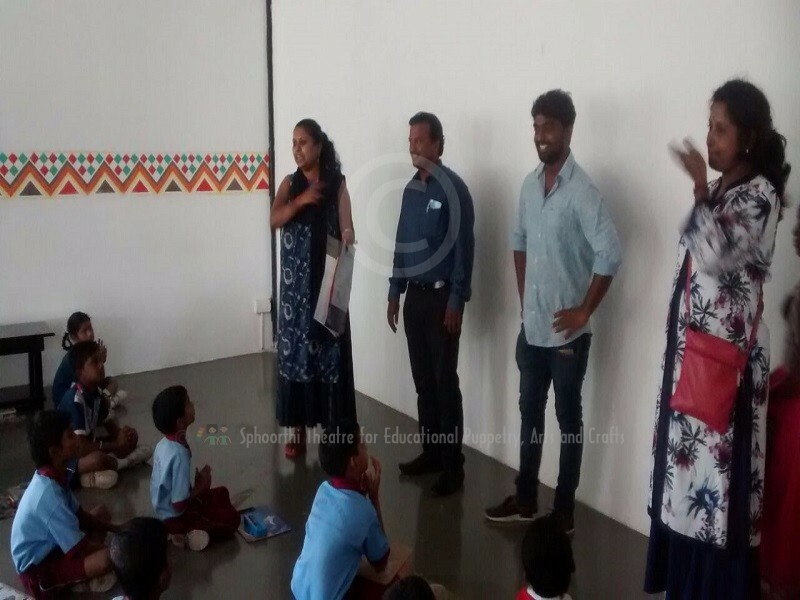 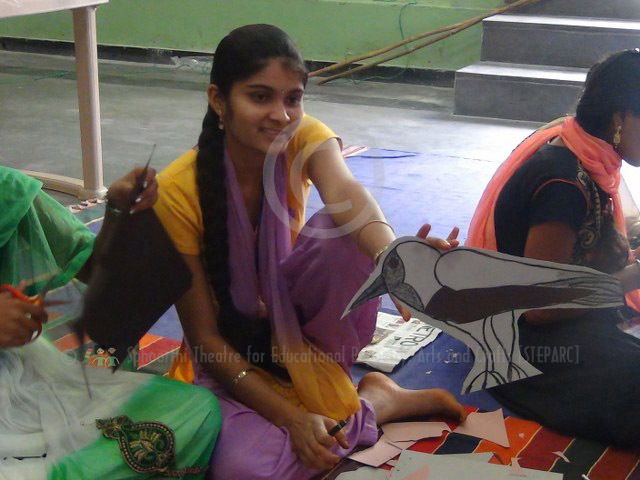 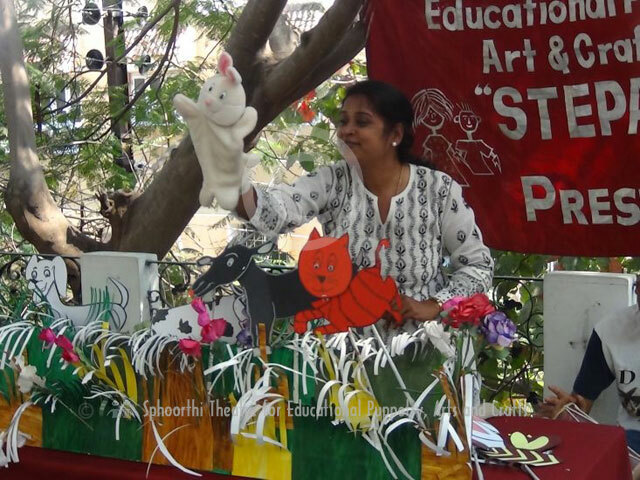 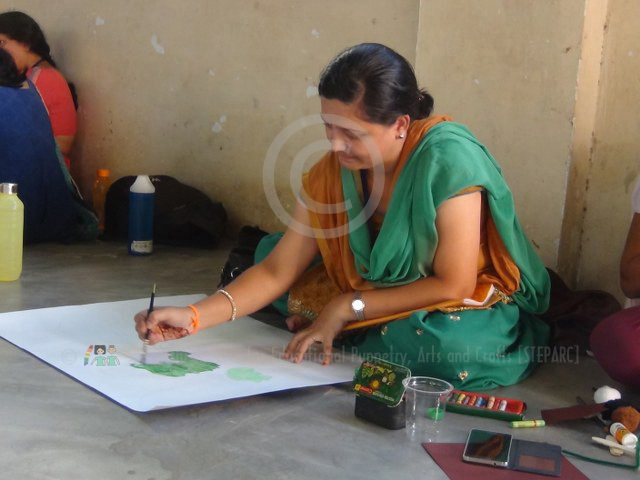 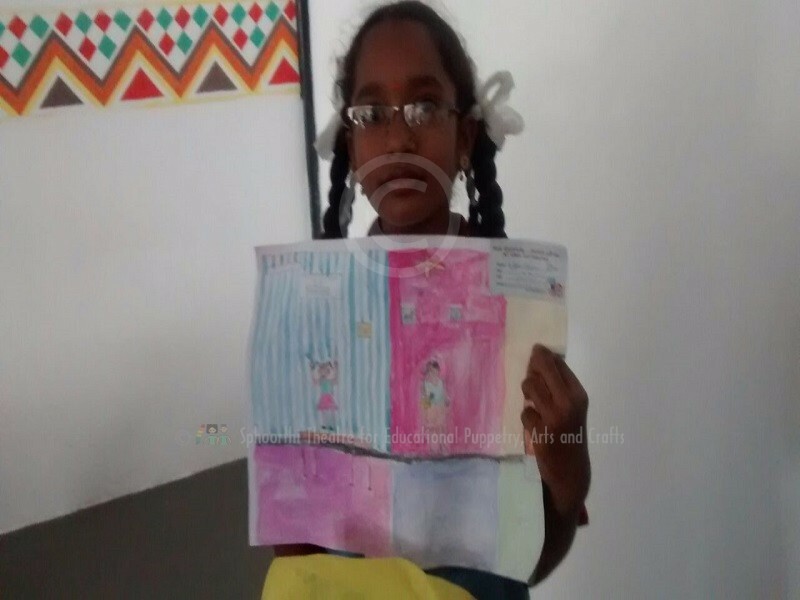 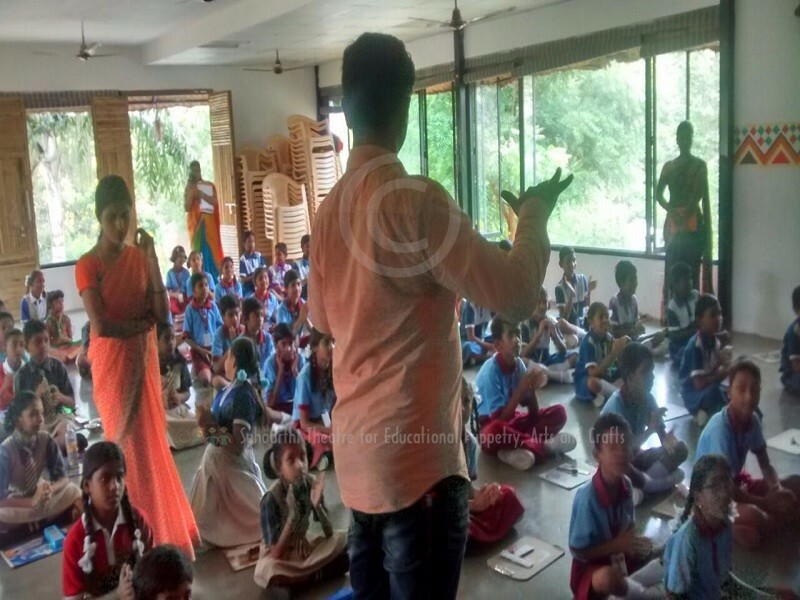 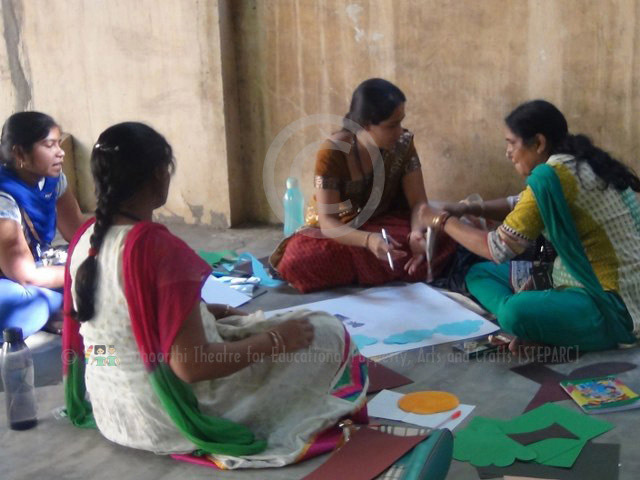 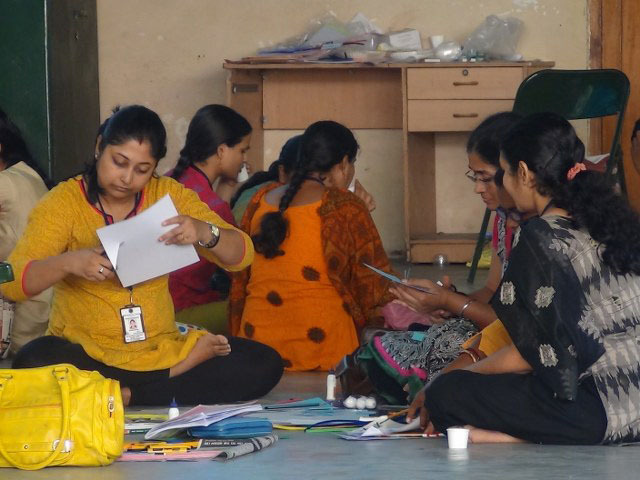 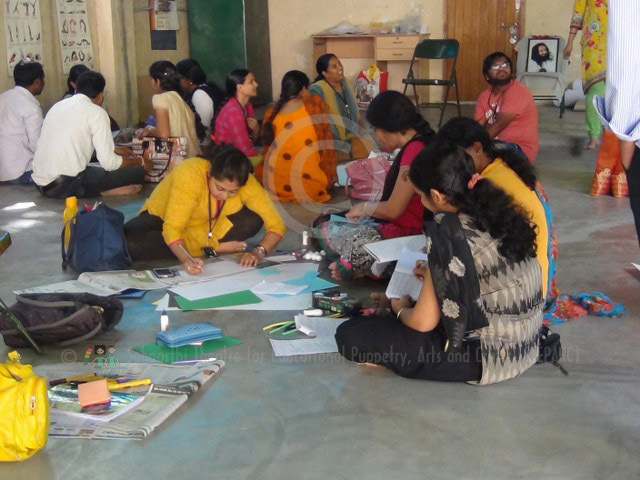 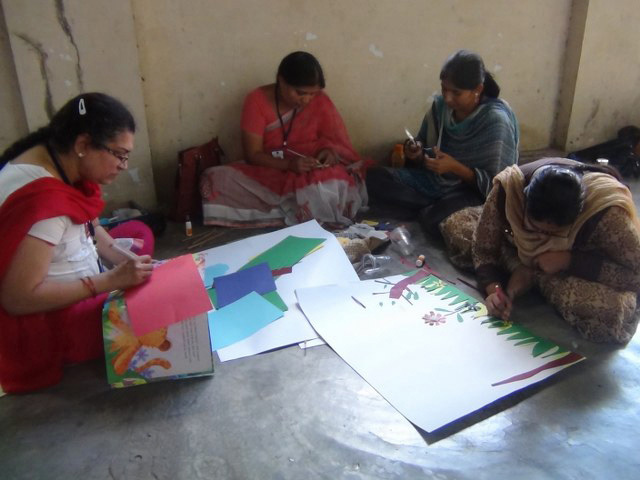 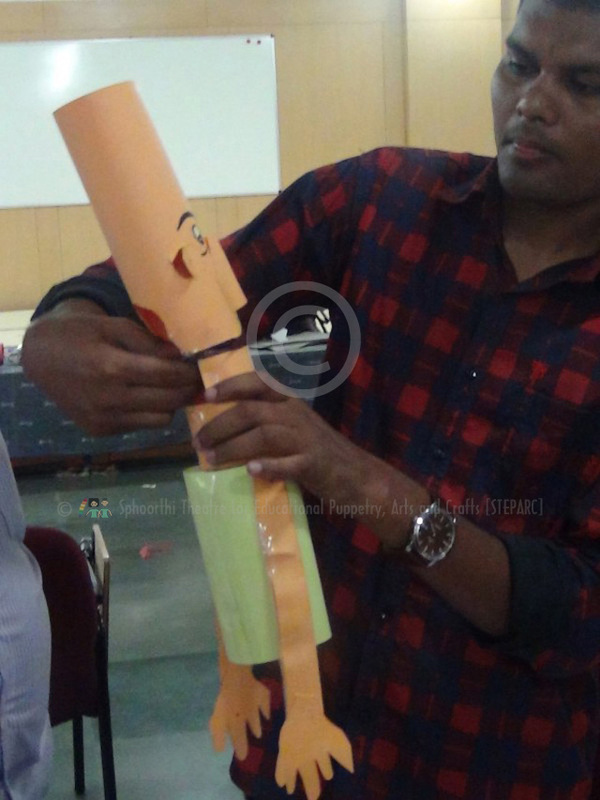 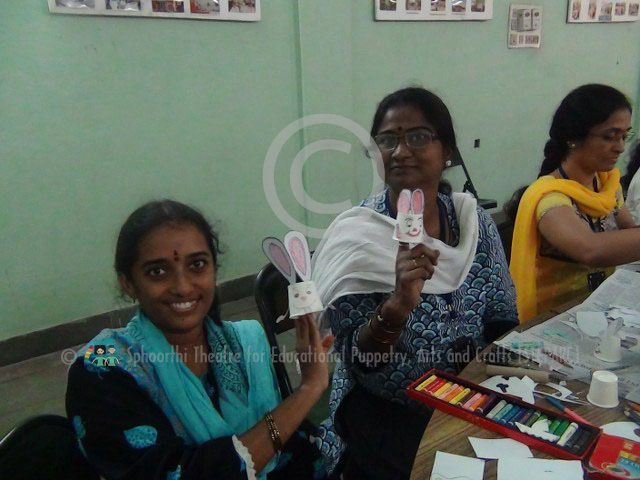 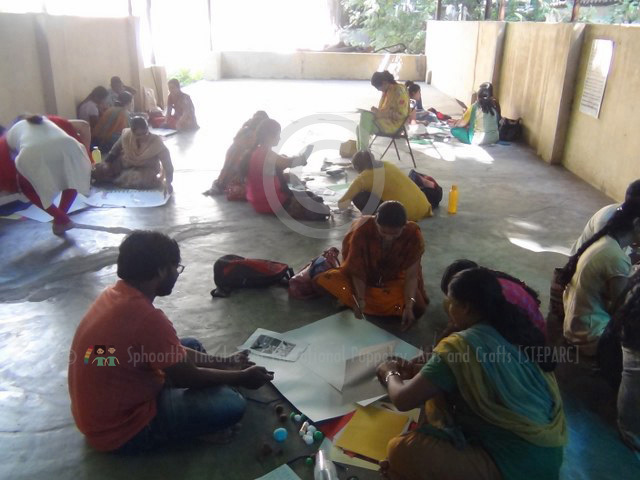 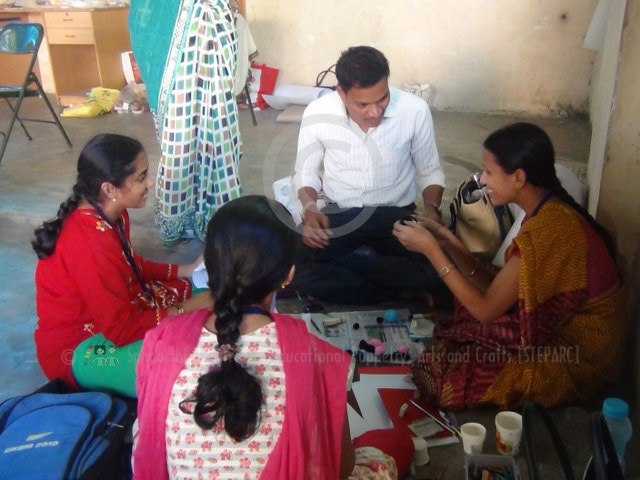 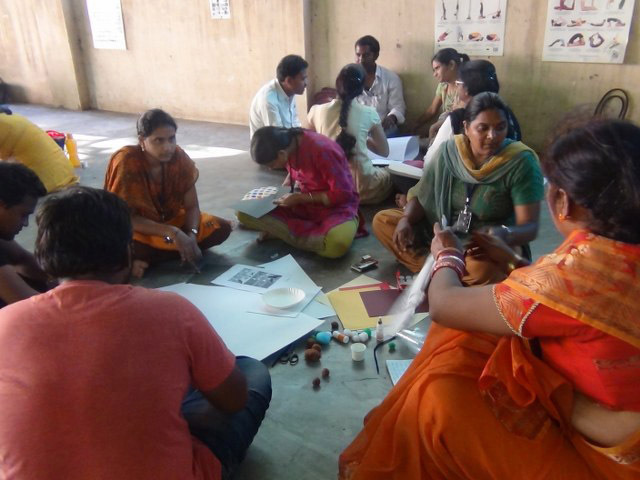 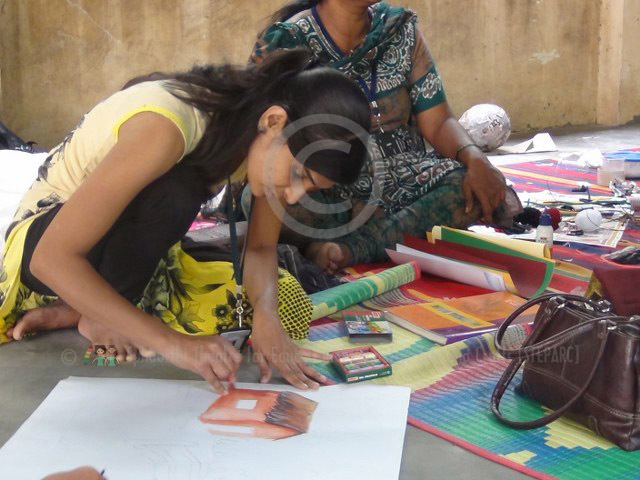 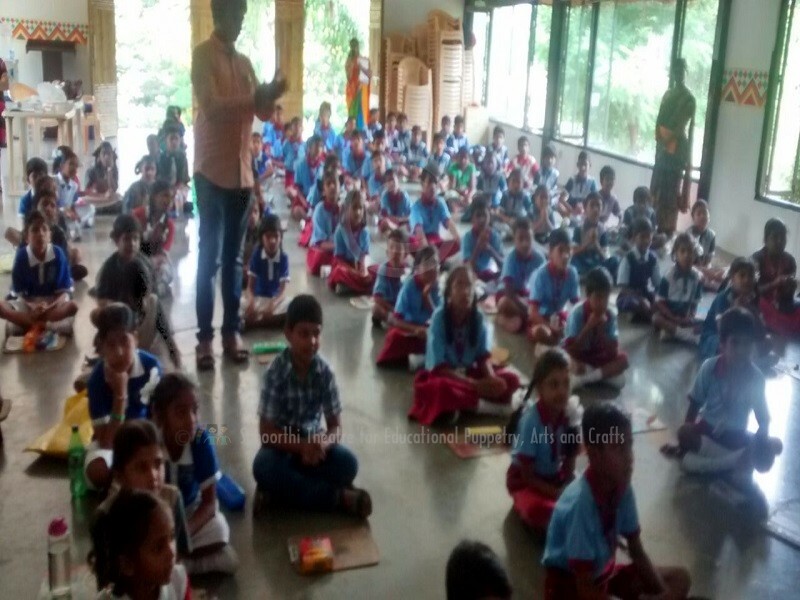 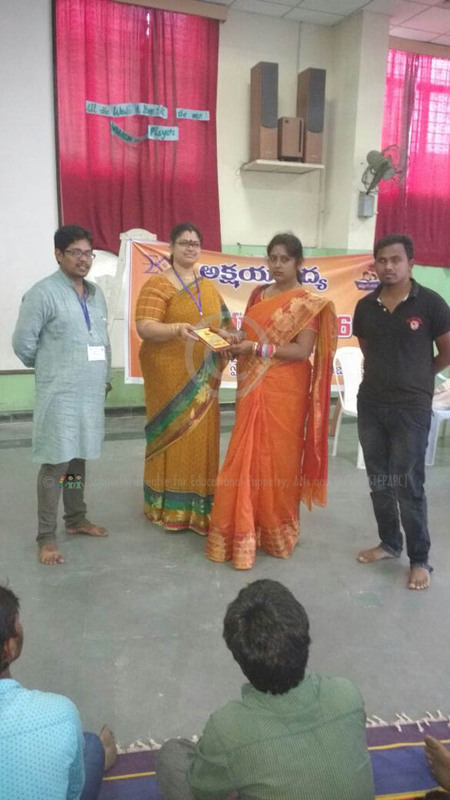 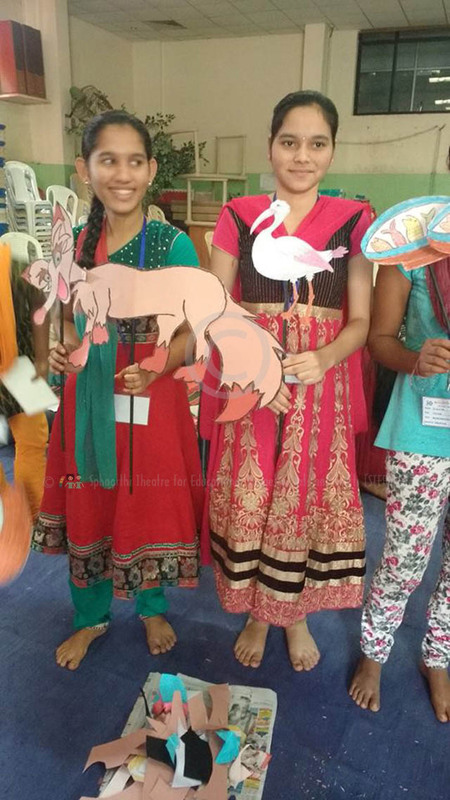 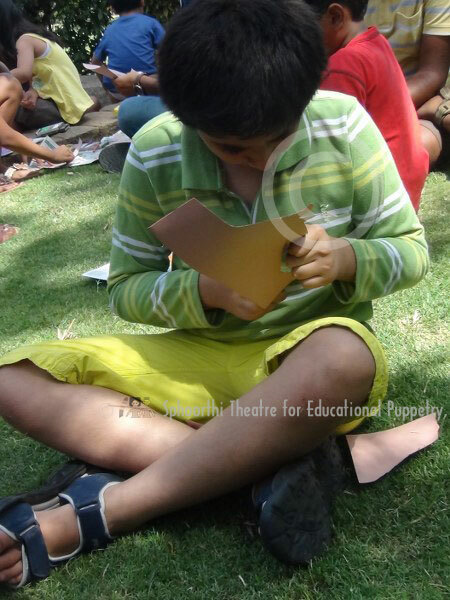 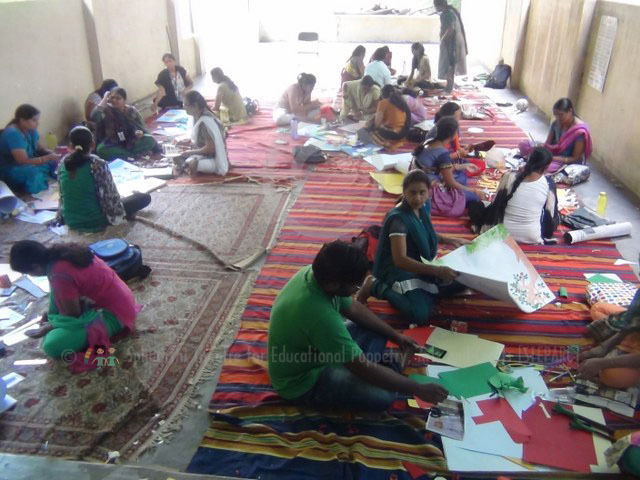 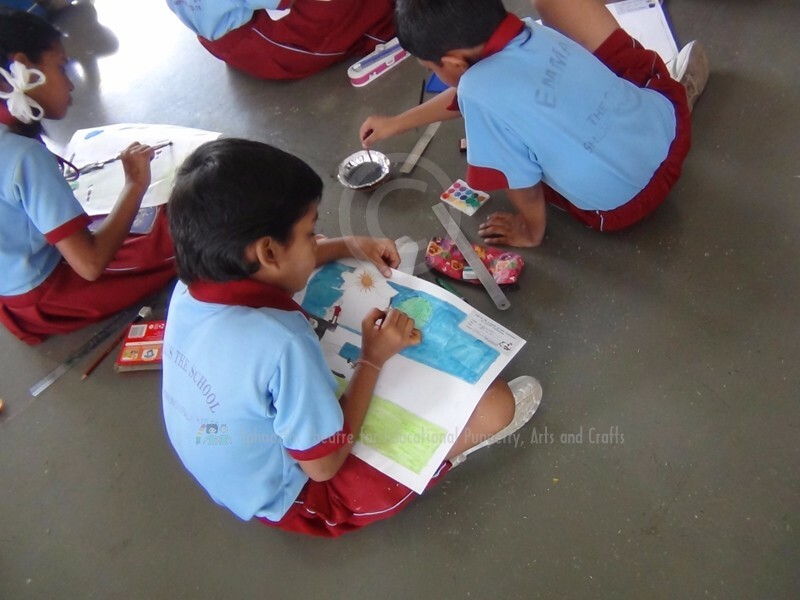 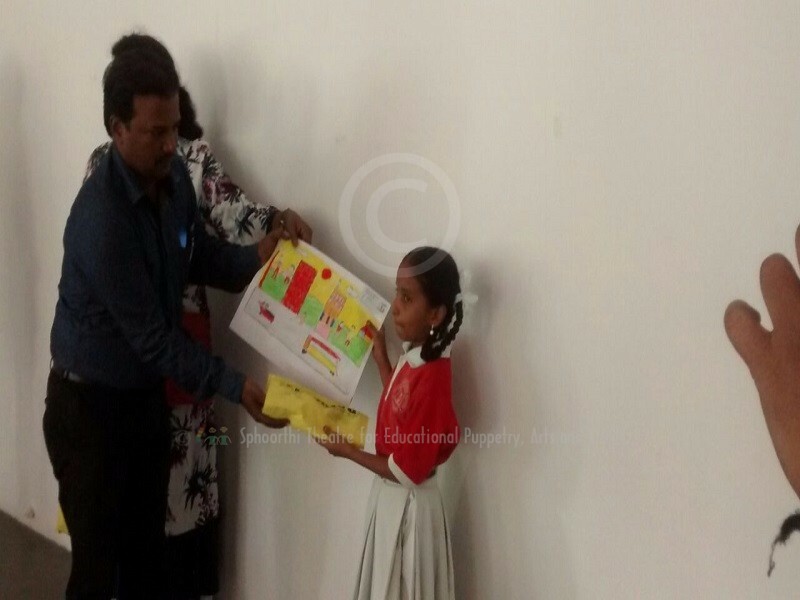 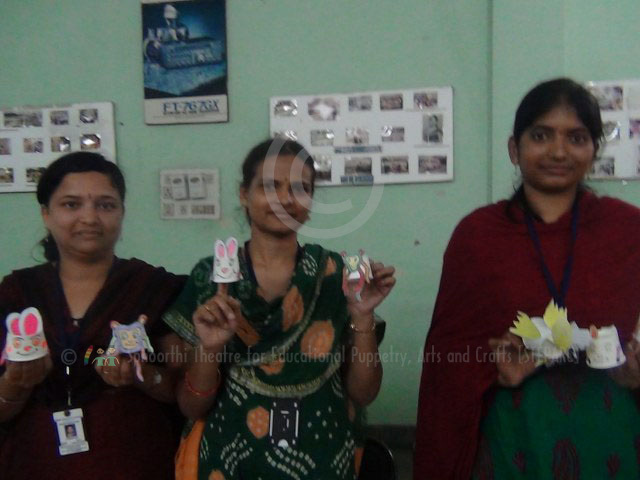 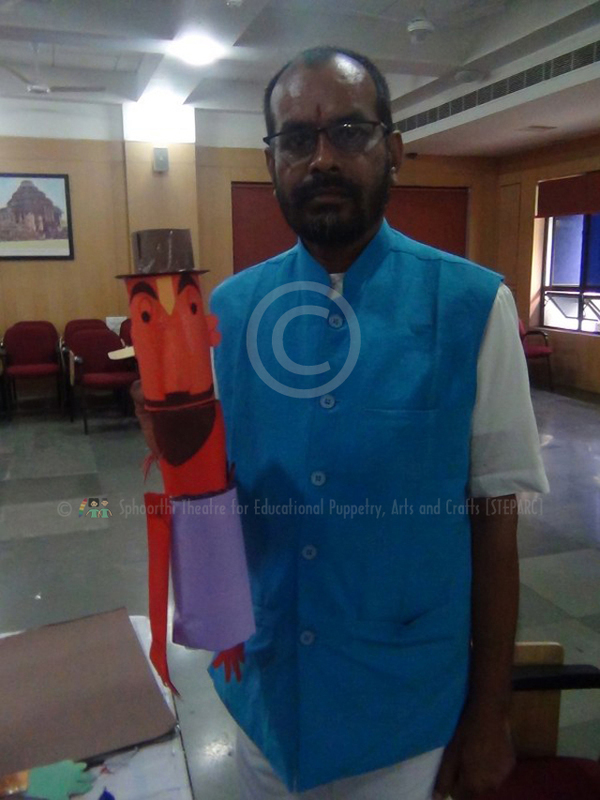 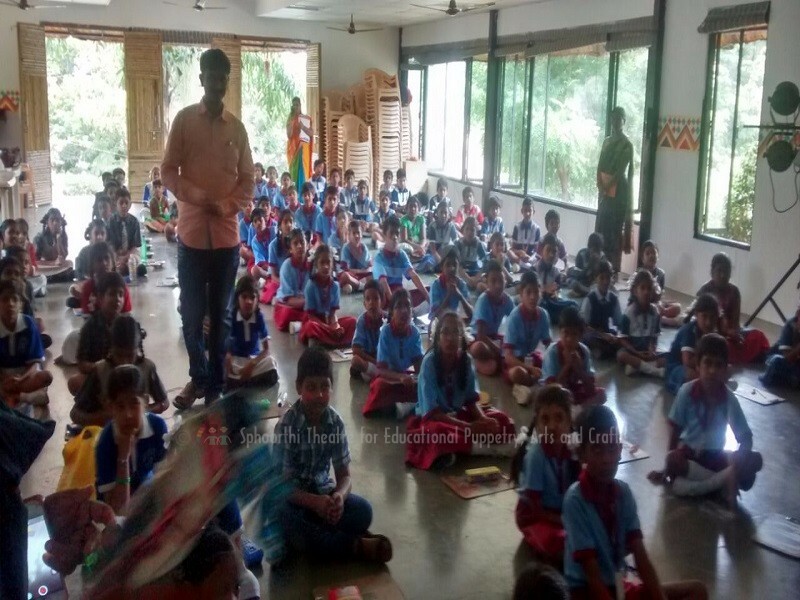 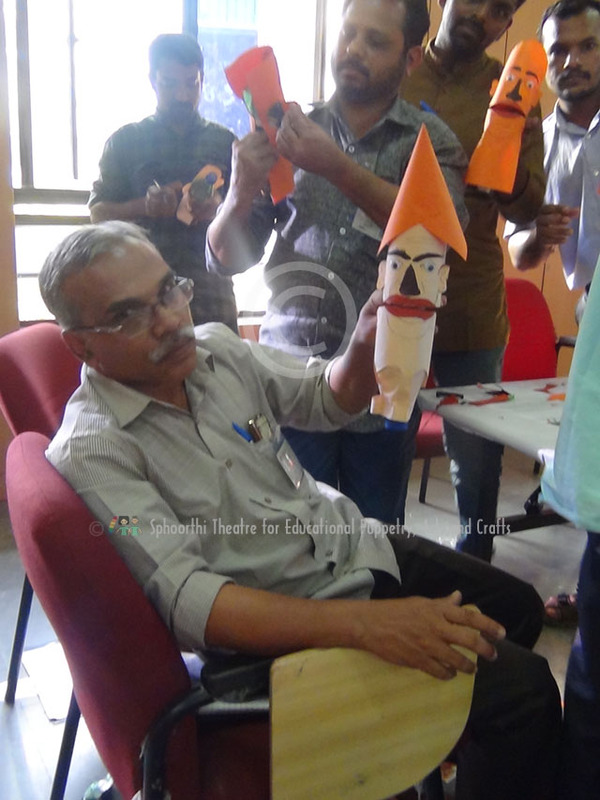 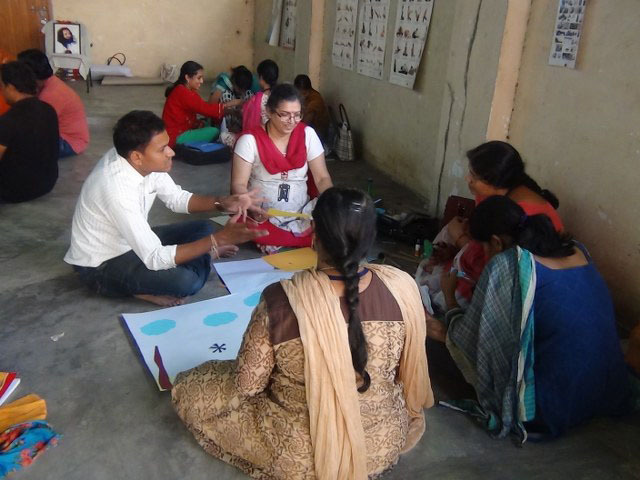 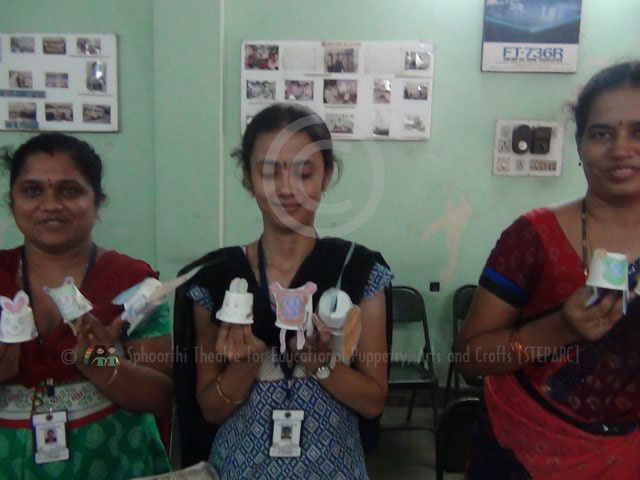 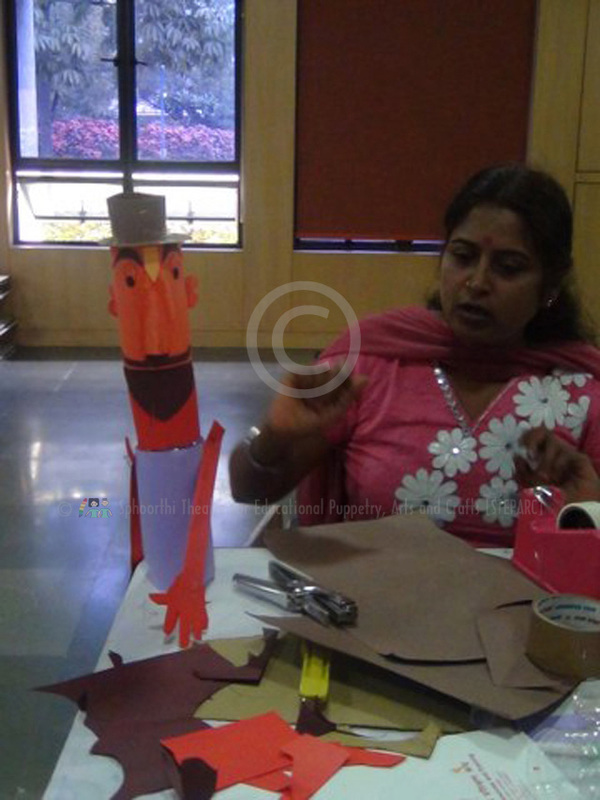 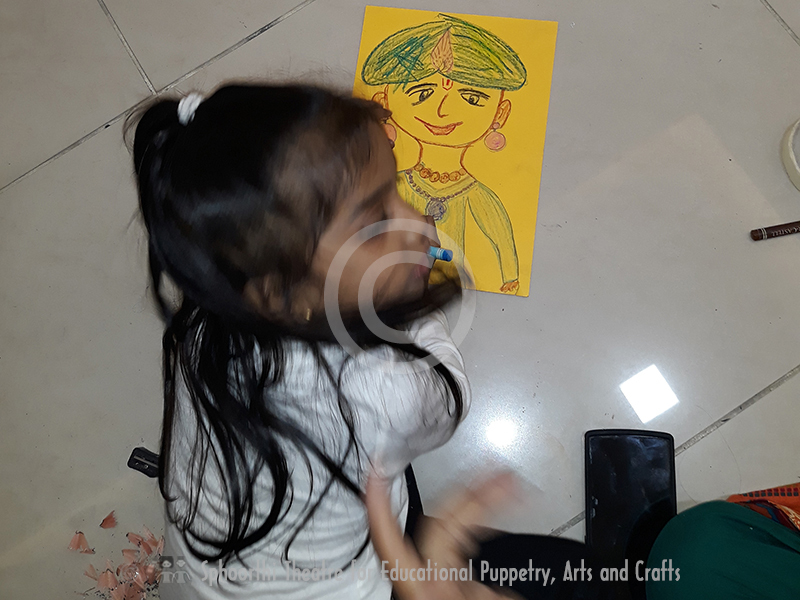 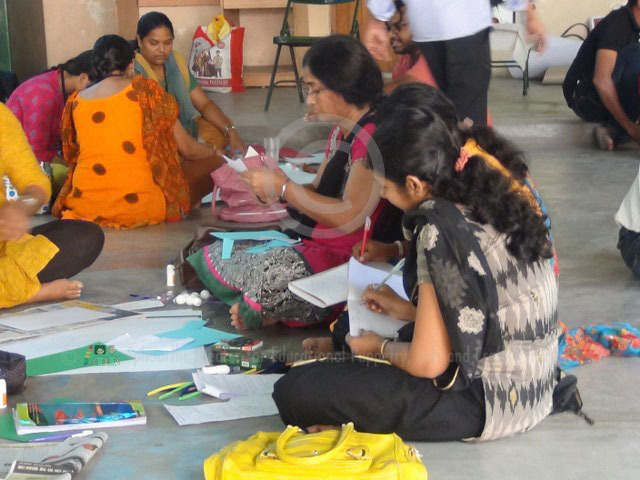 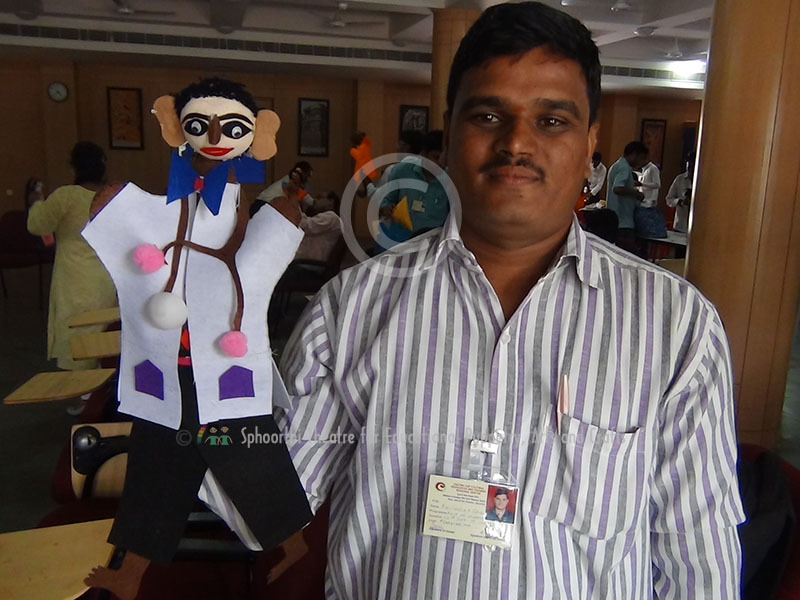 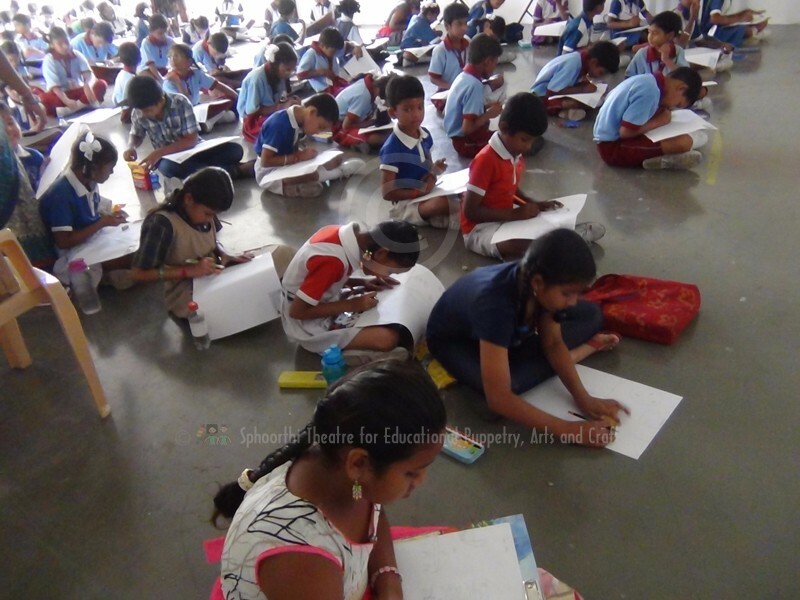 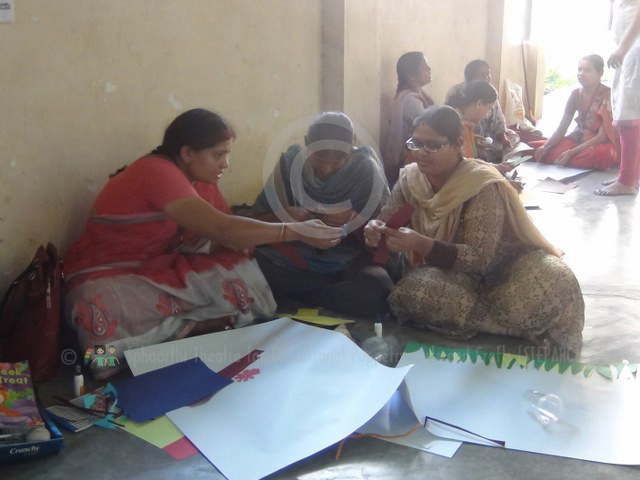 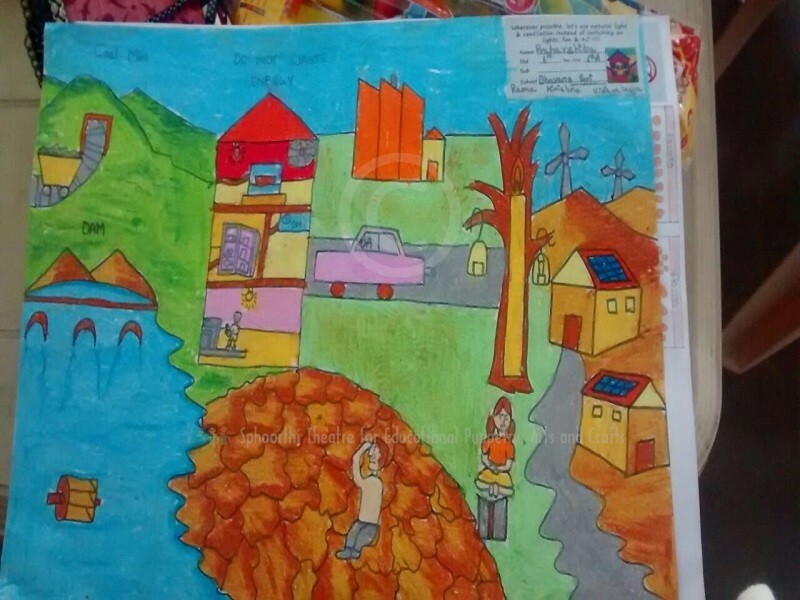 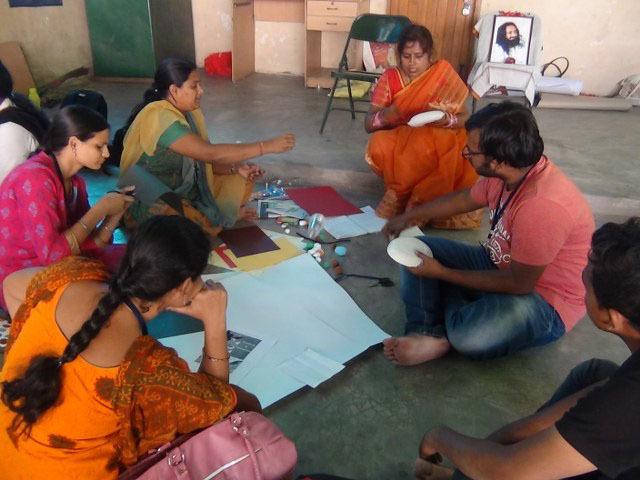 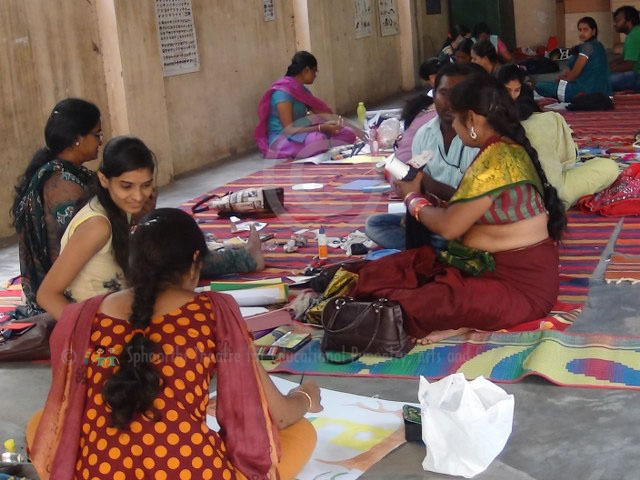 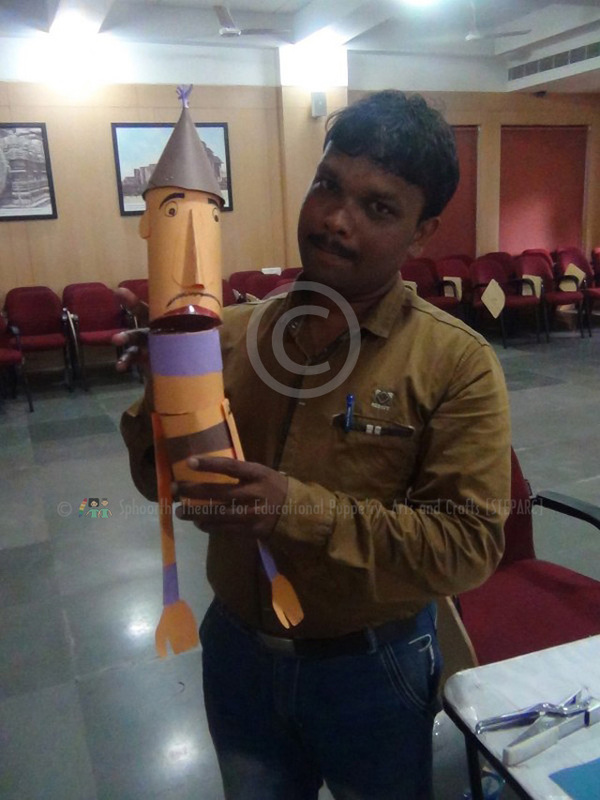 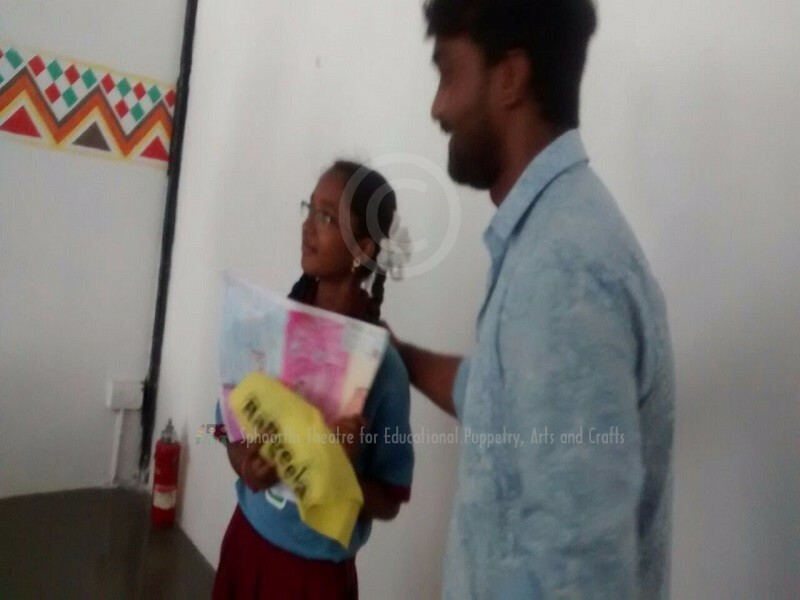 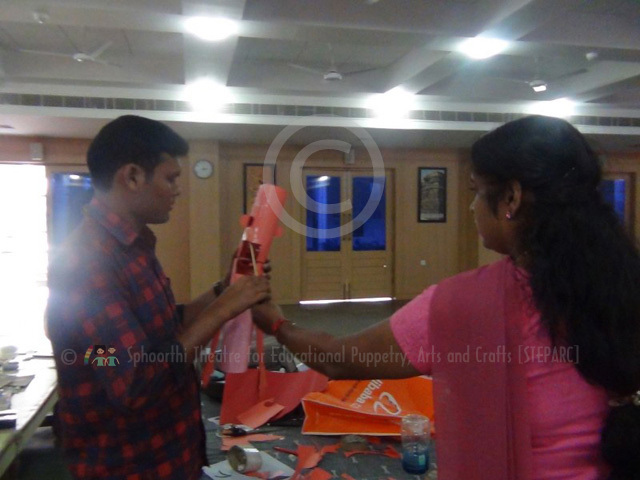 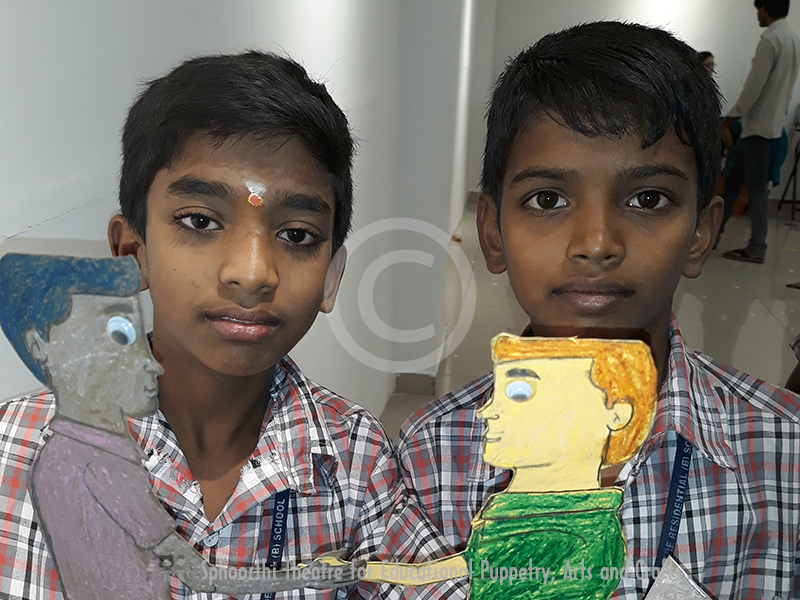 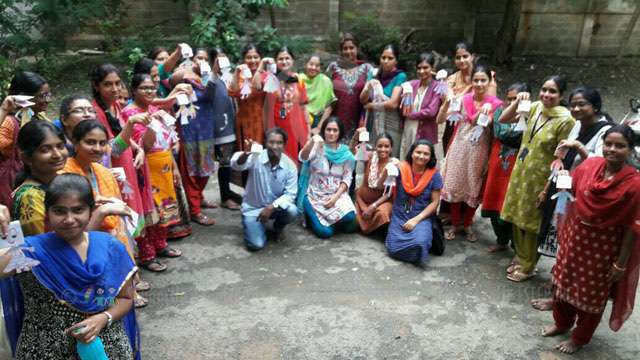 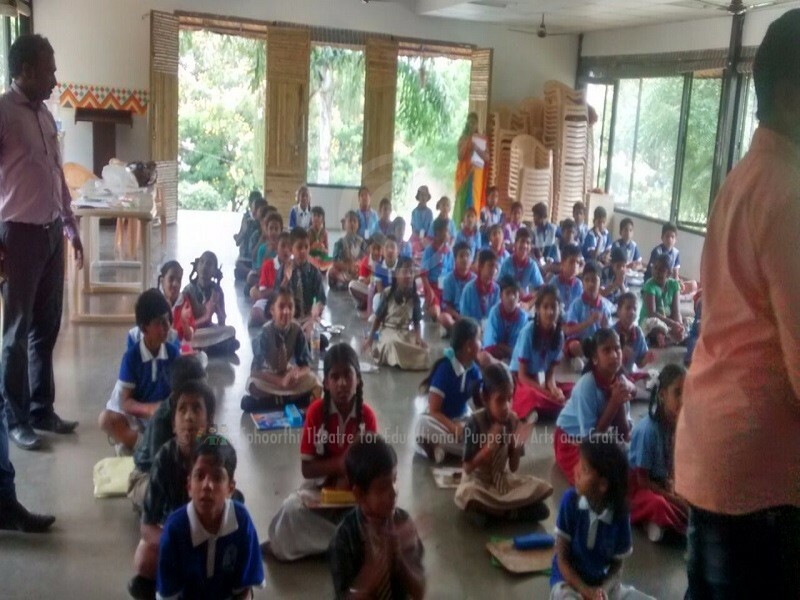 "Stick Puppet making workshop for Tutors" for Akshya Vidya - A slum Education Project of Ekalvaya Foundation Anubhuthi-2016 on Oct 4, 2016 at Kennedy High The Global School, Bachupally, Hyderabad. 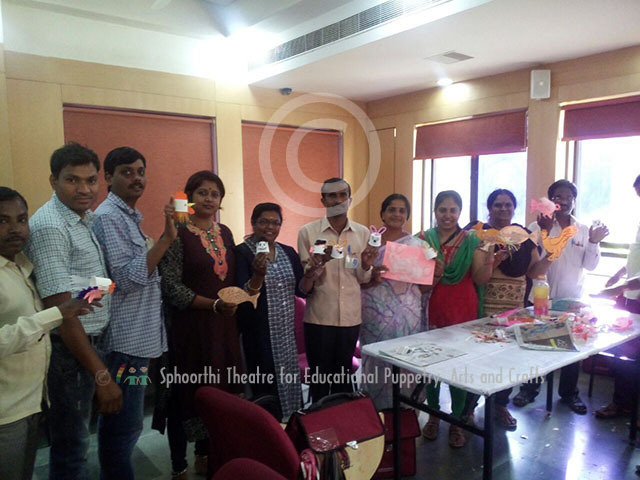 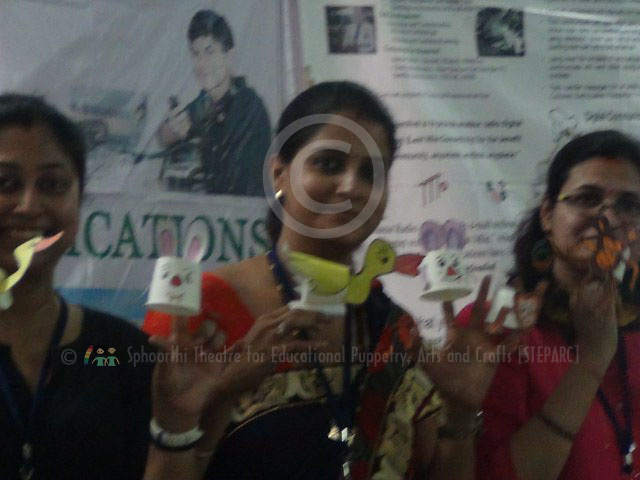 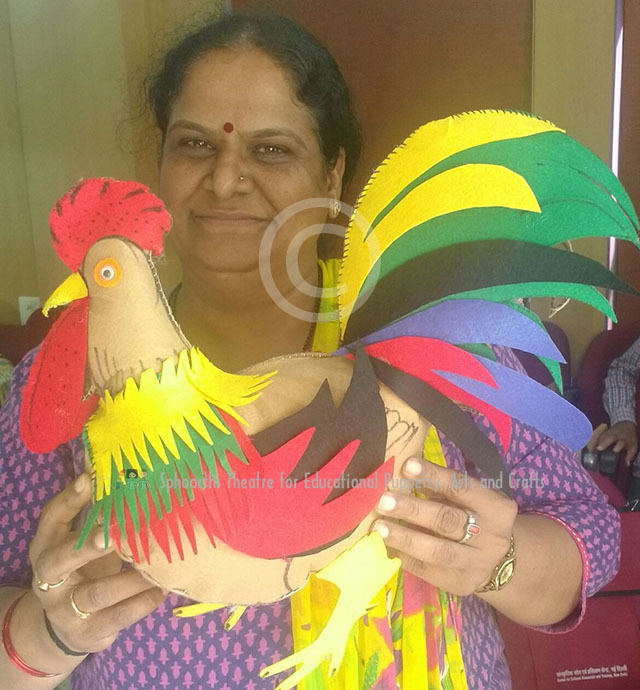 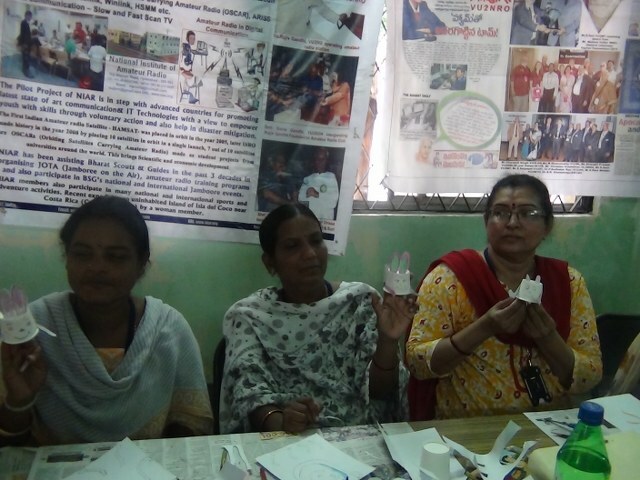 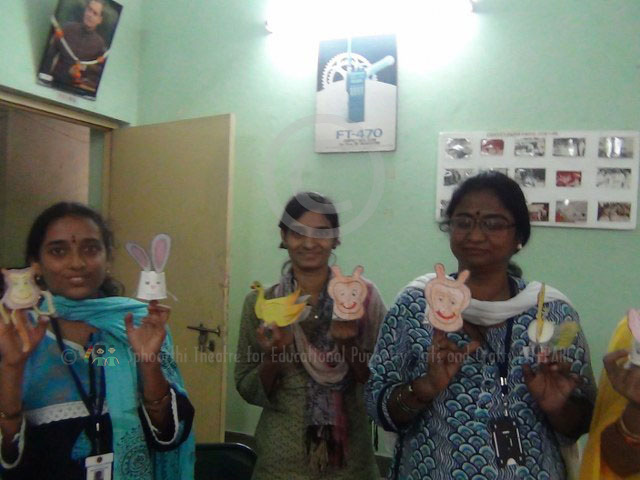 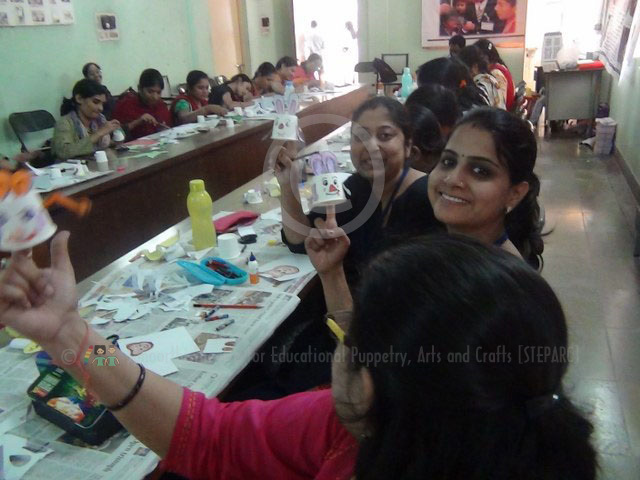 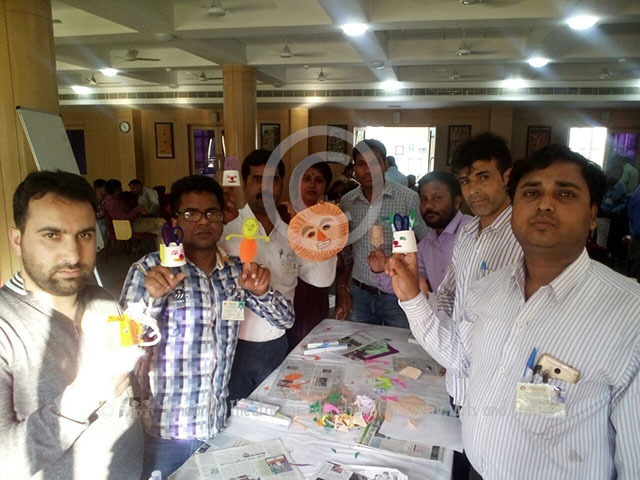 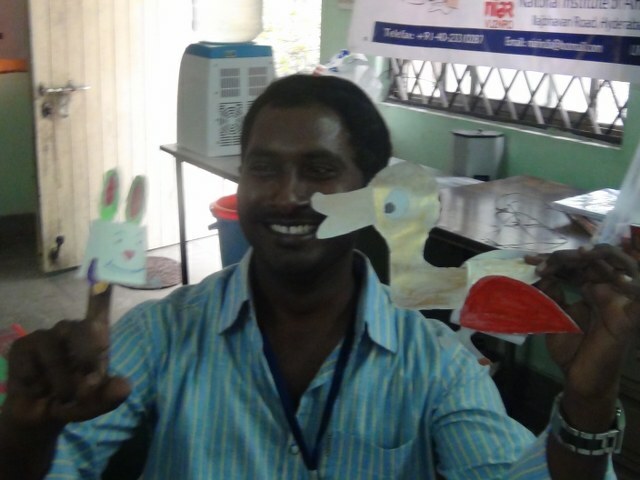 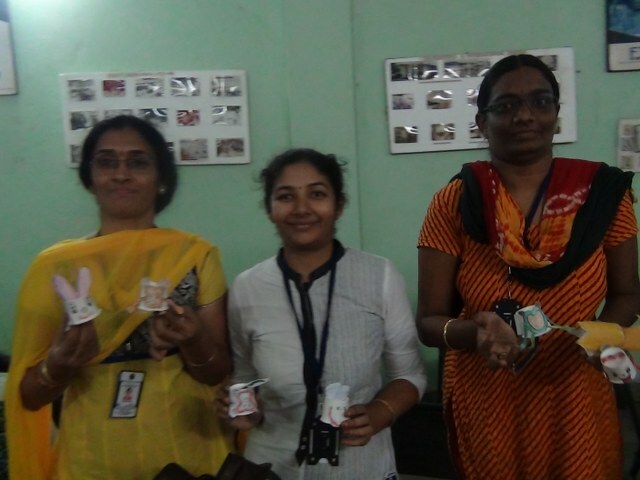 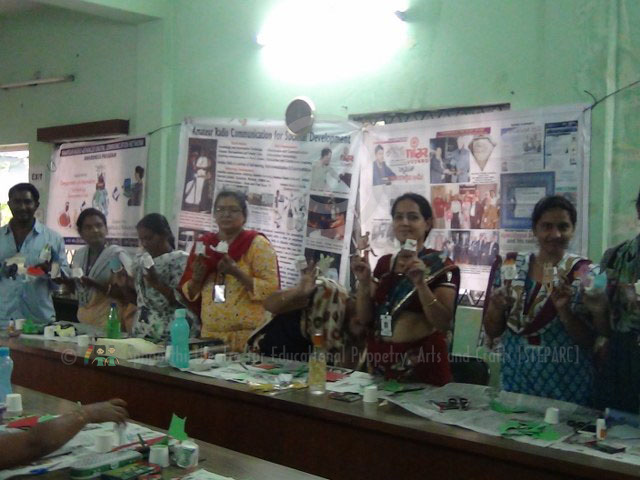 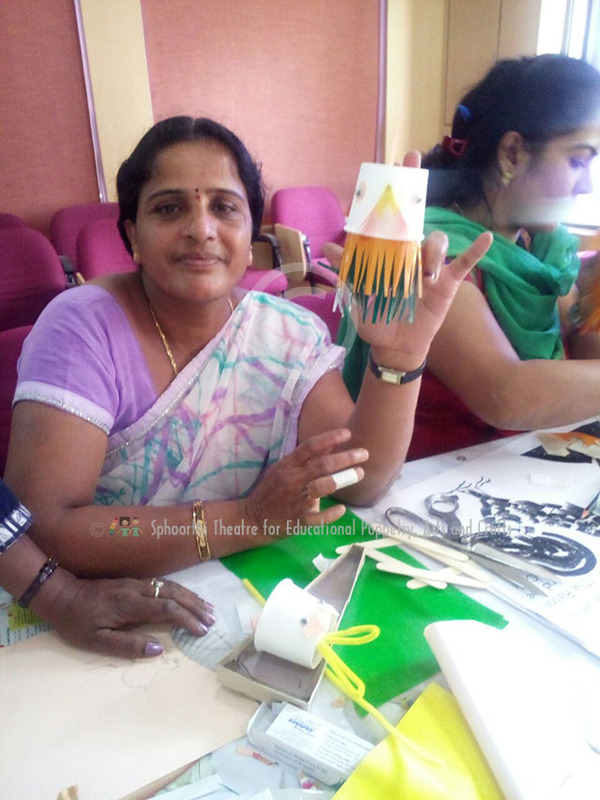 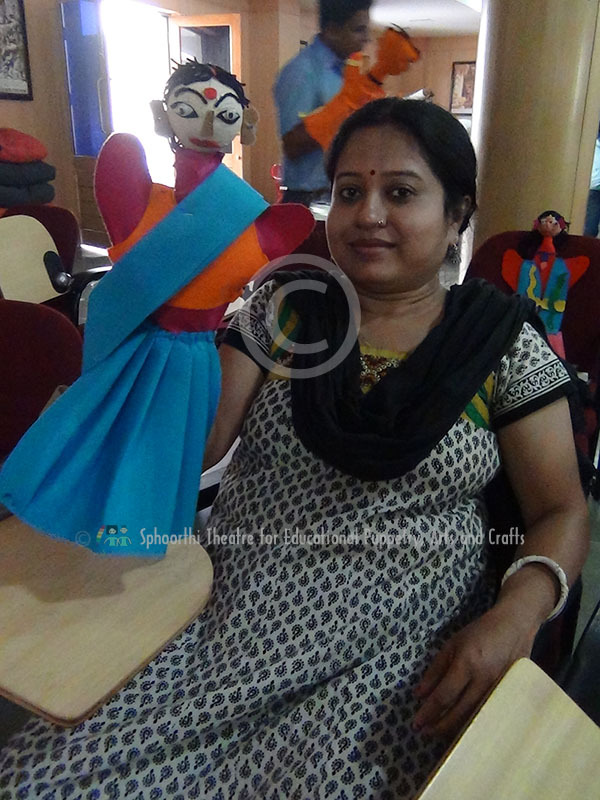 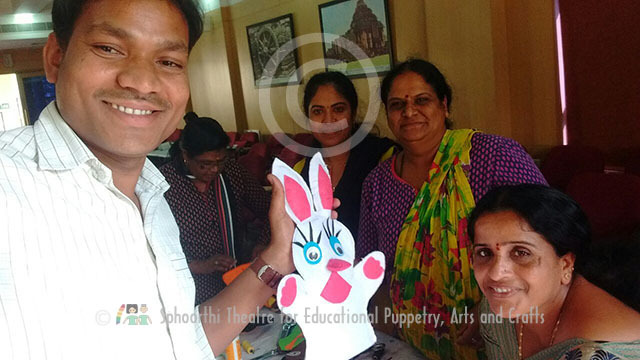 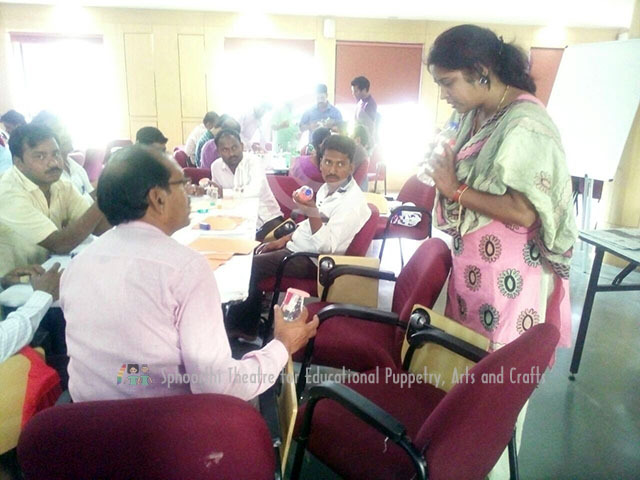 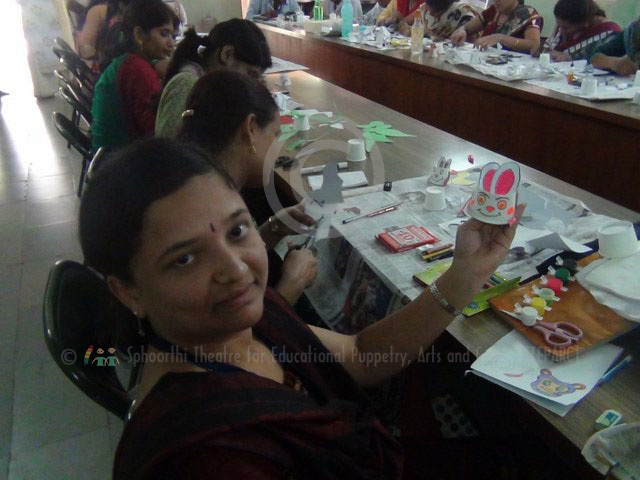 Finger Puppet making workshop for Teachers from Sept 26 - 30th, 2016 Hyderabad. 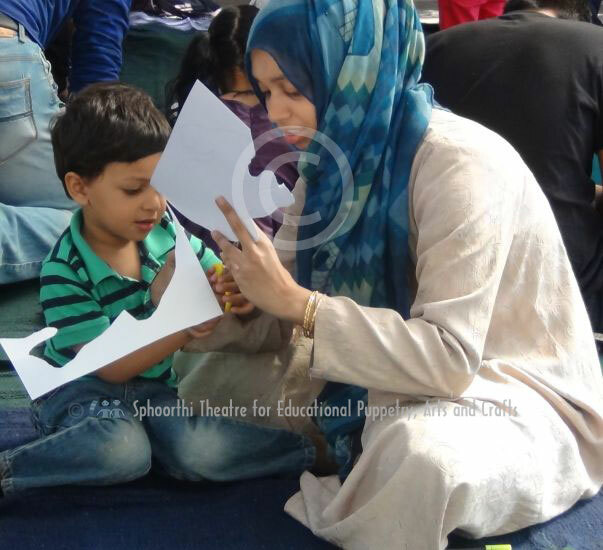 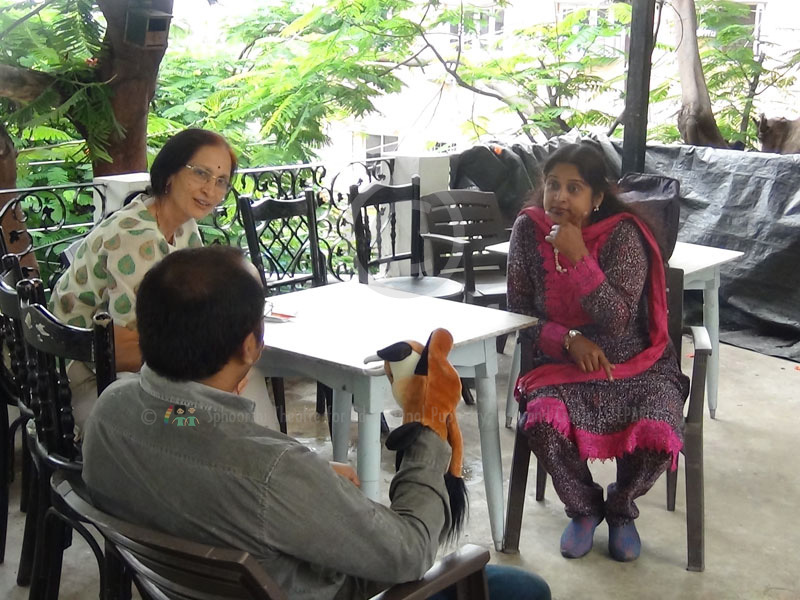 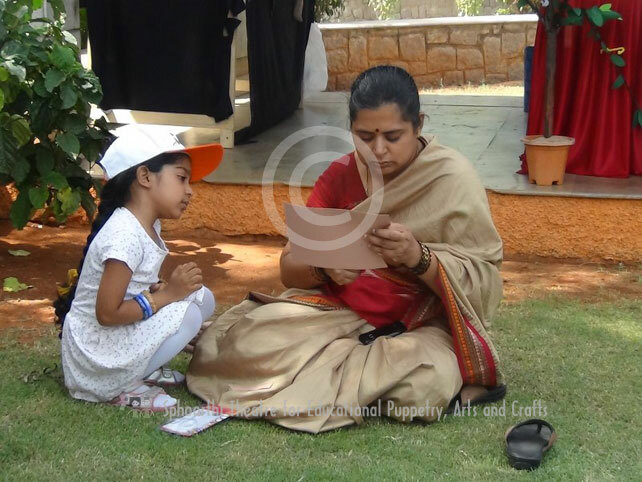 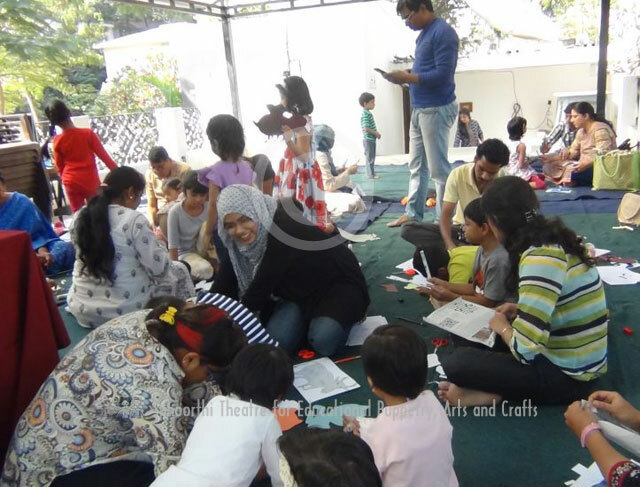 "Storytelling Meet for Parents" at Lamakaan, Road No. 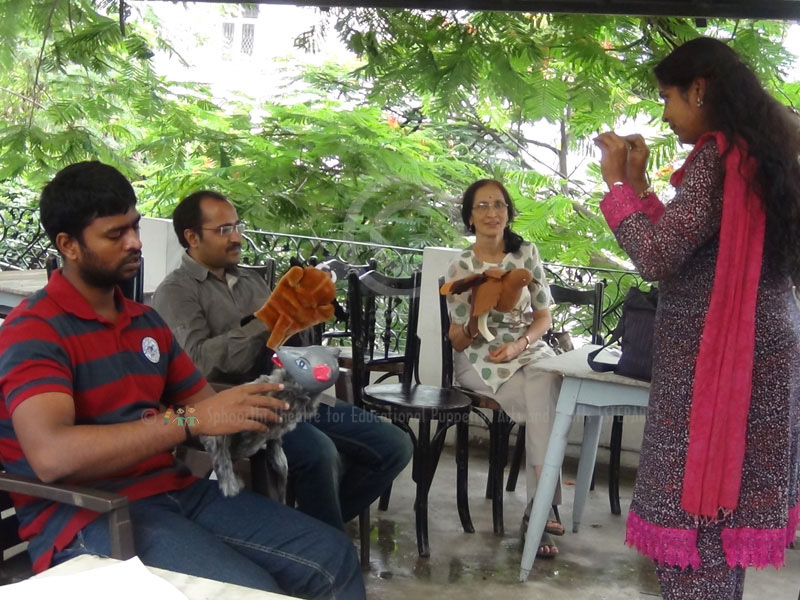 1, Banjara Hills, Hyderabad on July 10, 2016. 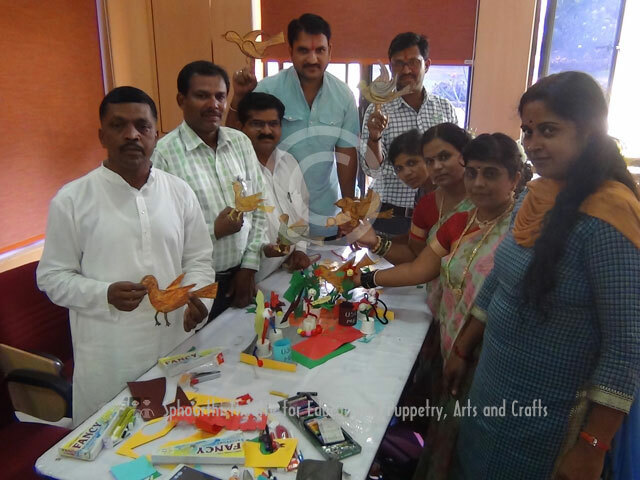 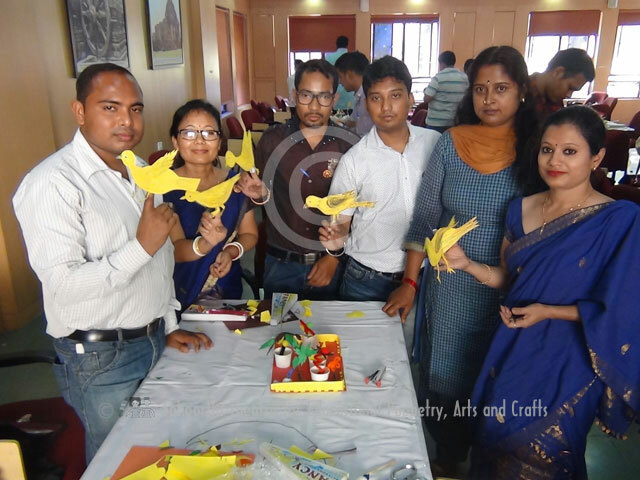 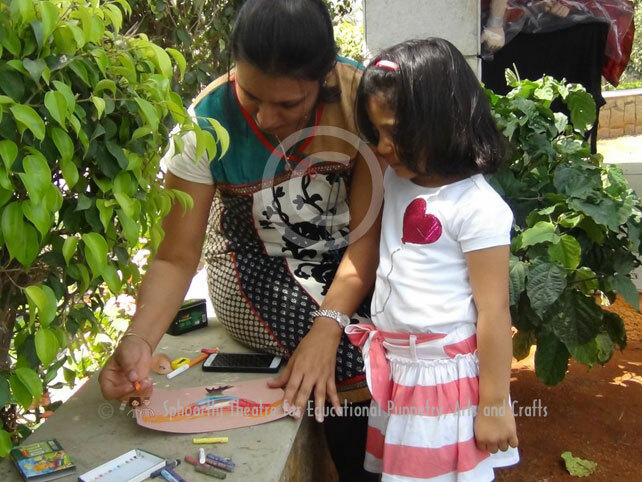 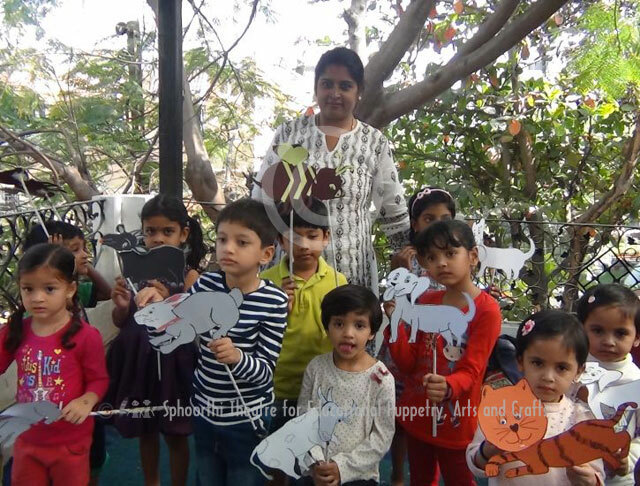 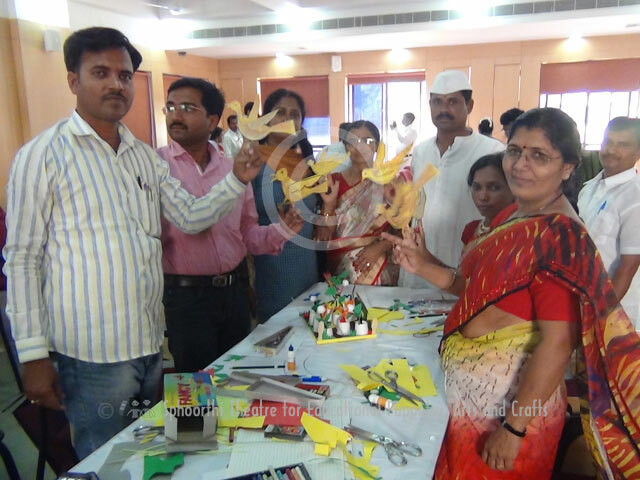 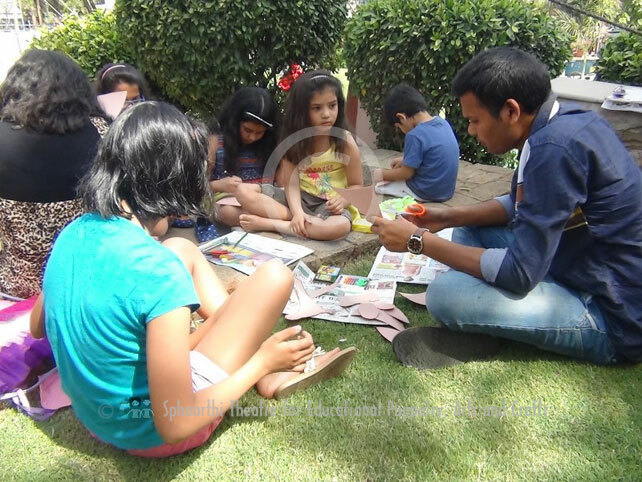 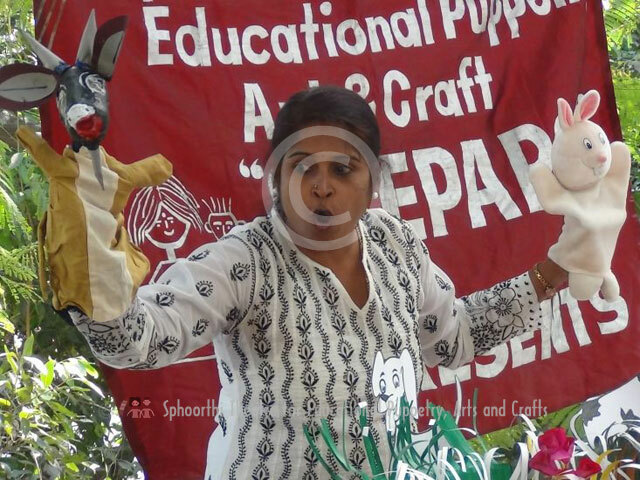 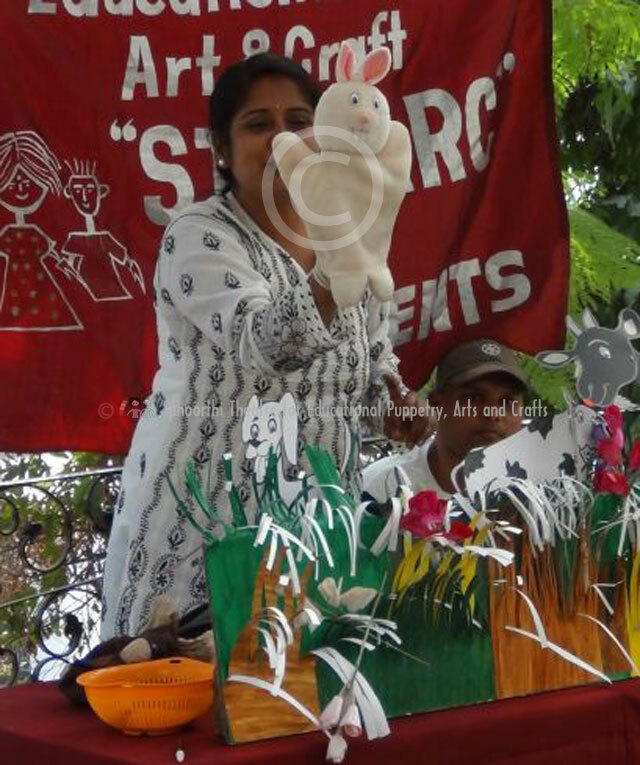 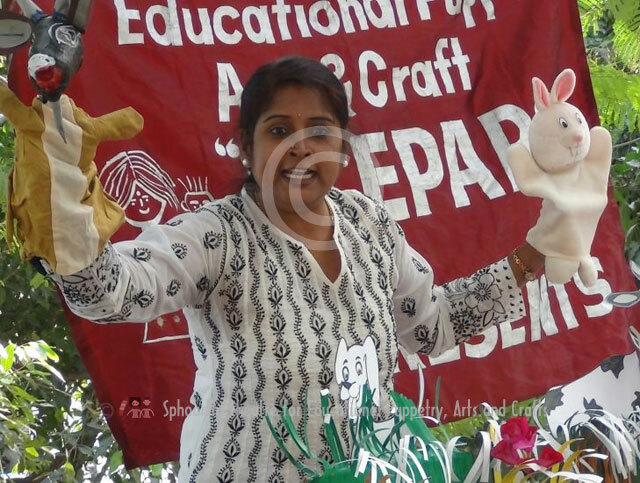 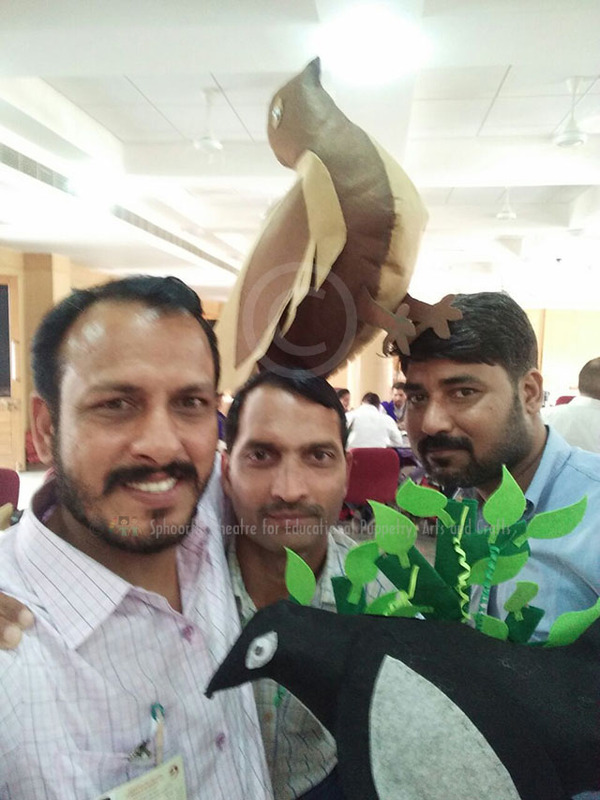 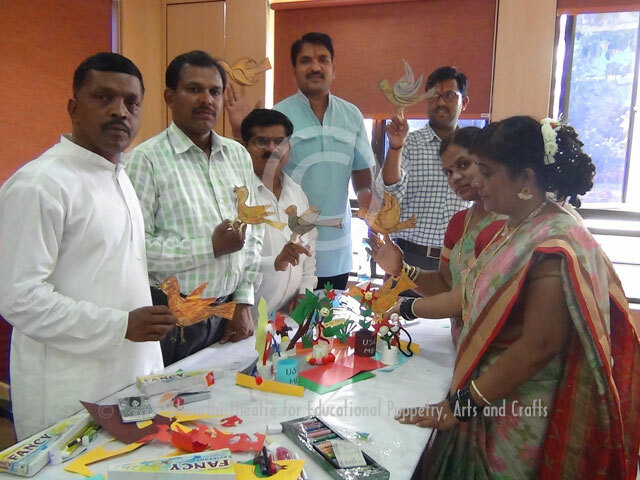 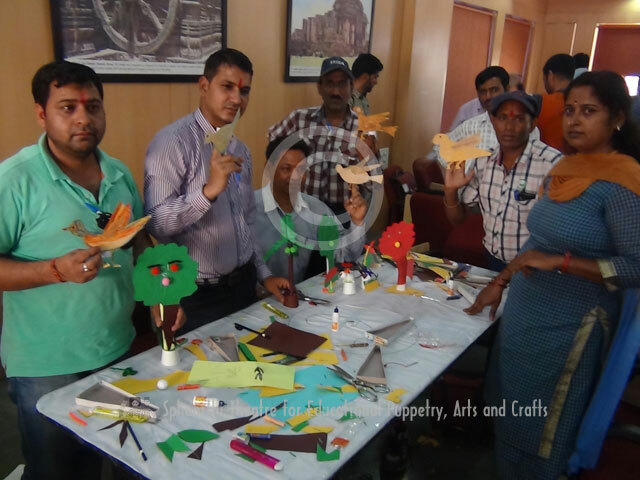 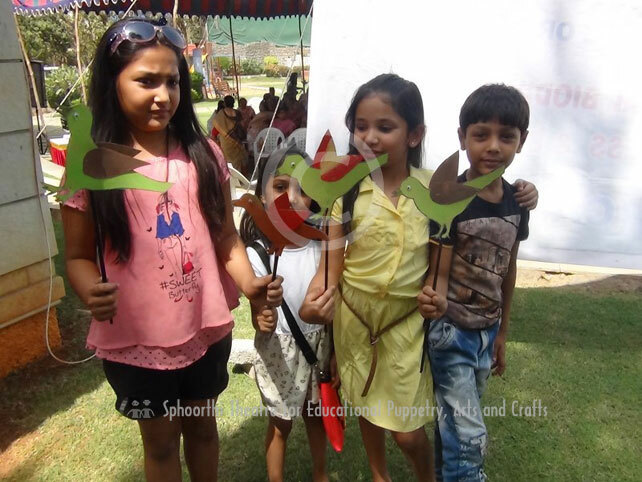 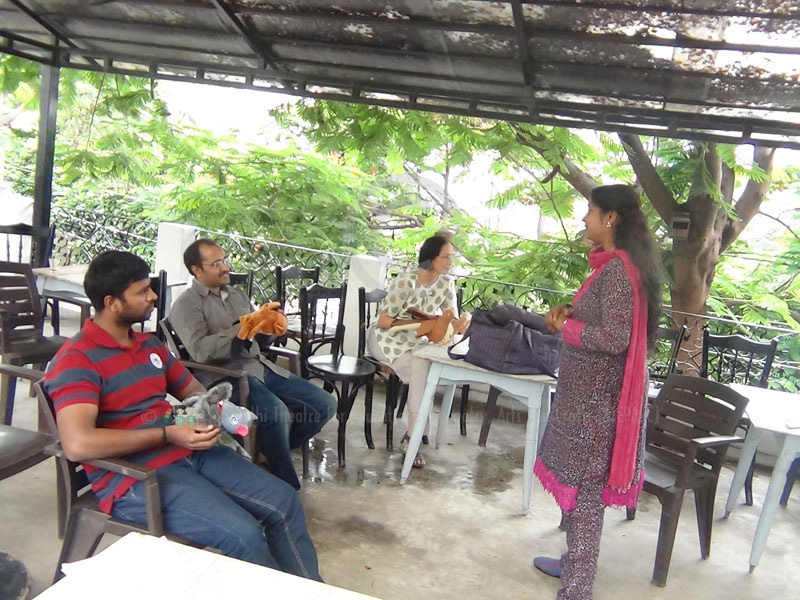 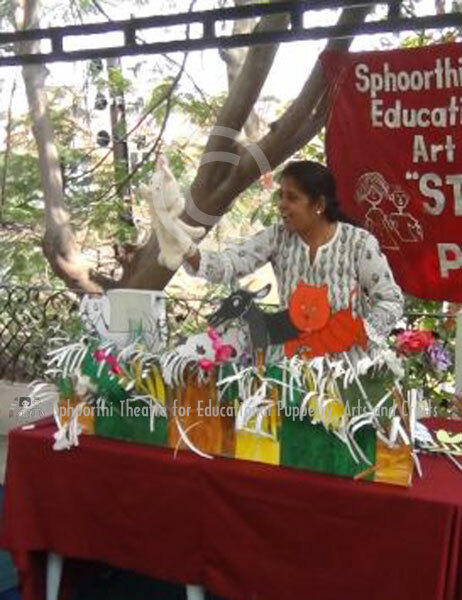 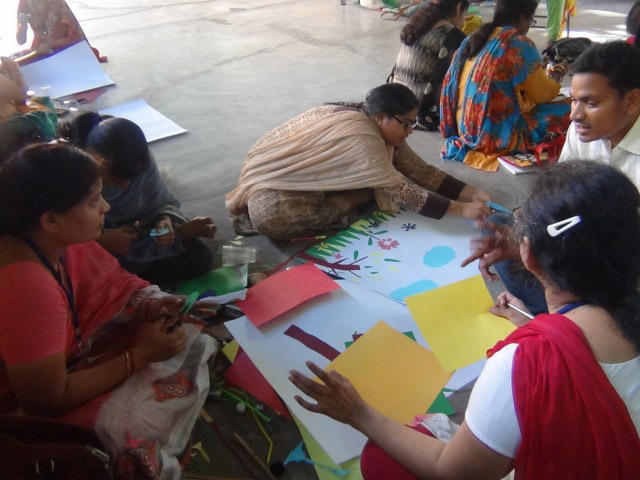 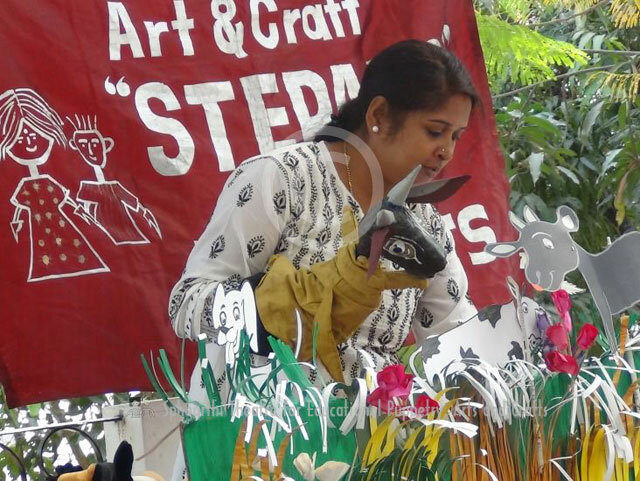 On the occasion of World Sparrow Day March 20, 2016 Stick Puppet making Workshop "Return of Sparrows" for Citizens’ Action for Local Biodiversity Awareness and Conservation-CALBAC organization At Ambience Fort, Attapur, Hyderabad. 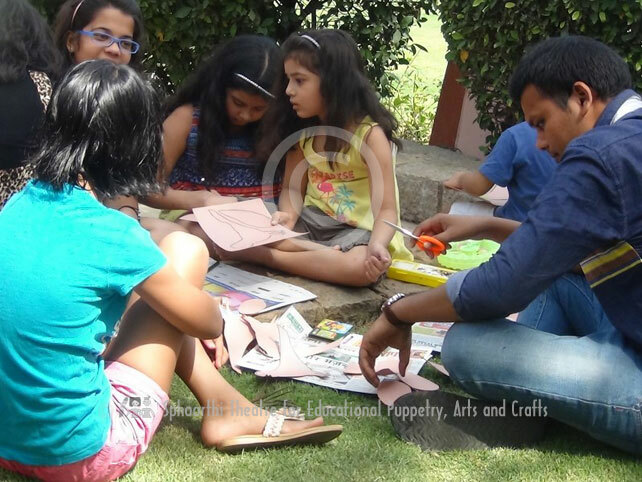 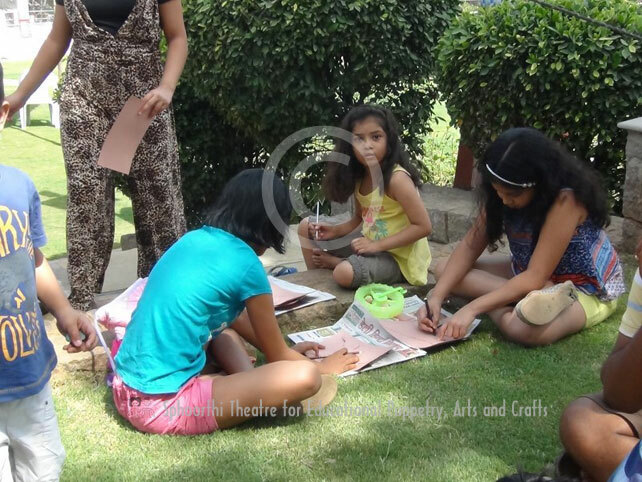 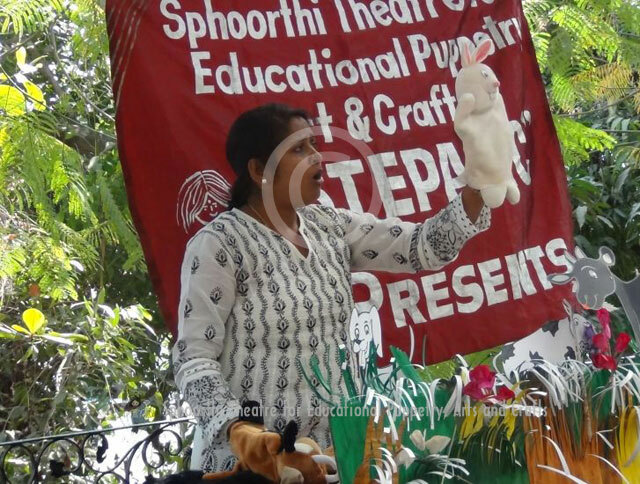 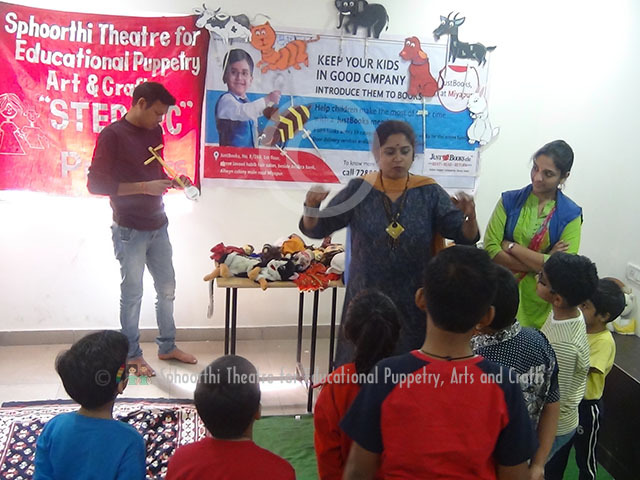 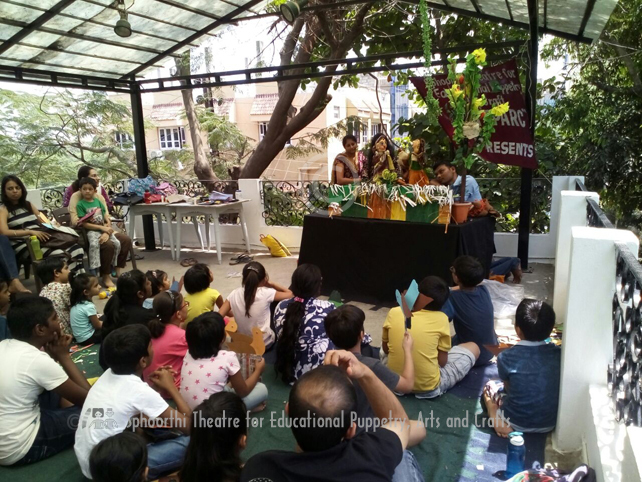 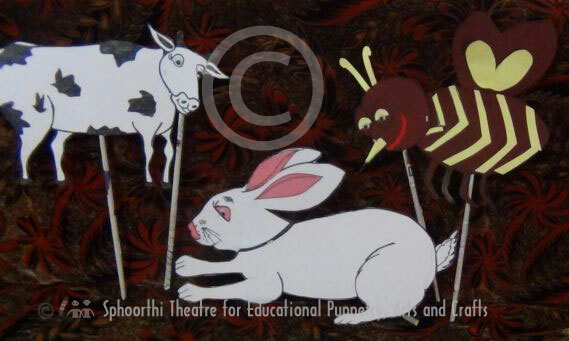 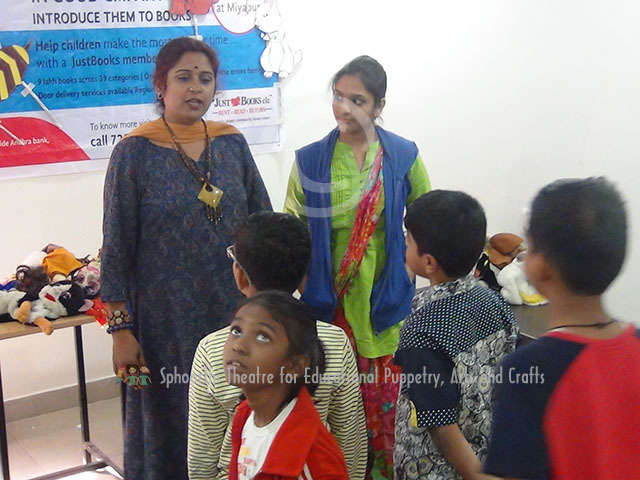 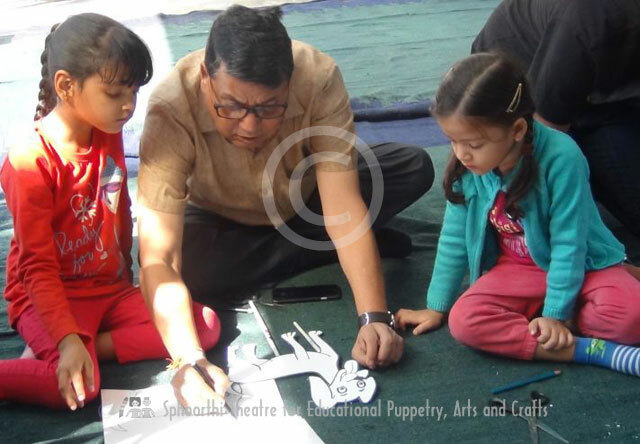 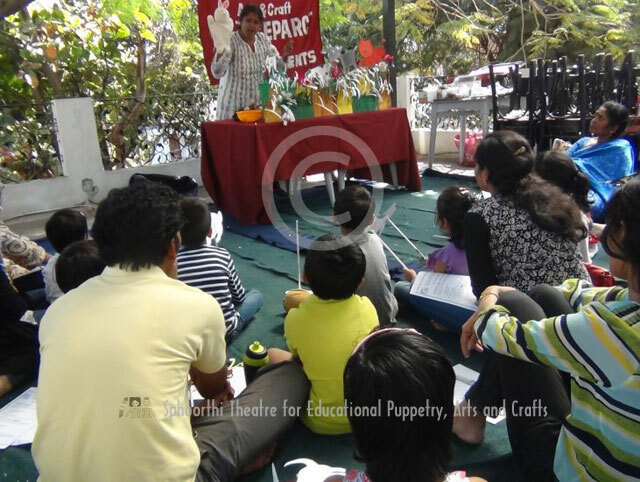 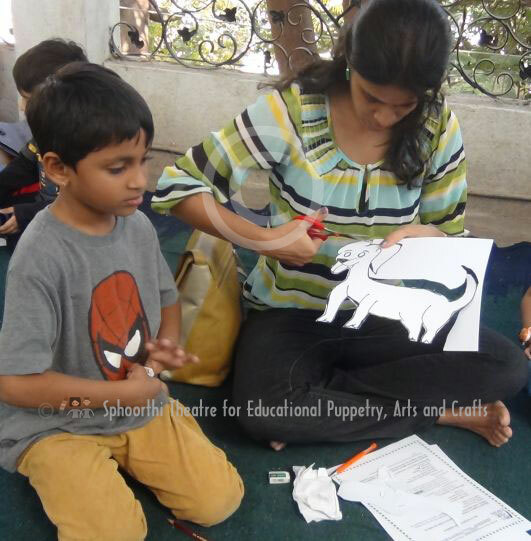 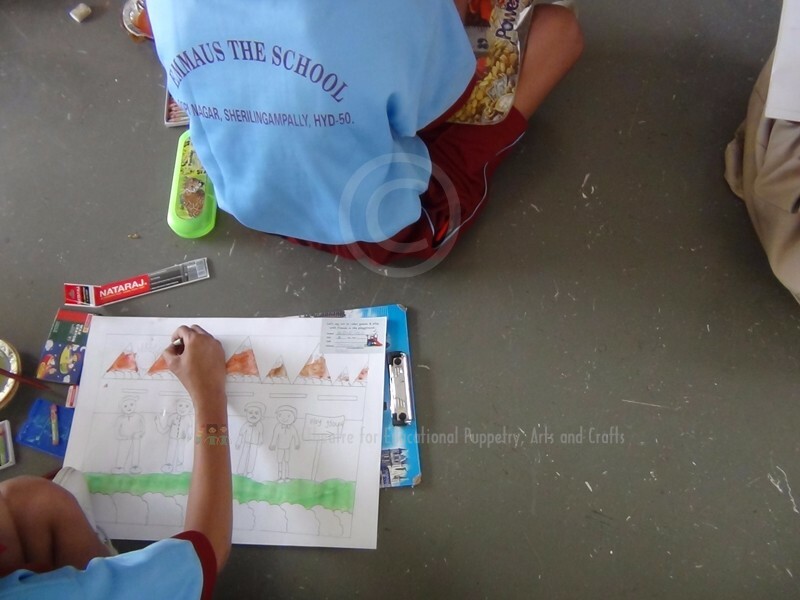 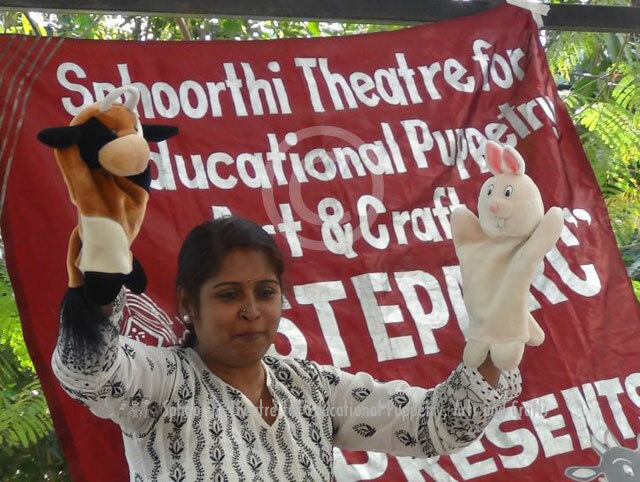 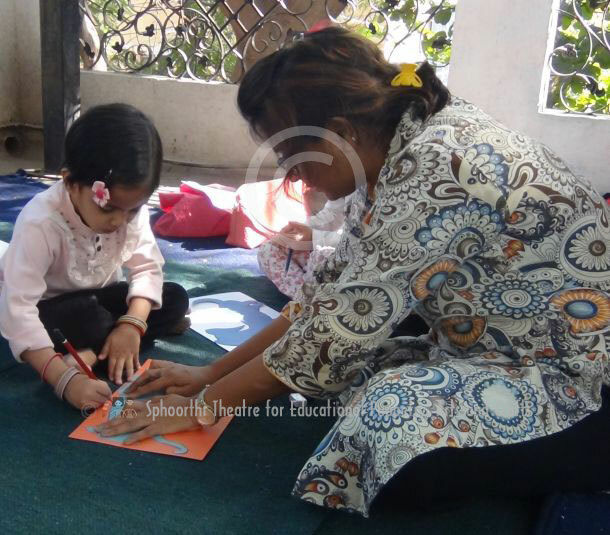 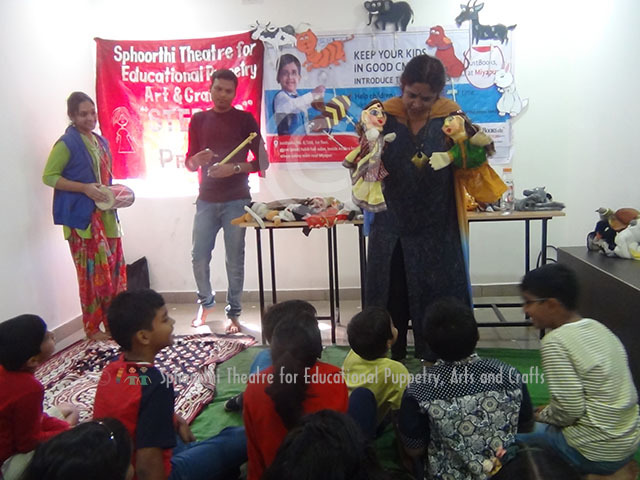 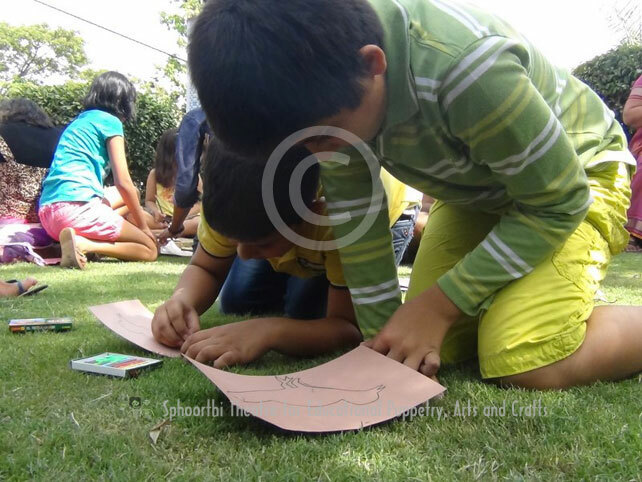 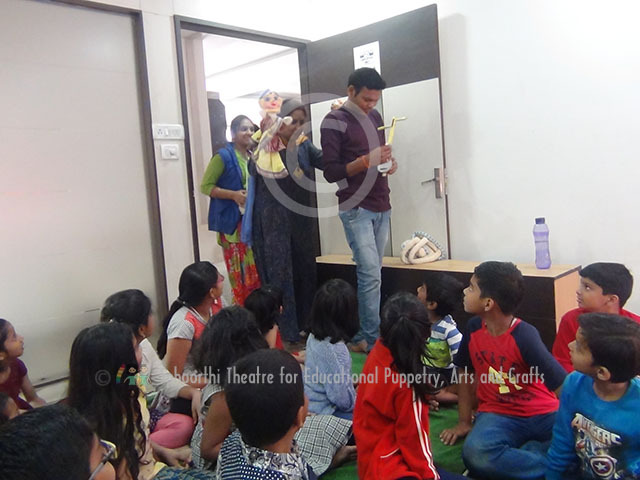 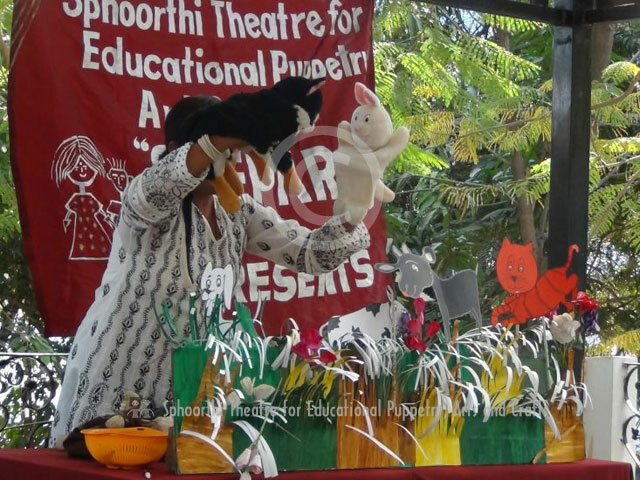 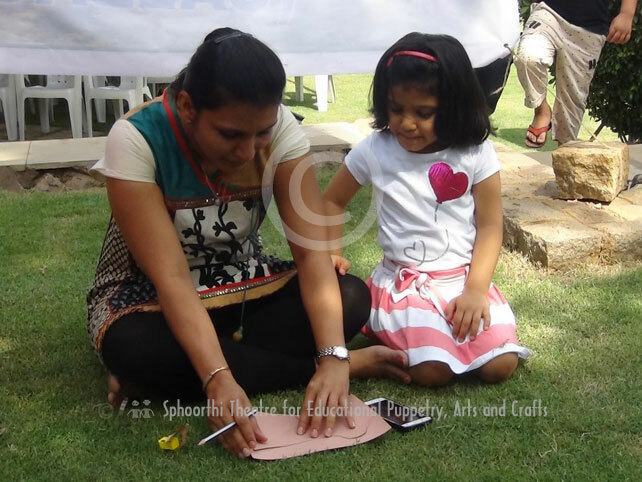 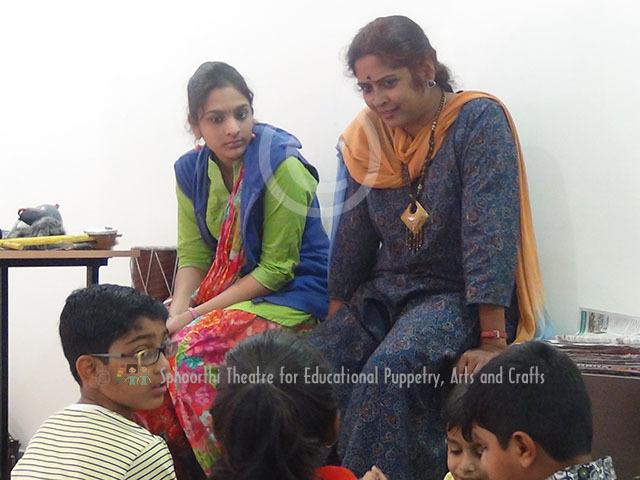 Storytelling and Puppet making workshop on "Lily the Rabbit and Mr. 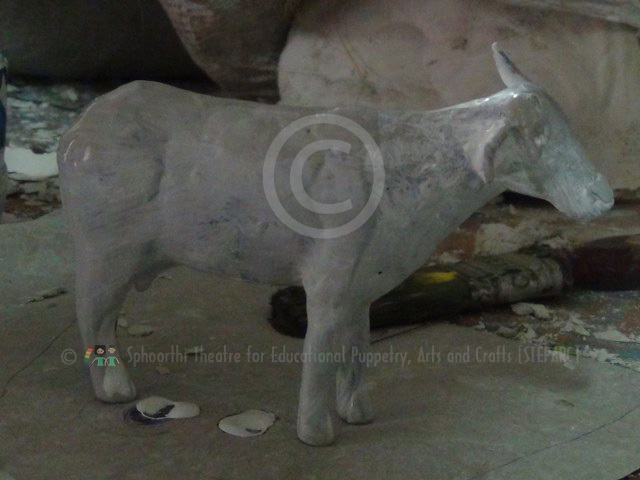 Goat" at Lamakaan on January 2, 2016.